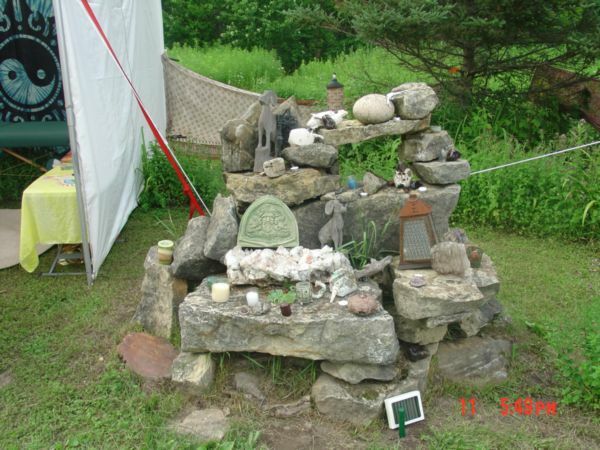 Click image to enlarge, then mouse to center-right of image and click for next one! 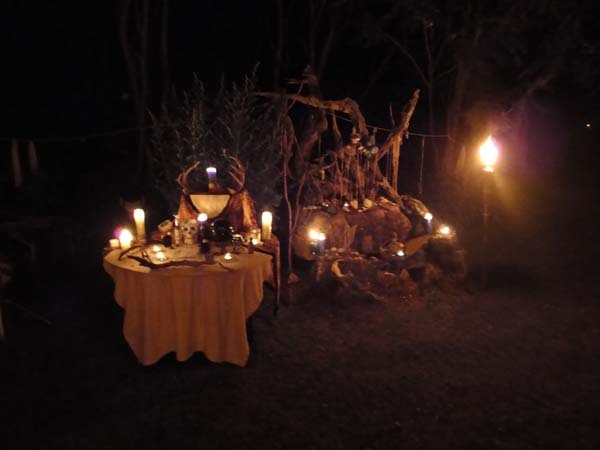 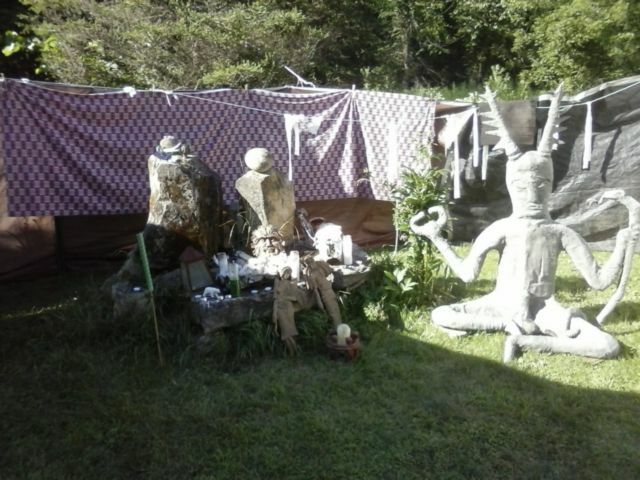 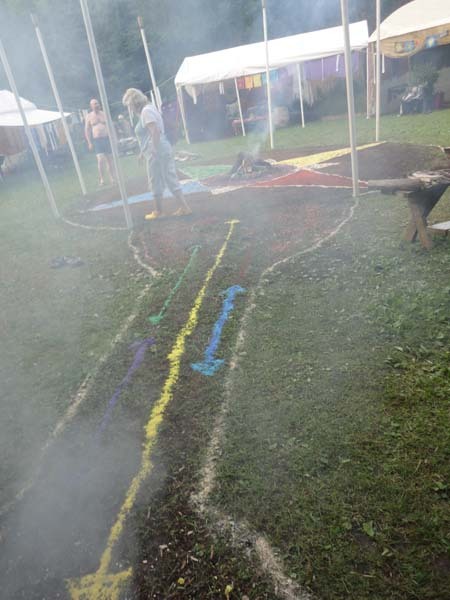 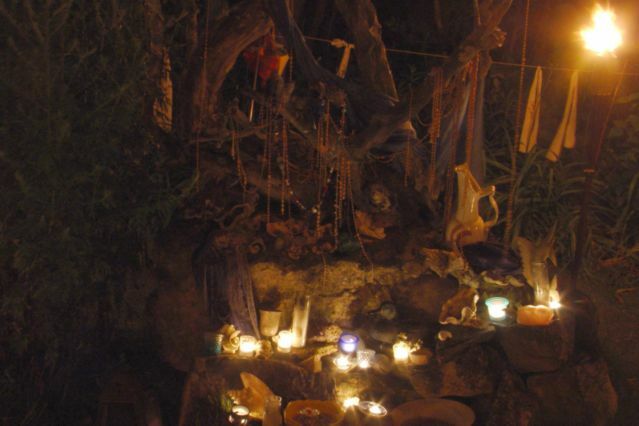 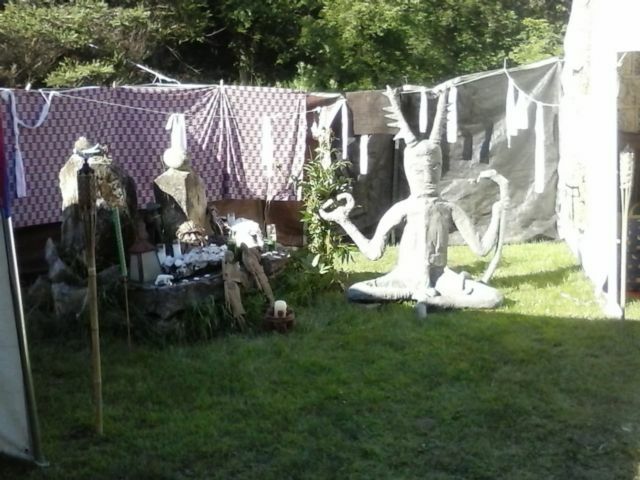 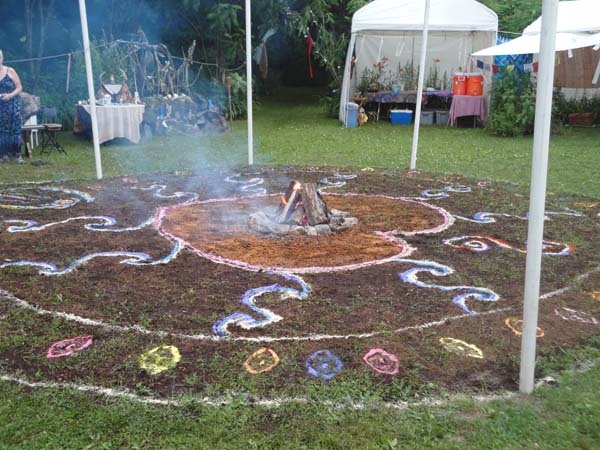 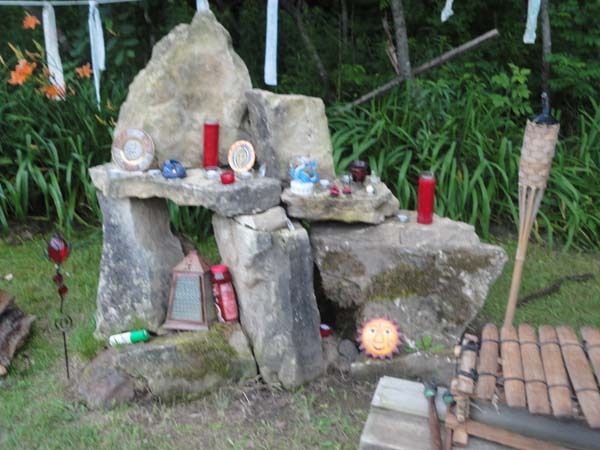 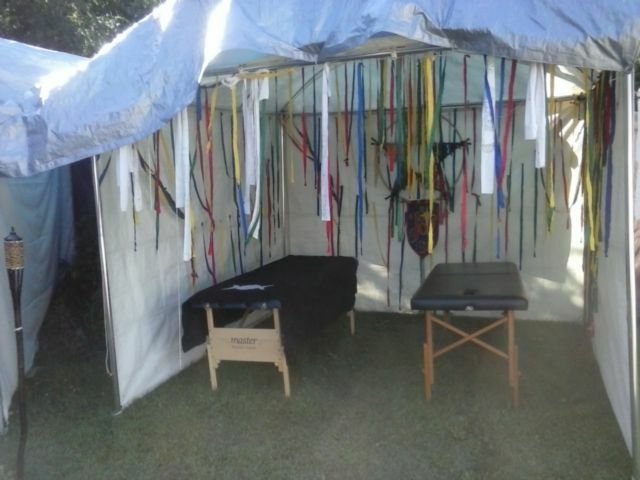 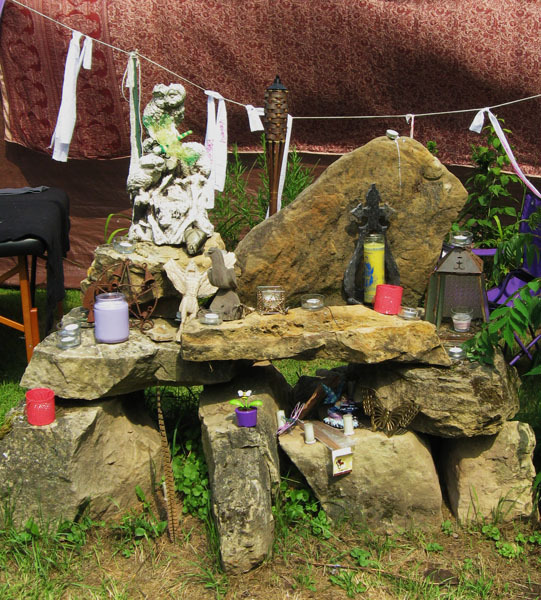 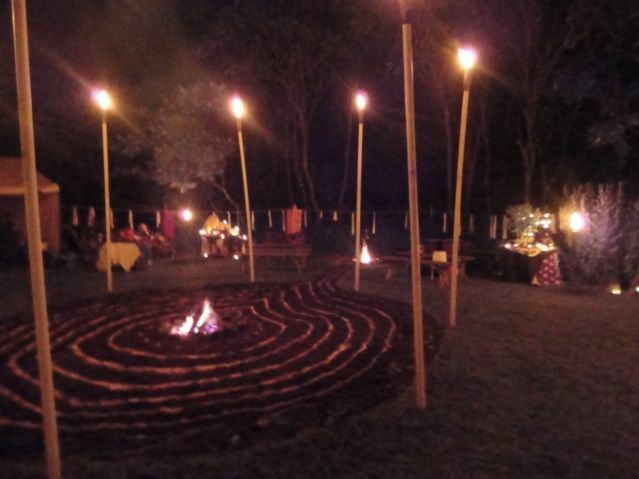 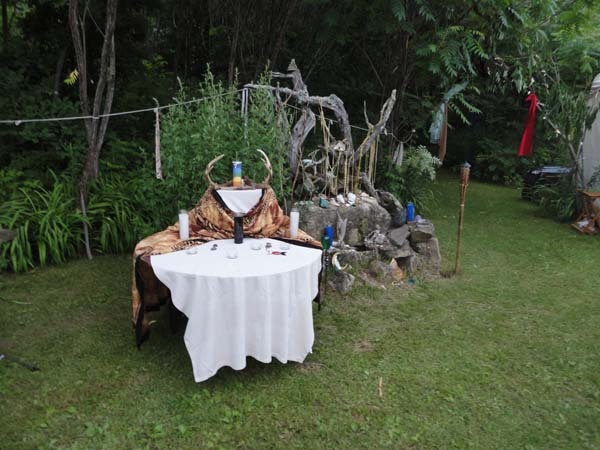 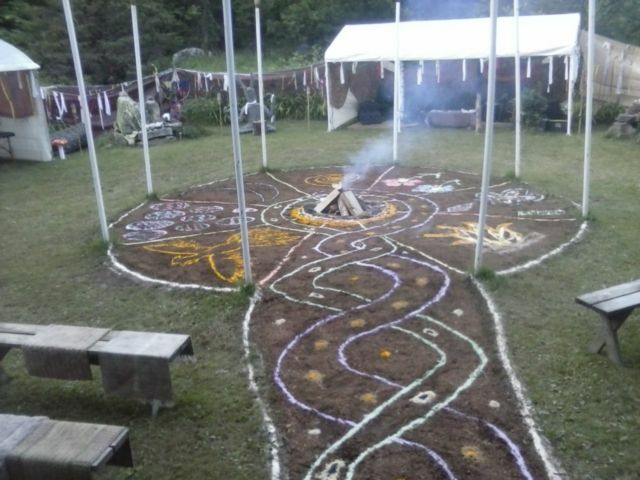 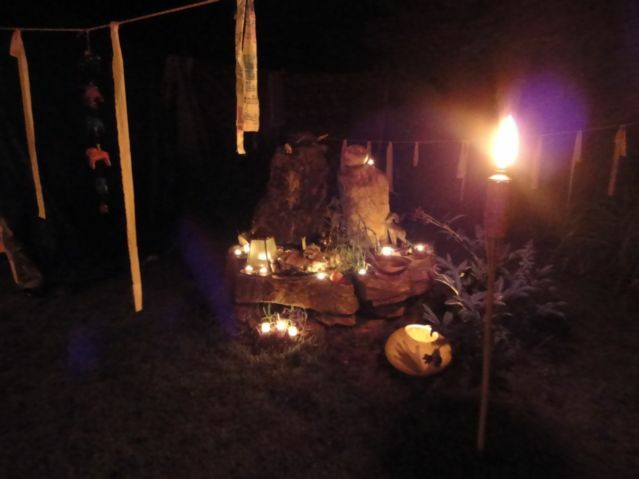 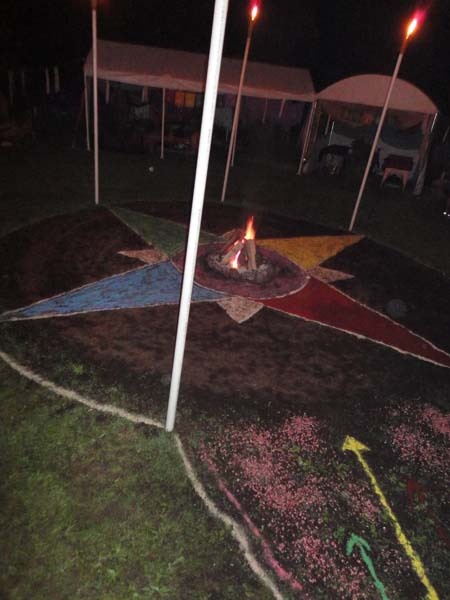 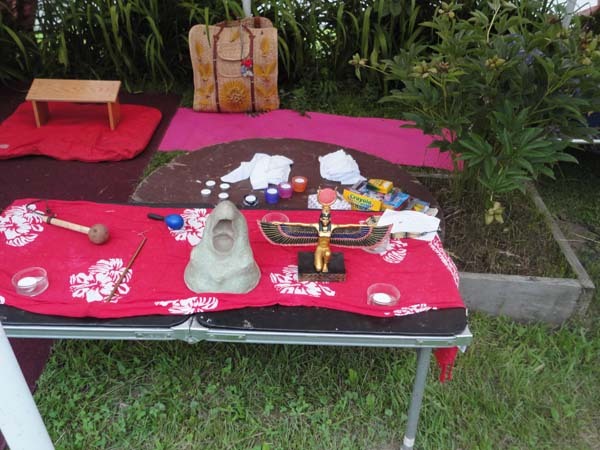 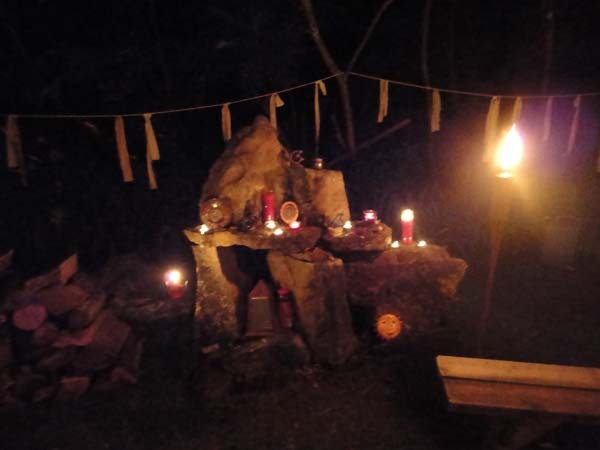 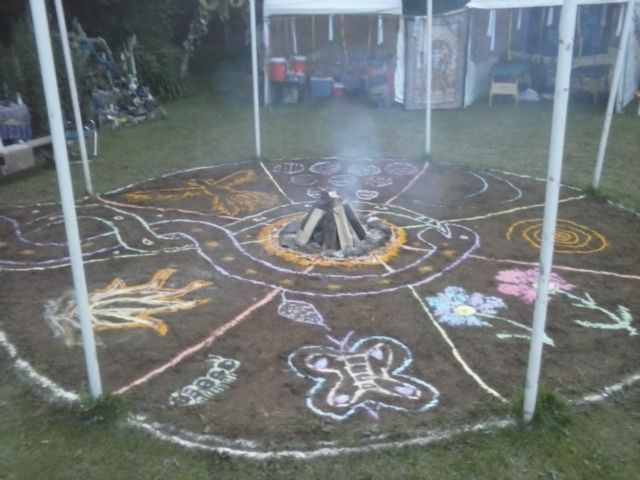 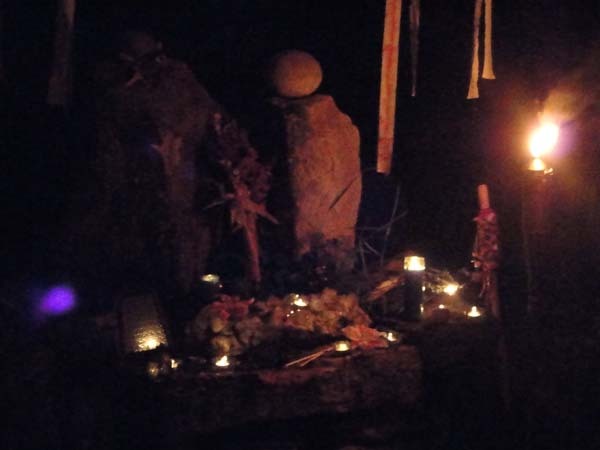 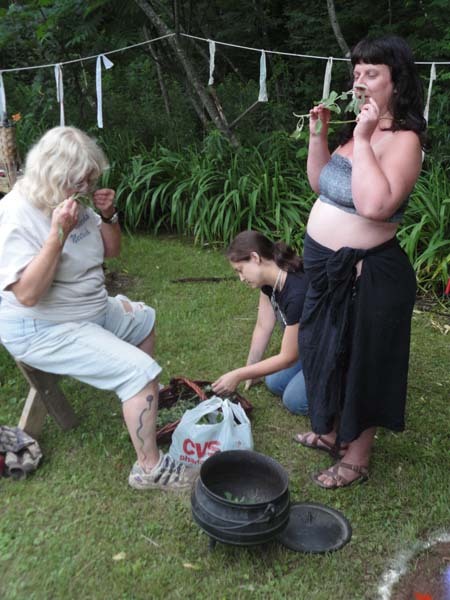 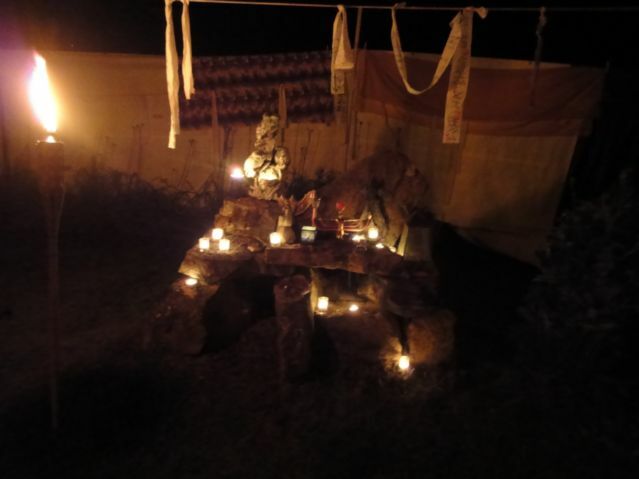 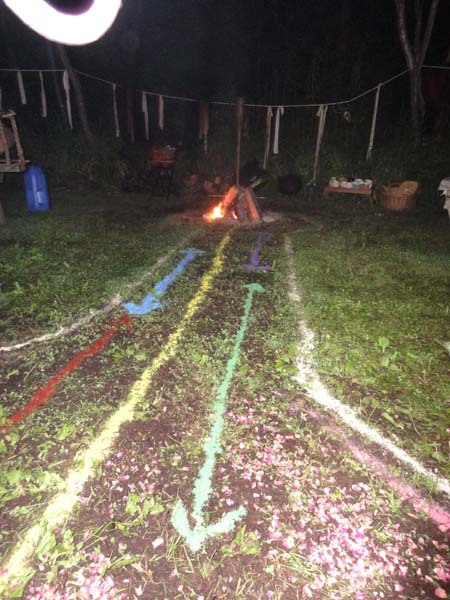 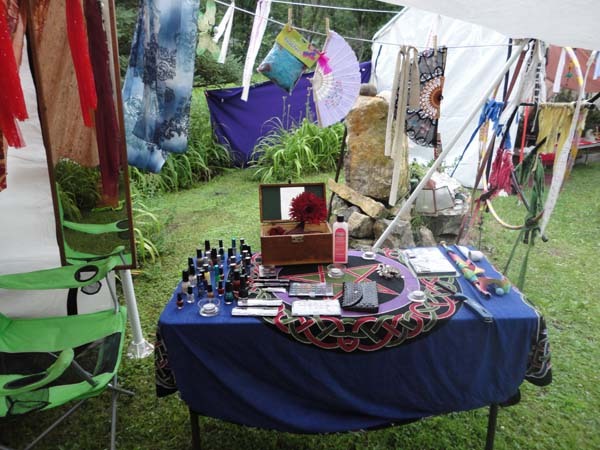 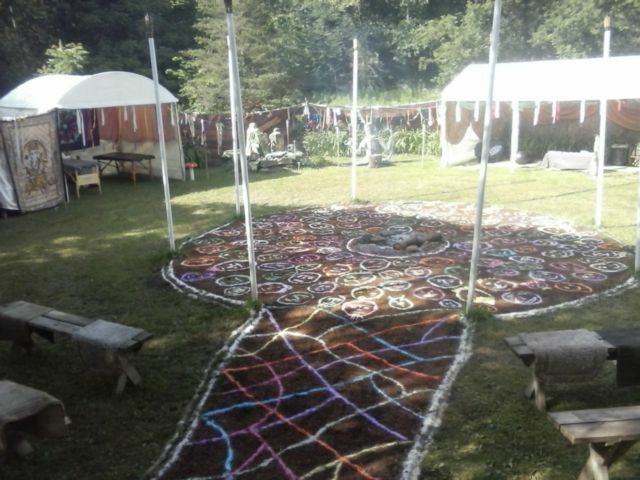 The Sacred Fire Circle of 2018 had twenty nine people and with a new chef, a good rainstorm Friday night, "Visitors" in the woods, and blessed weather! 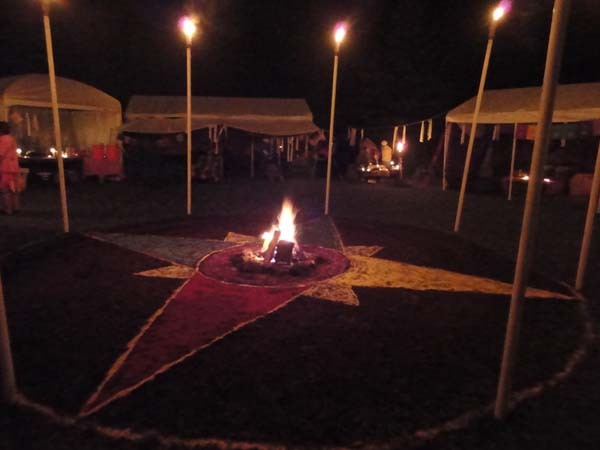 The Sacred Fire Circle of 2016 was awesome. 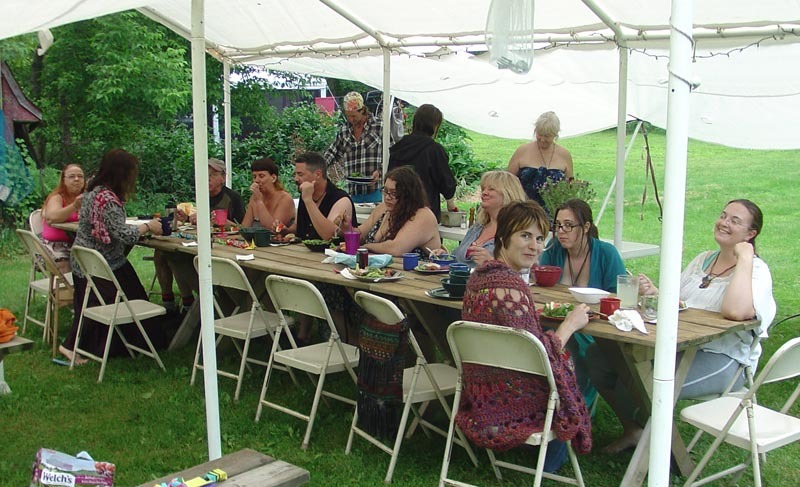 We had thirty four people, the largest ever, and the personal work and magic was HUGE! 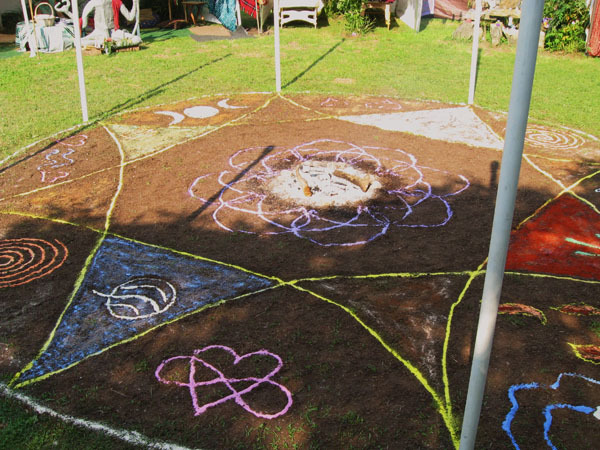 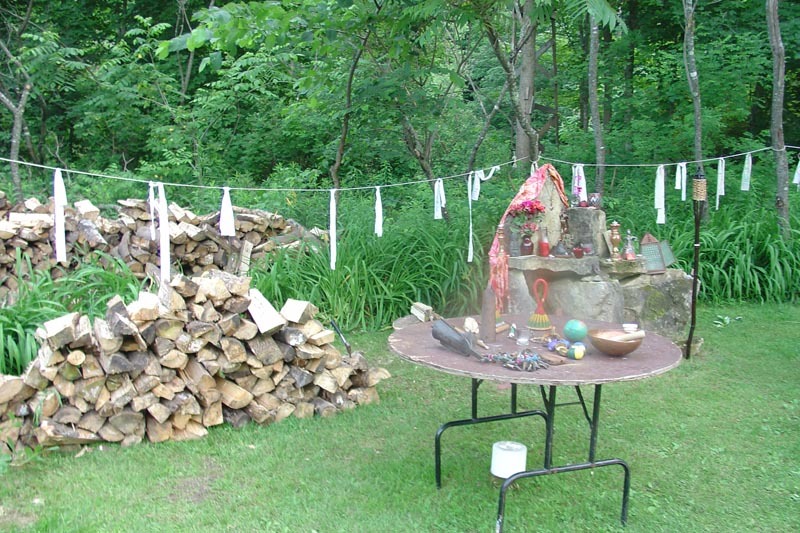 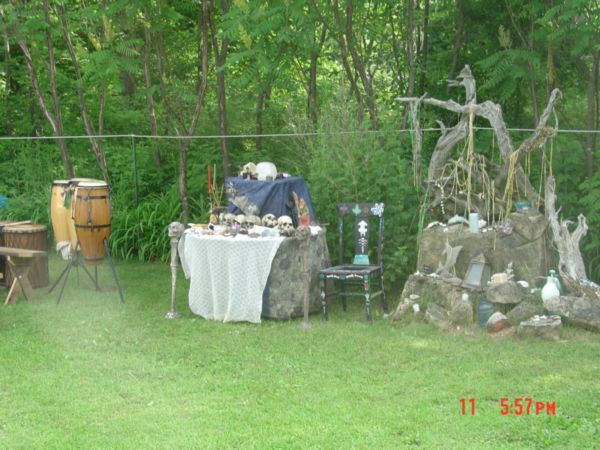 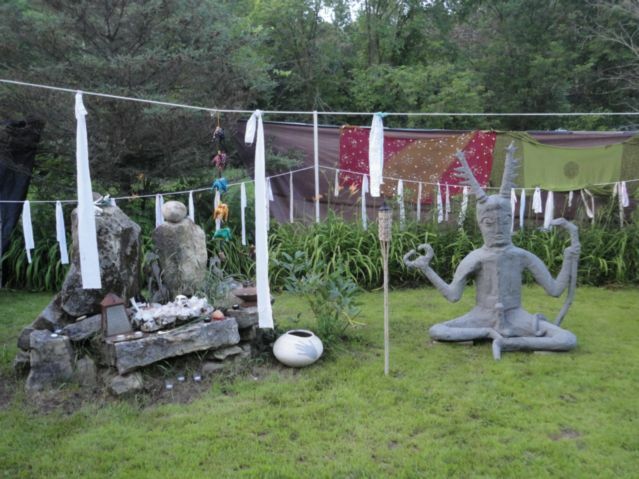 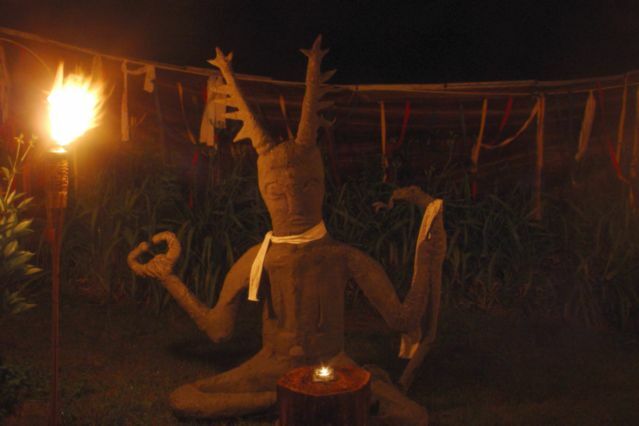 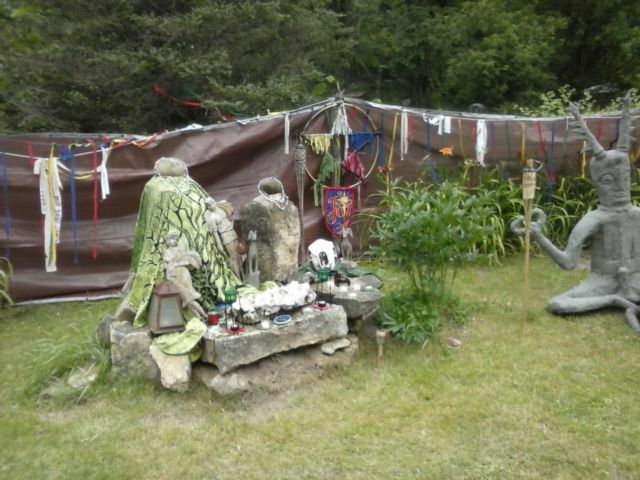 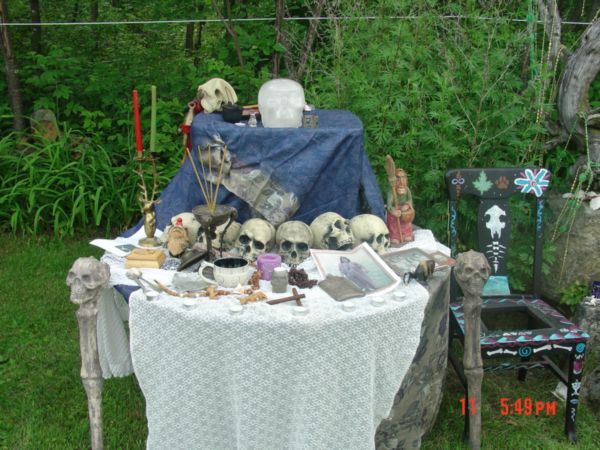 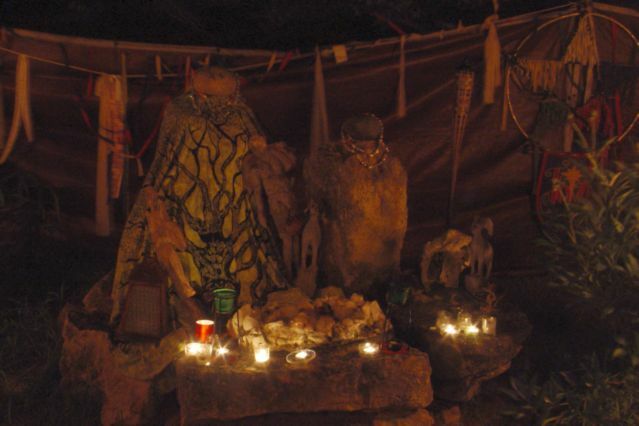 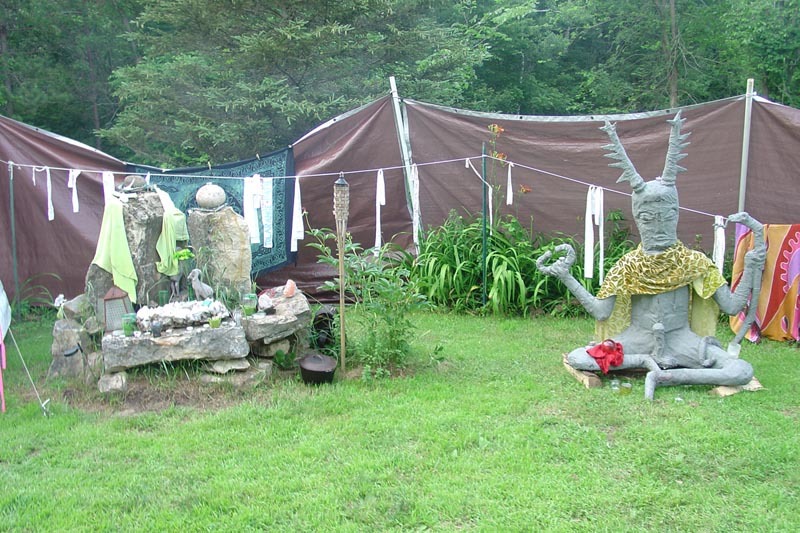 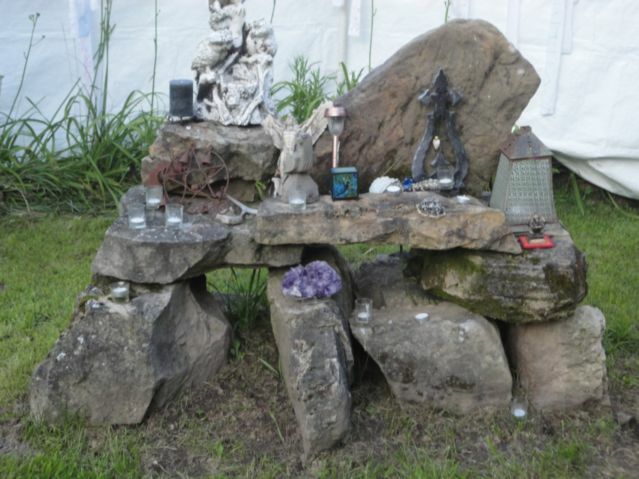 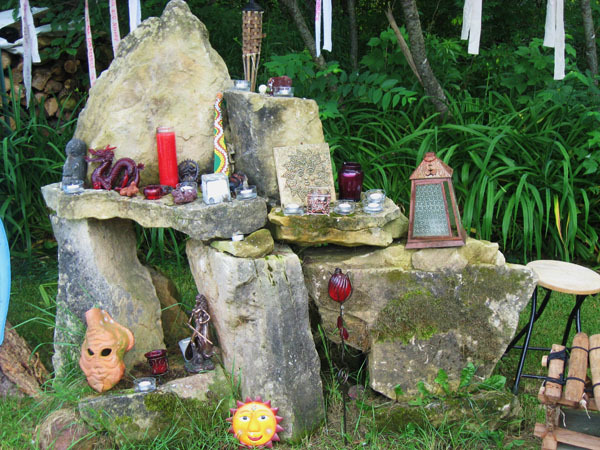 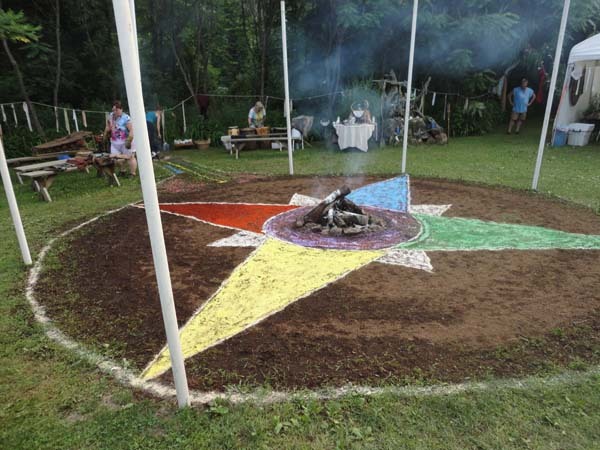 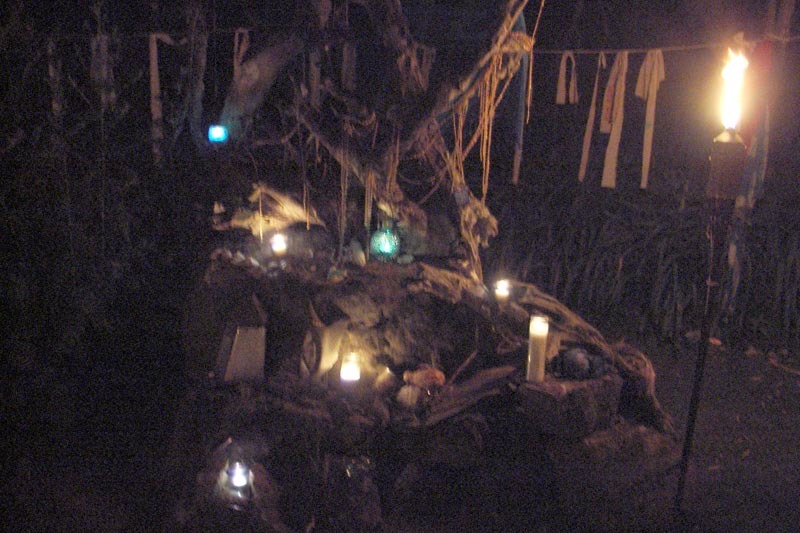 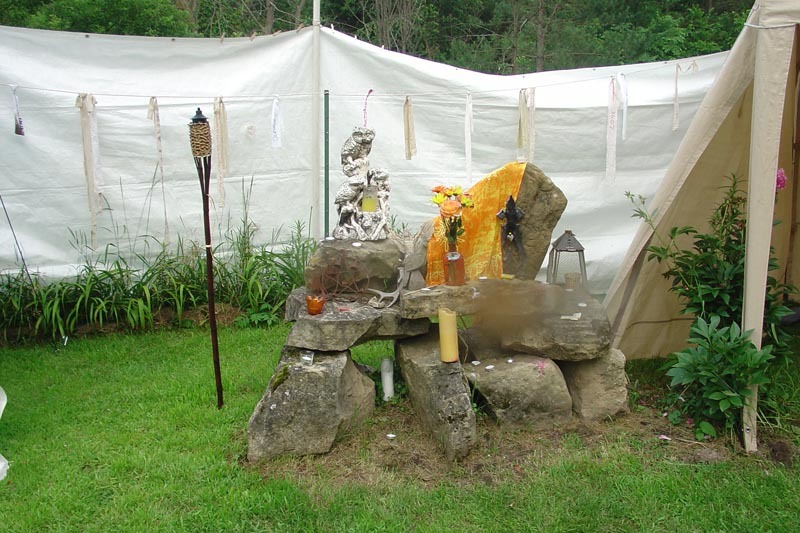 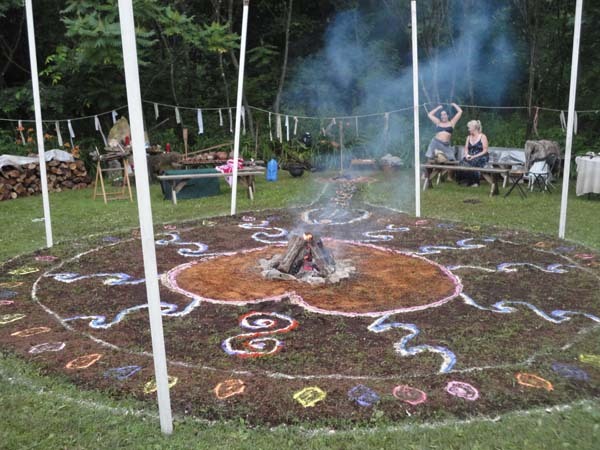 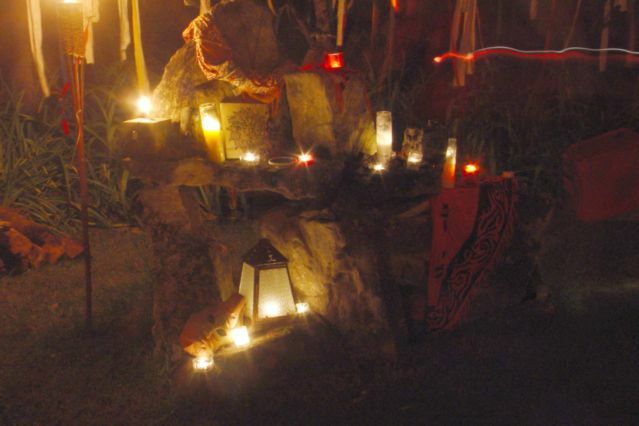 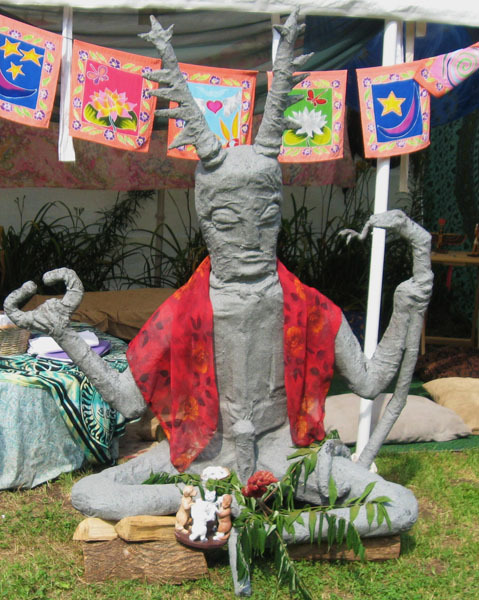 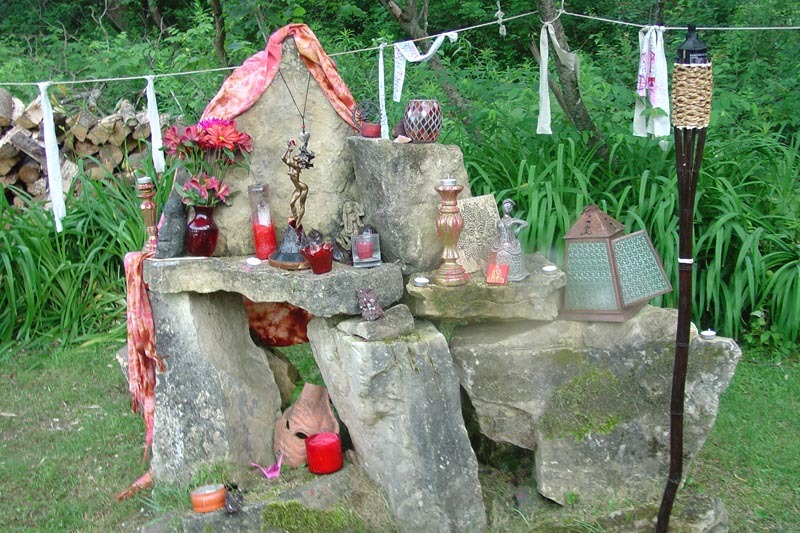 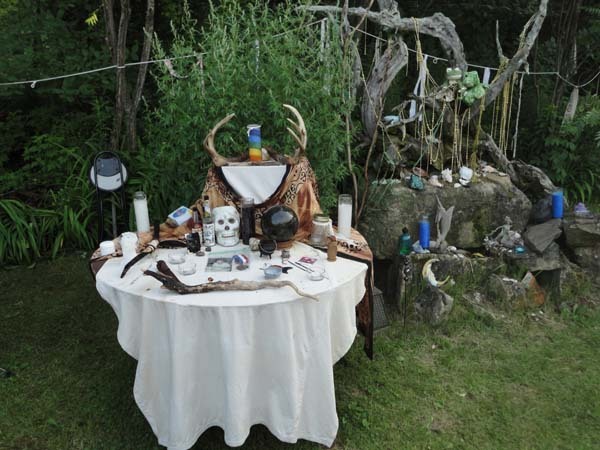 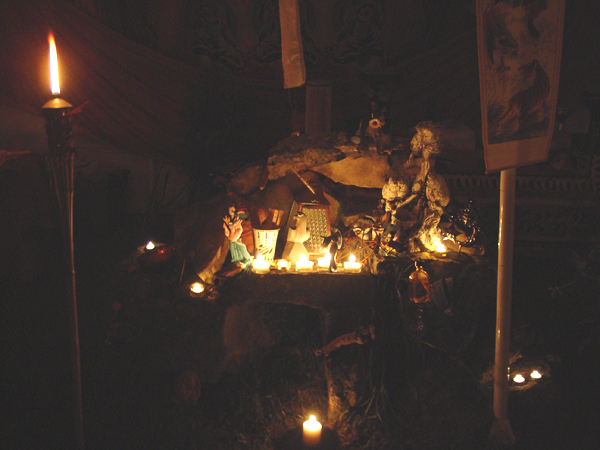 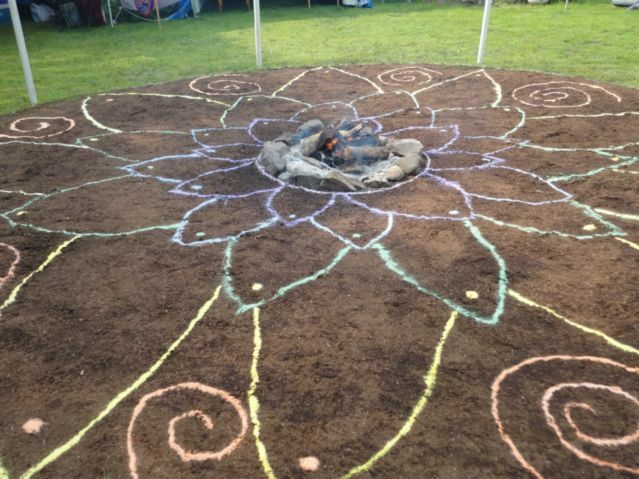 In 2014 the Sacred Fire Circle was blessed with A great crew of village builders. 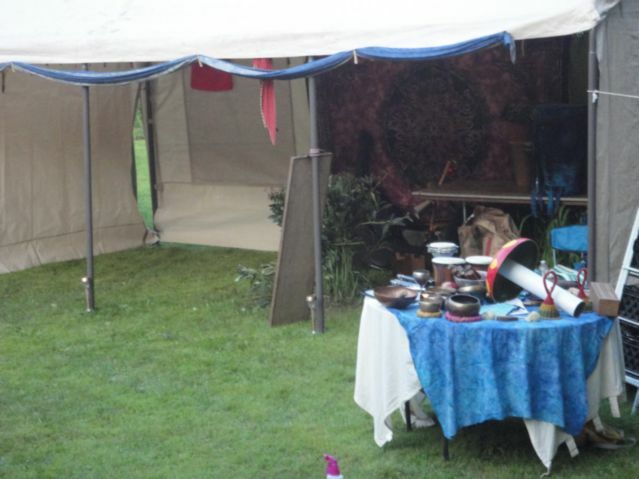 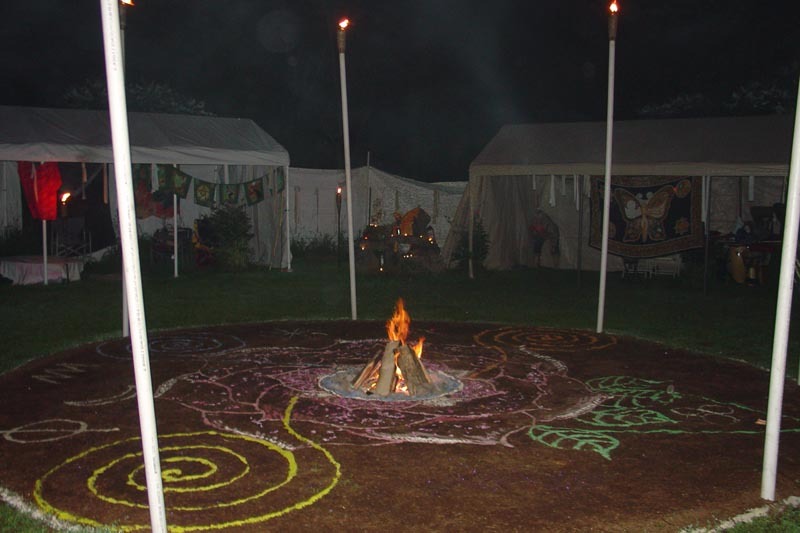 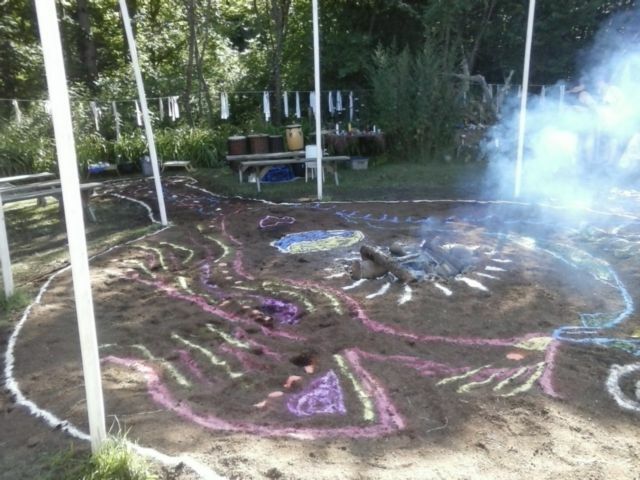 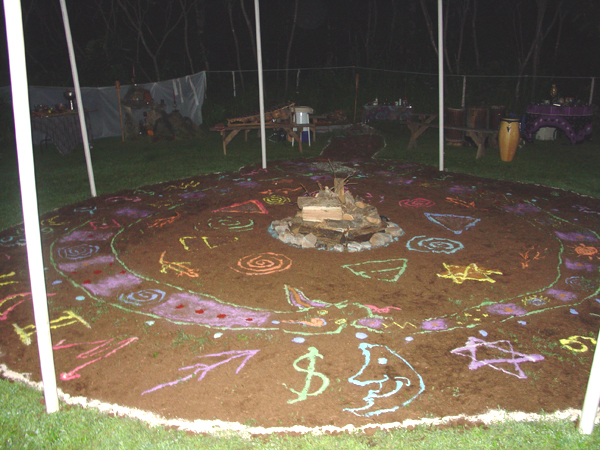 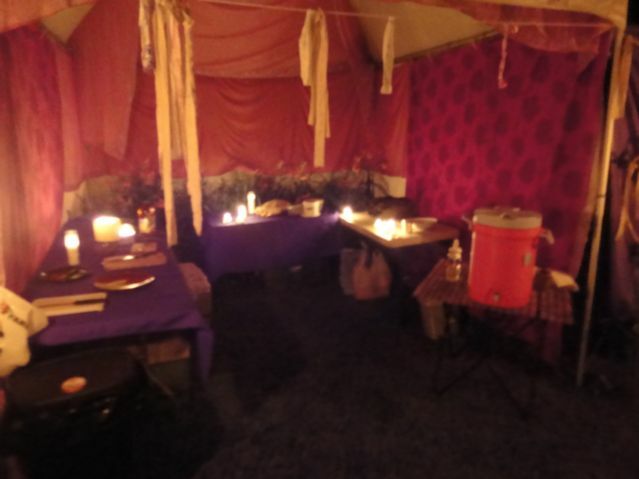 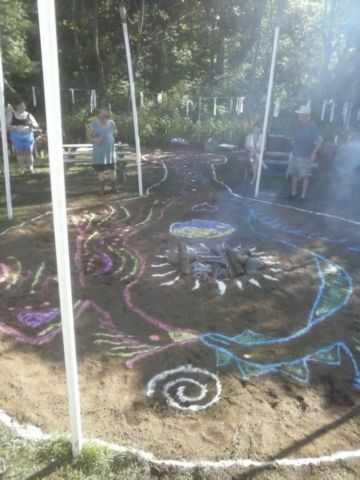 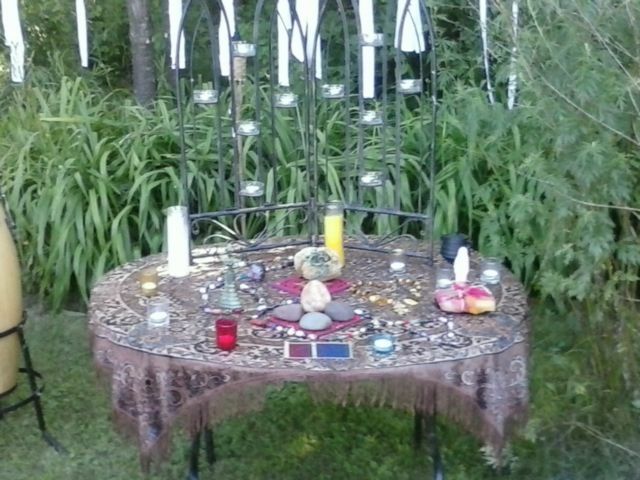 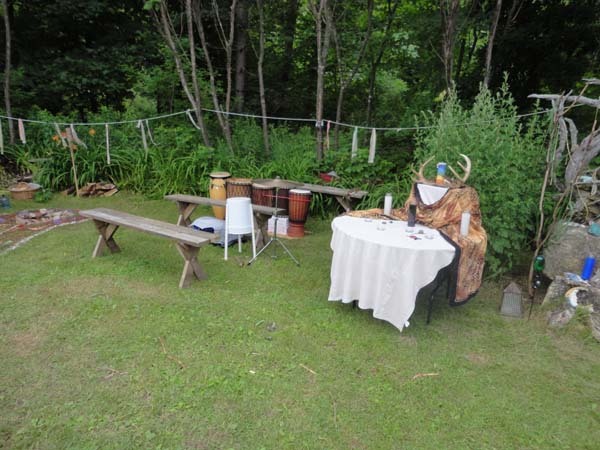 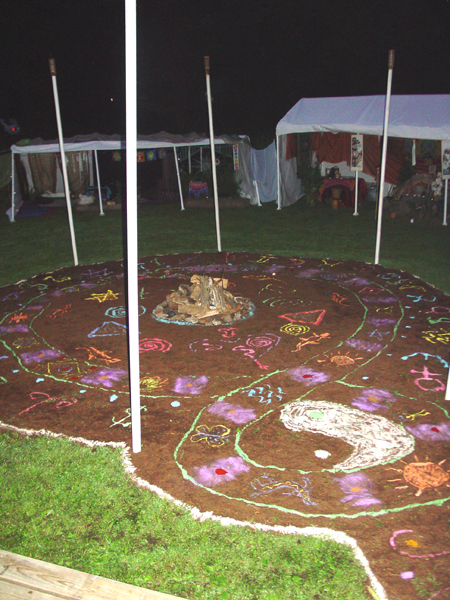 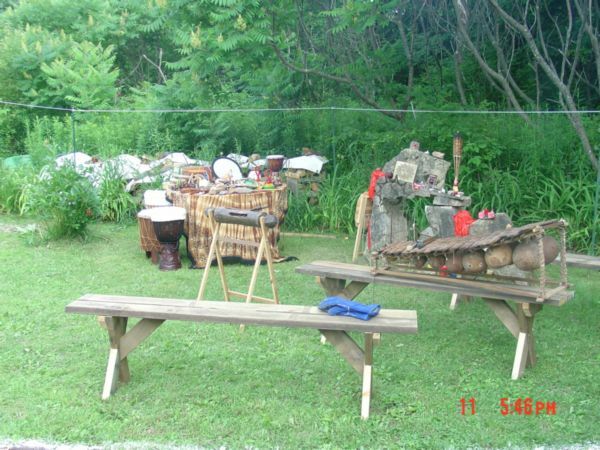 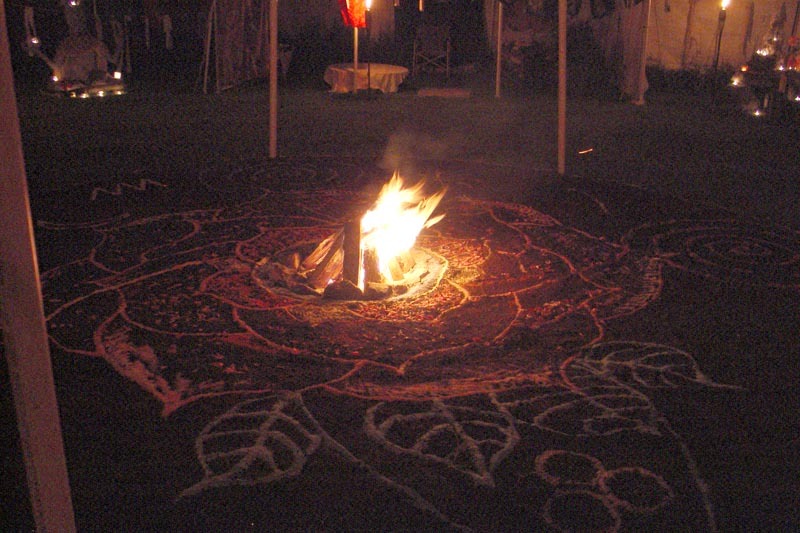 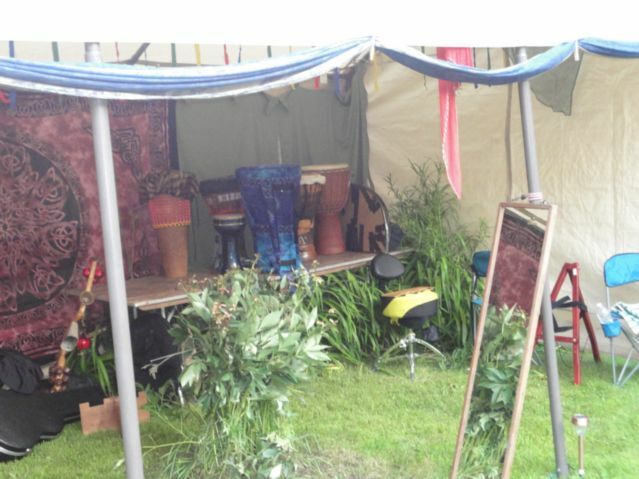 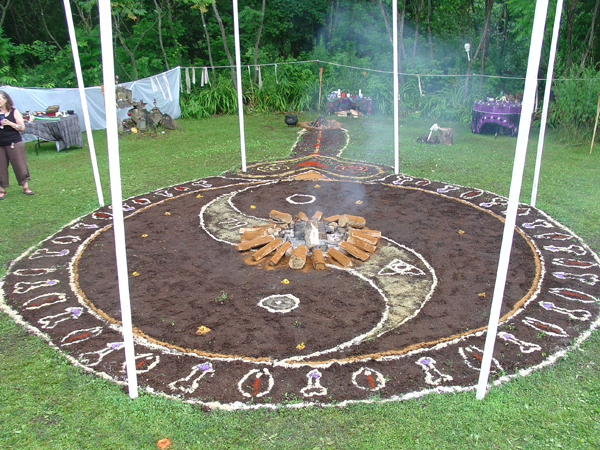 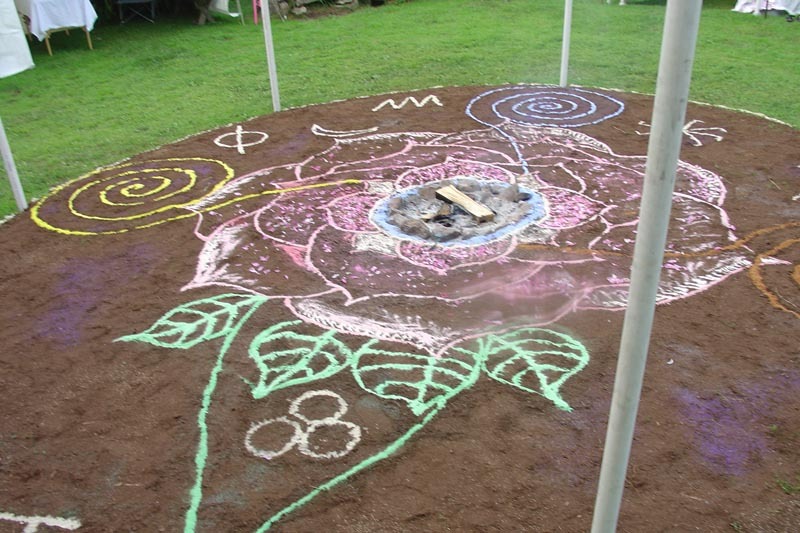 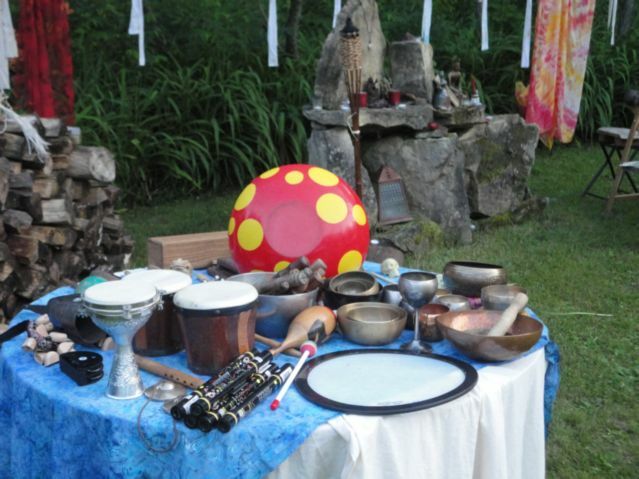 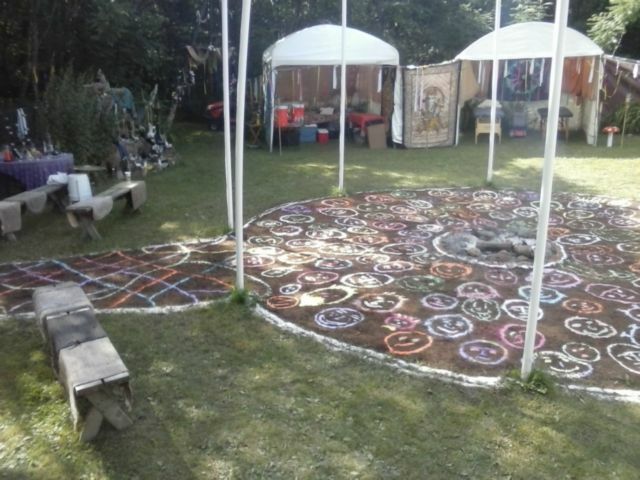 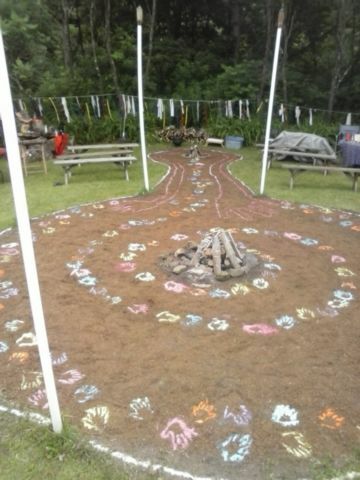 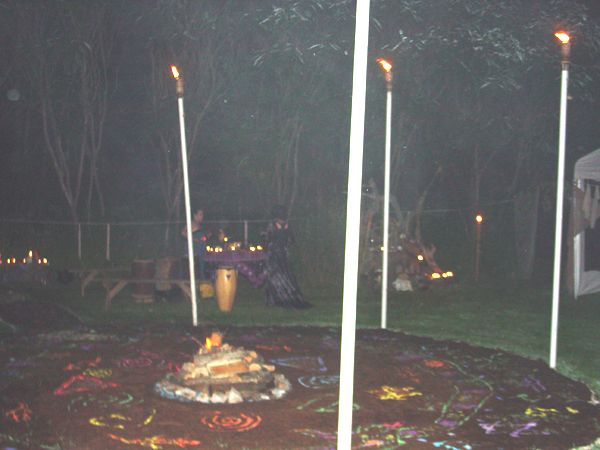 We had the circle set up pretty completely by dinner and fired the beads and drummed in the circle Wednesday night. 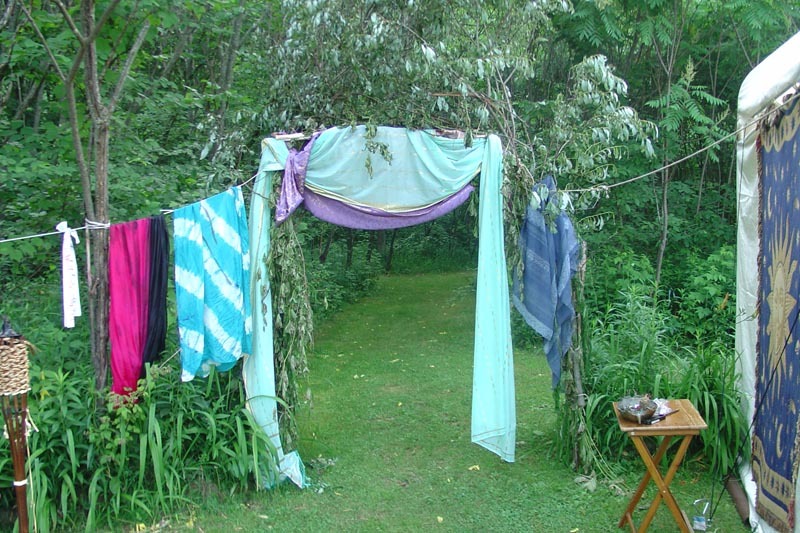 We had perfect summer days just warm enough to want to swim, and no rain in sight. 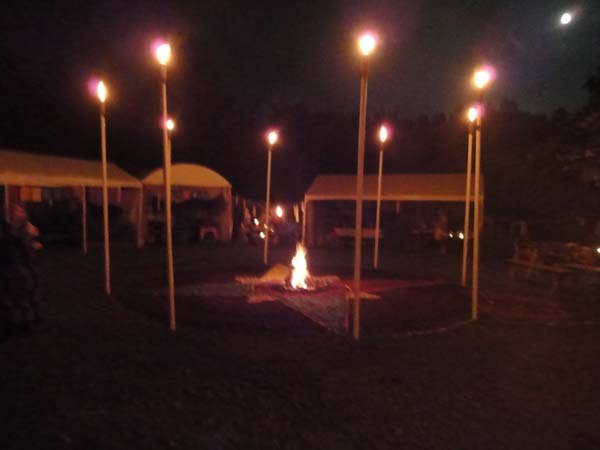 Nights around the fire were intimate, we had a small group, but these were people who came to engage! 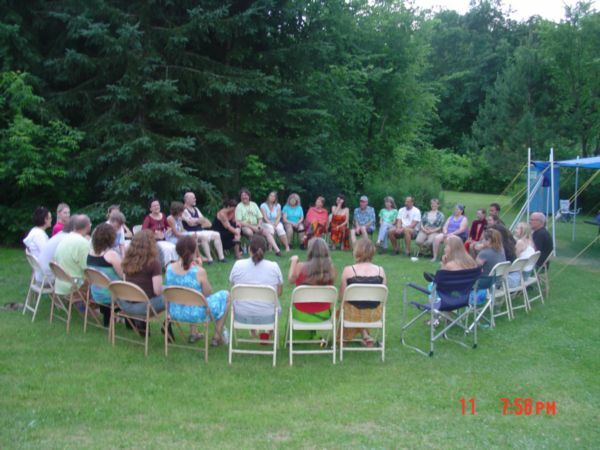 Each person offered so many contributions in so many ways, it was hard to single anyone out as more or less than anything! 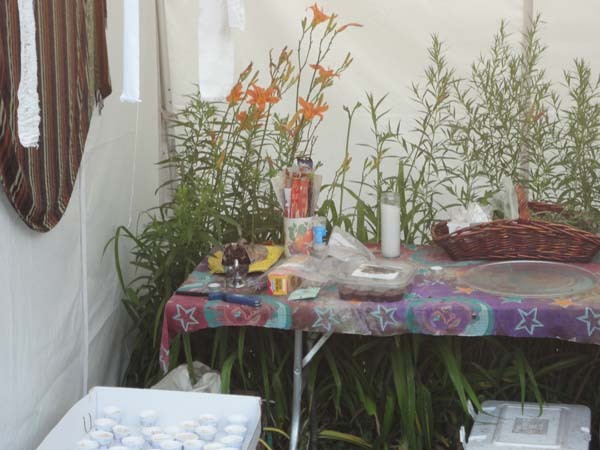 The food flowed easily from the kitchen and the water team bonded well. 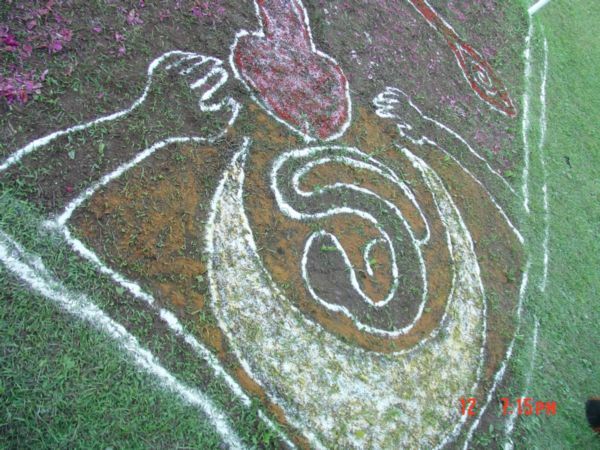 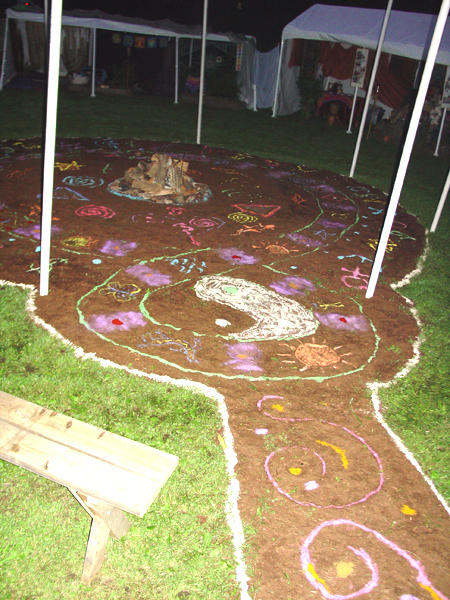 The concept of the Spirit team came to fruition with a marvelous ritual opening, closing, and rangoli design featured each night. 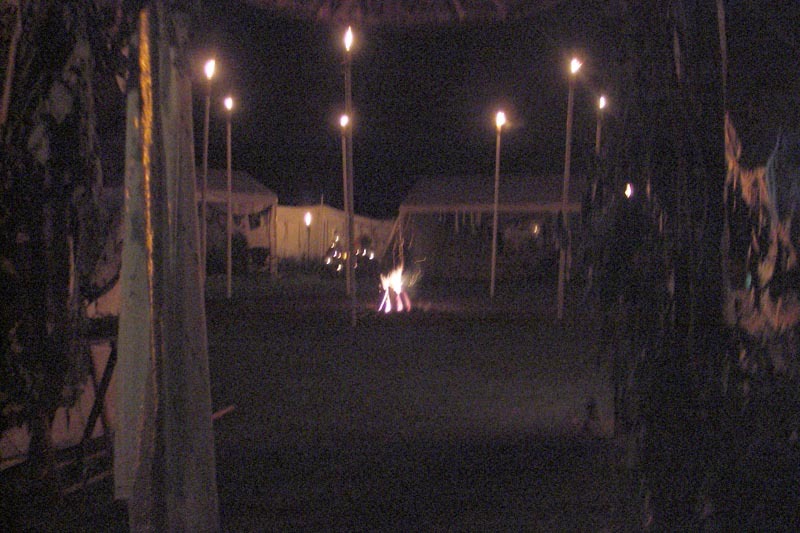 Take down went smooth, with a leisurely departure. 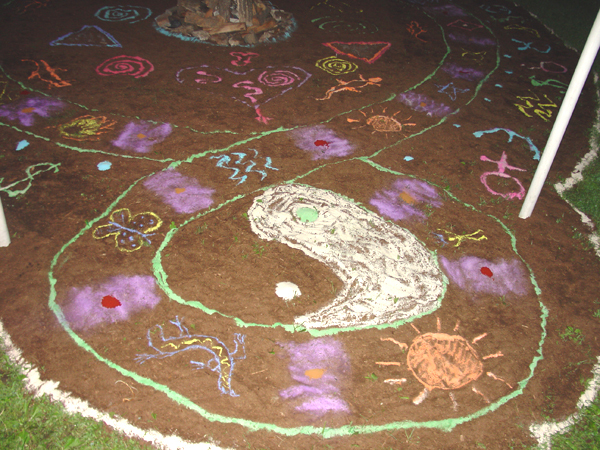 Everyone left with a sense of transformation and taking new seeds of growth out into the world. 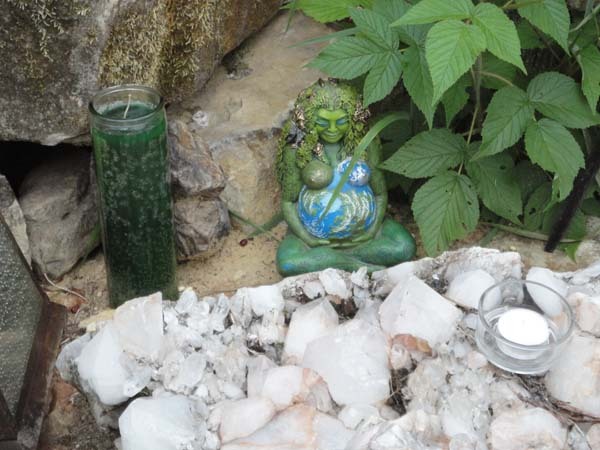 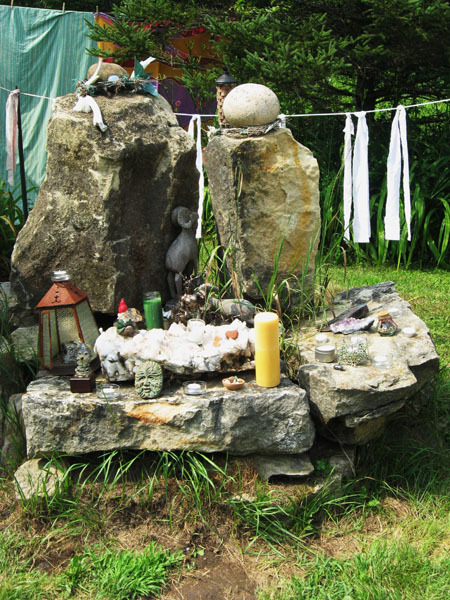 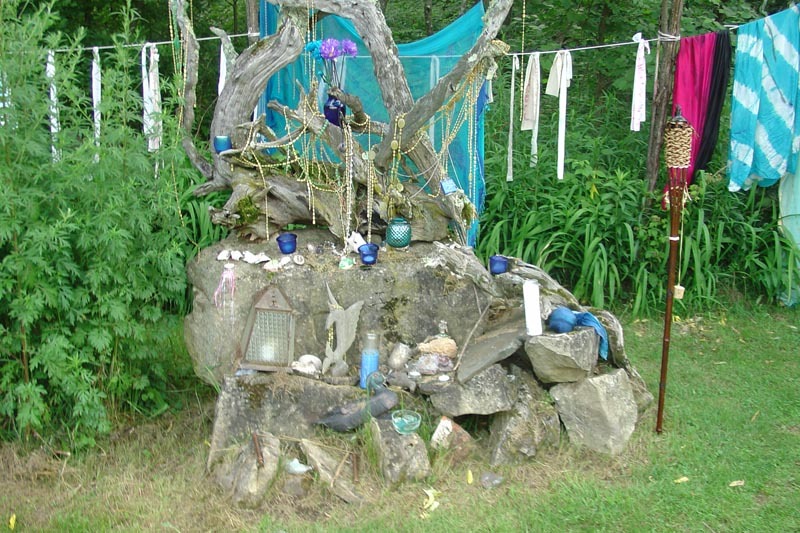 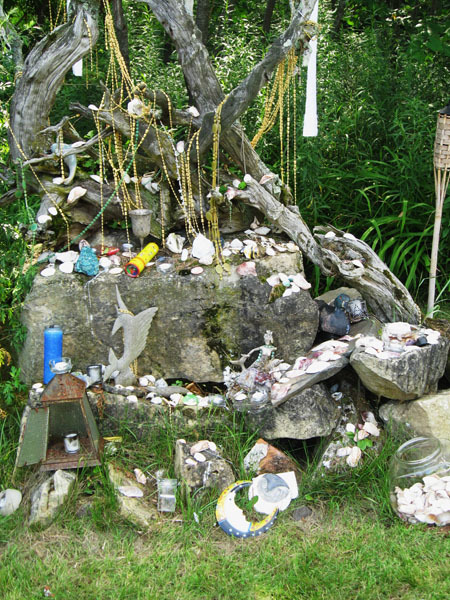 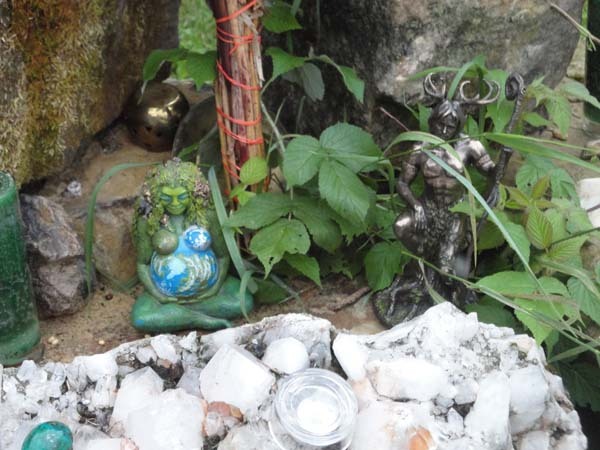 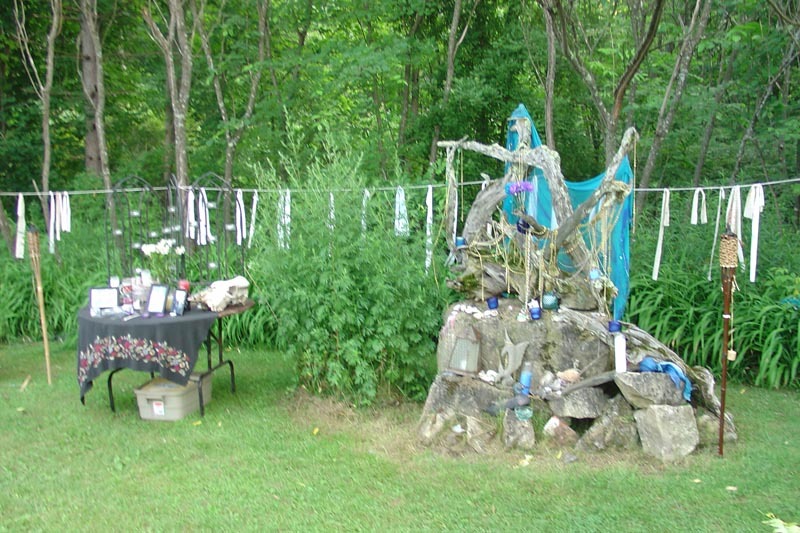 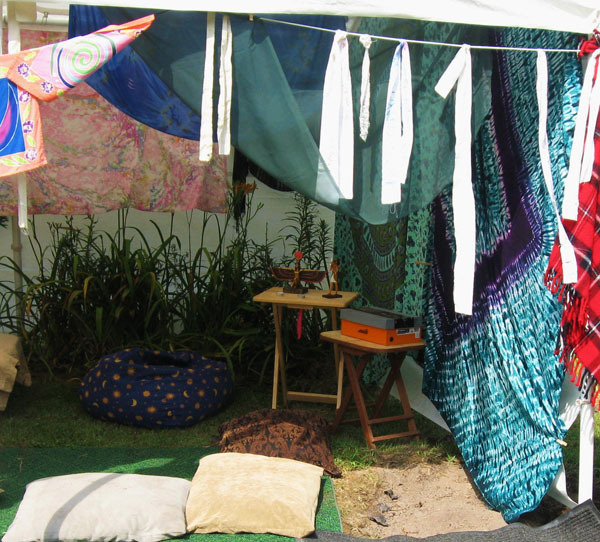 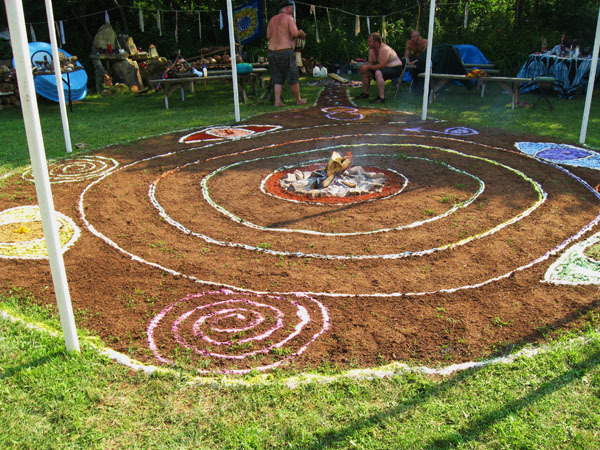 In 2013 the Sacred Fire Circle was blessed with perfect summer days just warm enough to want to swim, with sweet dry air. 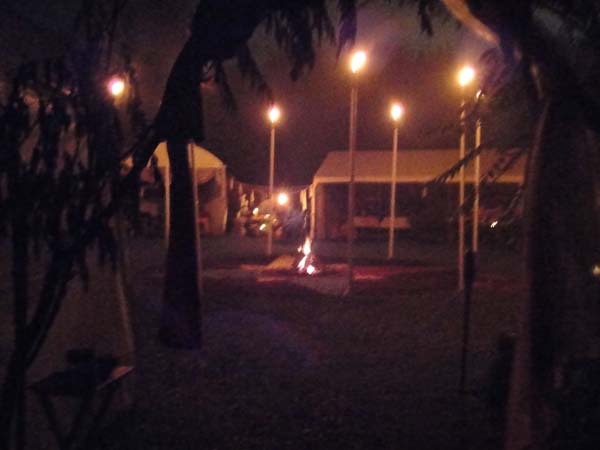 Nights around the fire were intimate, our smallest group ever, but these were people who came to engage! 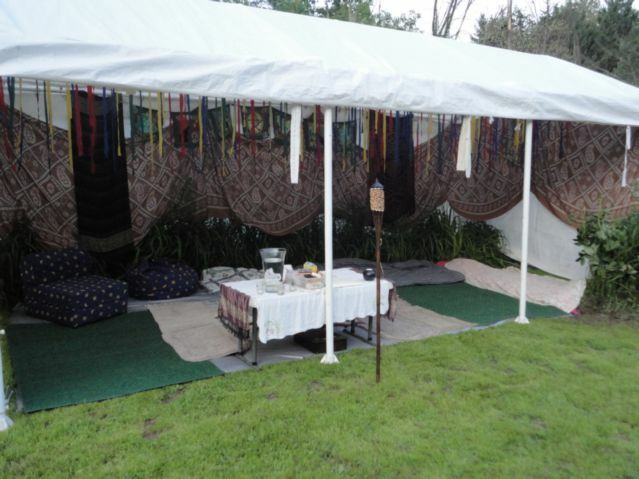 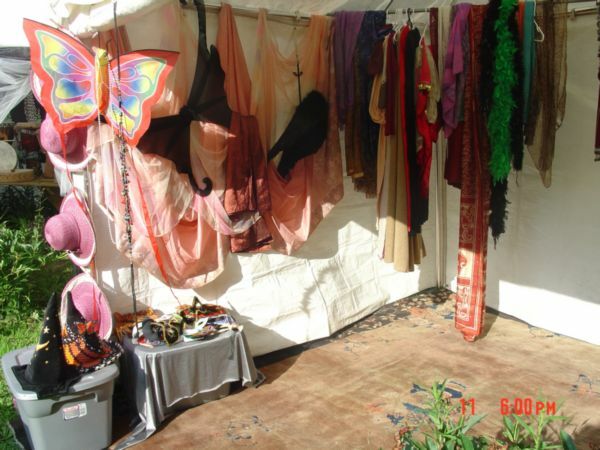 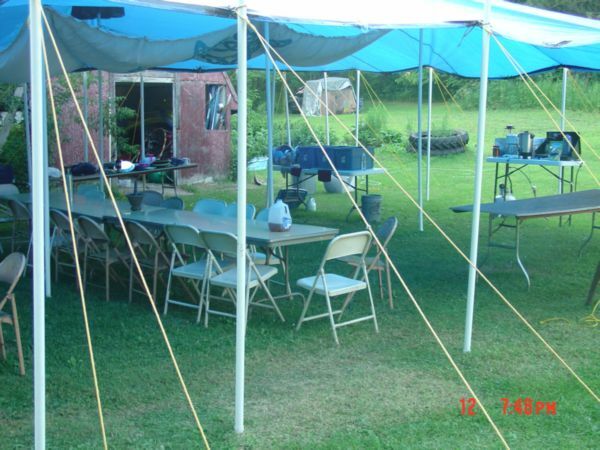 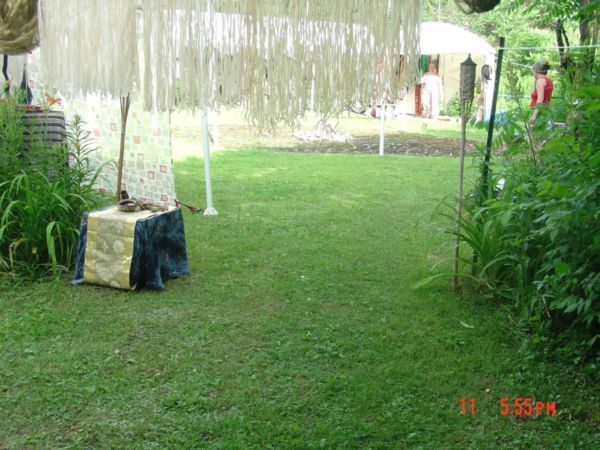 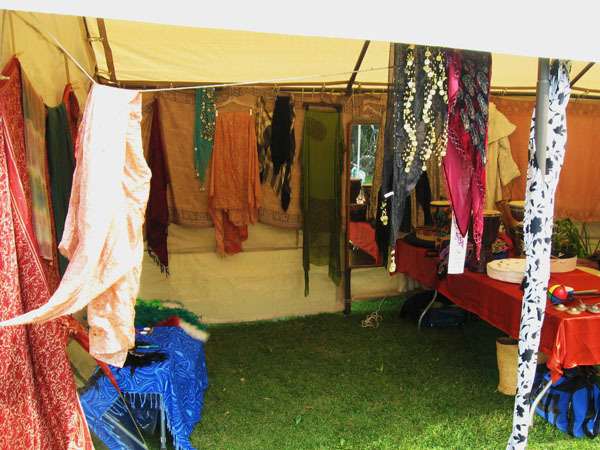 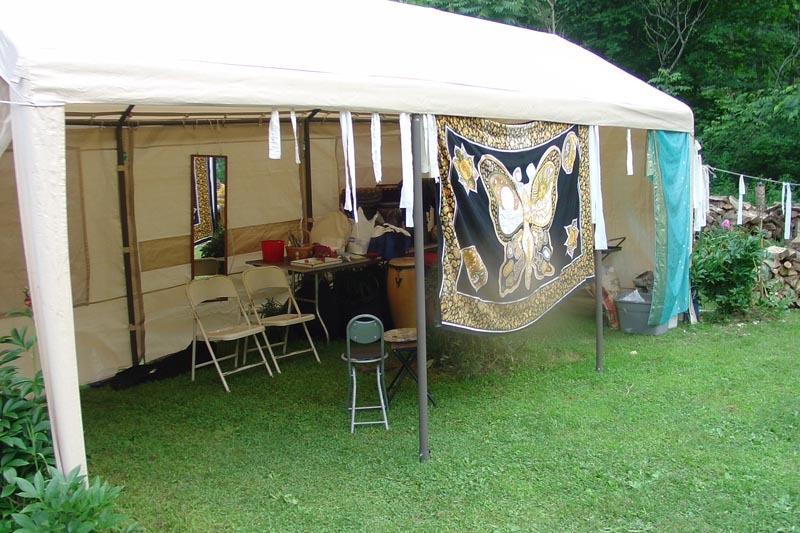 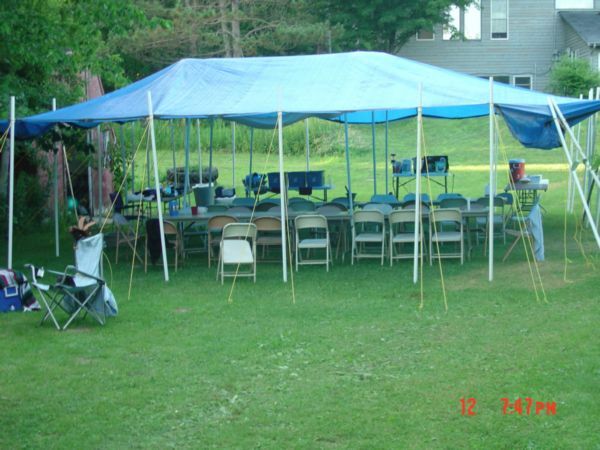 We eliminated a nesting tent and used a smaller tent, opened wide, for the dining hall. 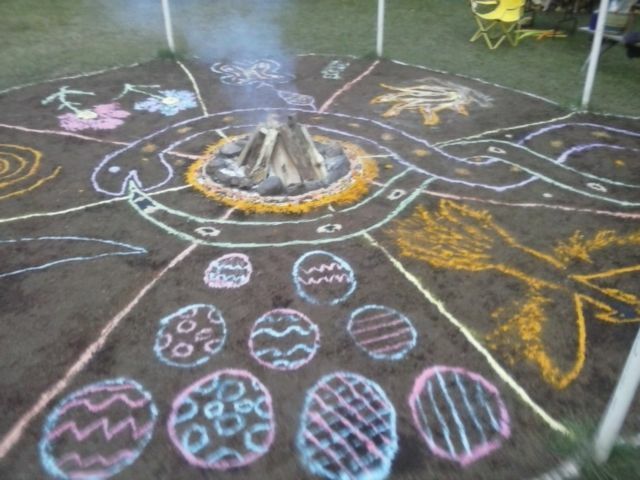 This worked really well and we will try it again next year. 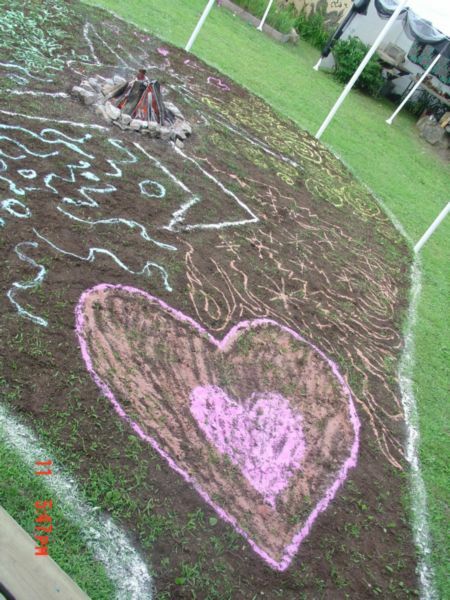 We got to know each other pretty well and we all contributed to nearly every aspect with "teams" kind of fading in importance as we all helped where needed. 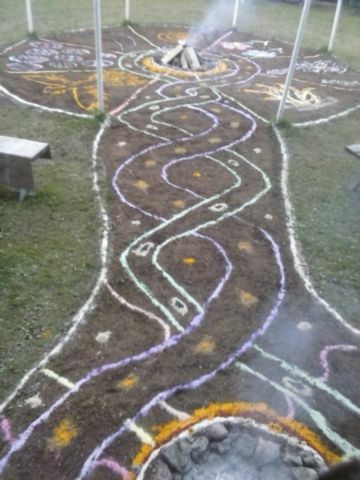 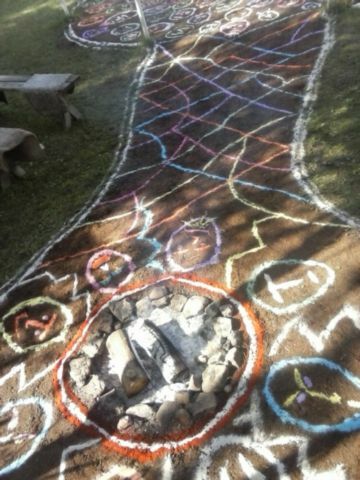 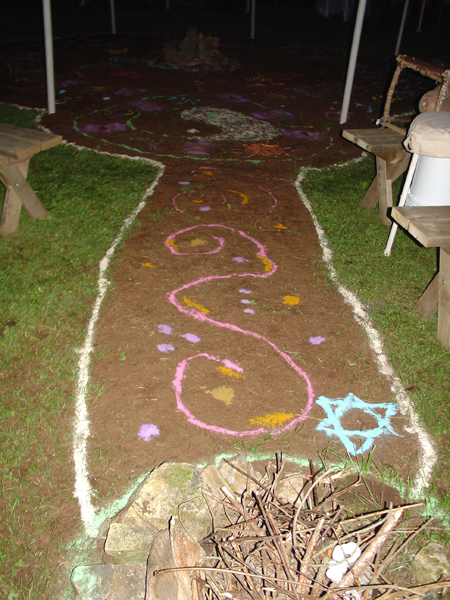 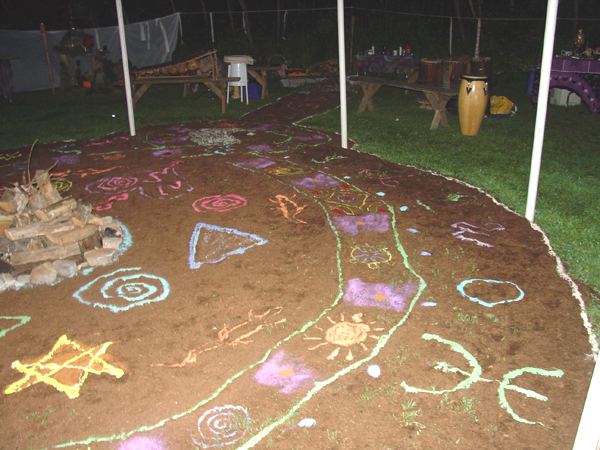 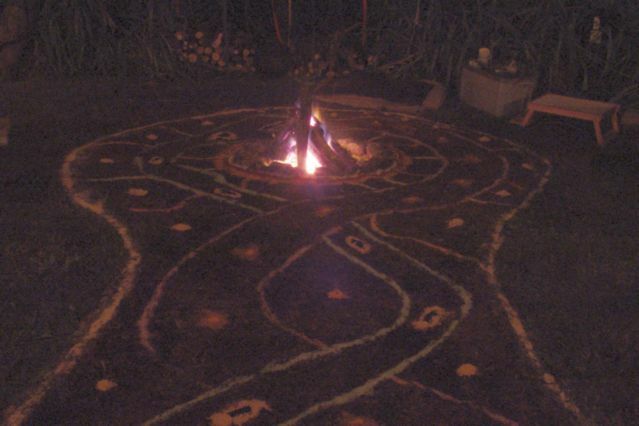 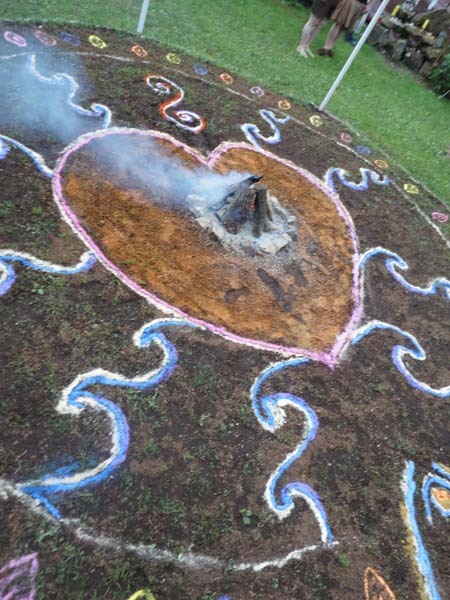 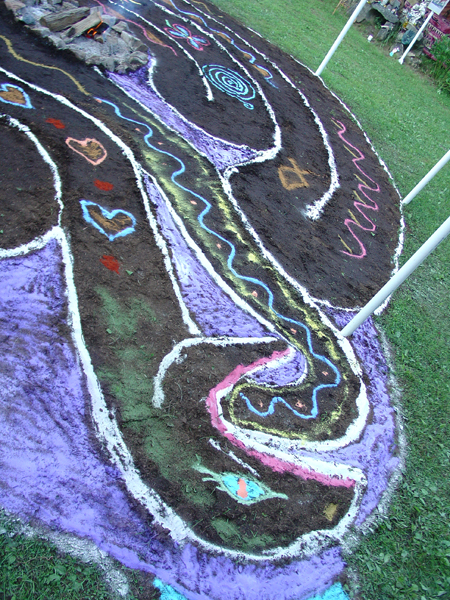 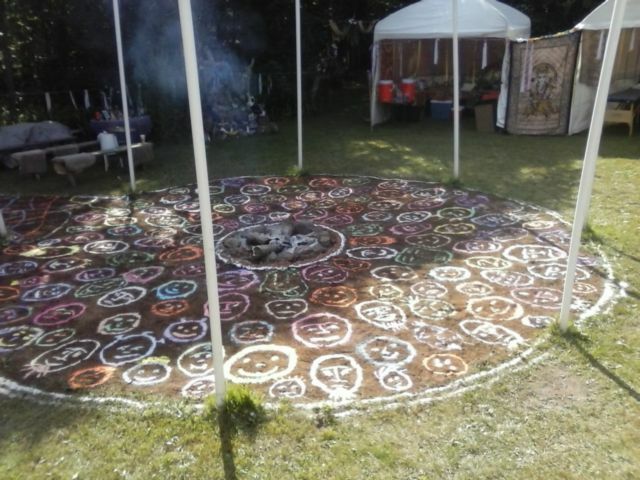 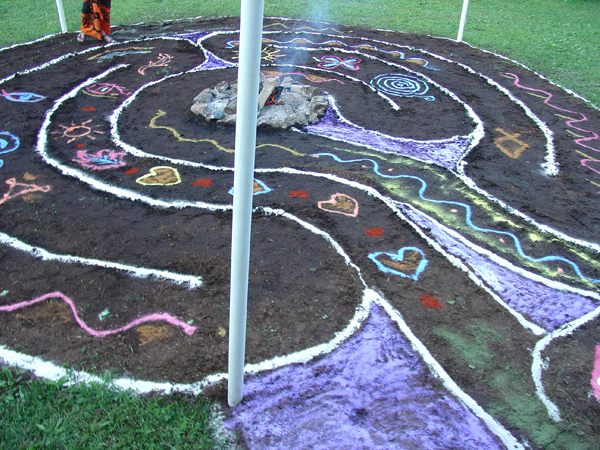 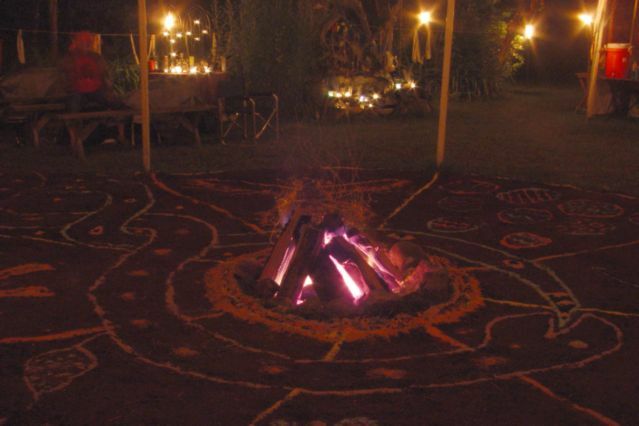 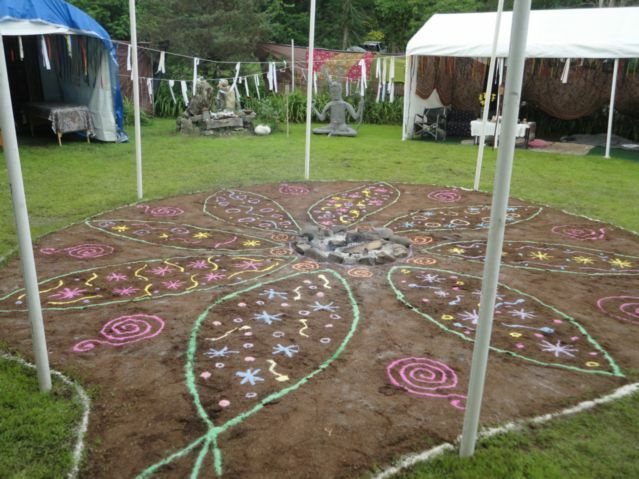 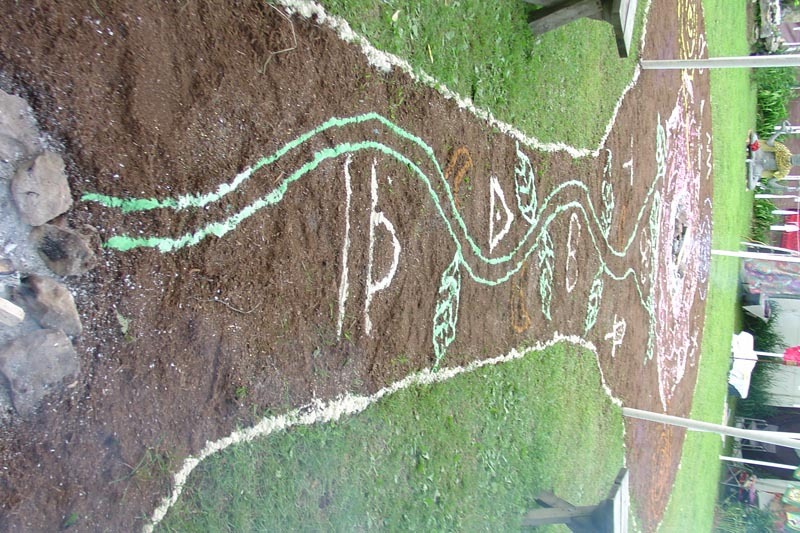 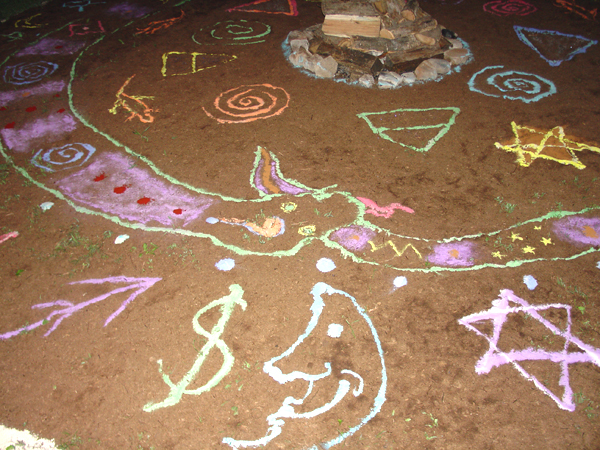 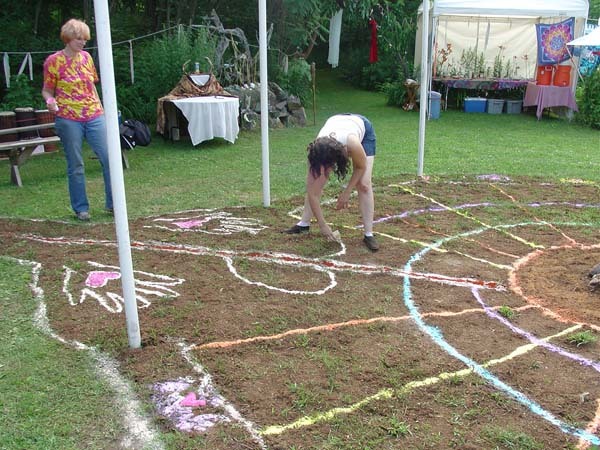 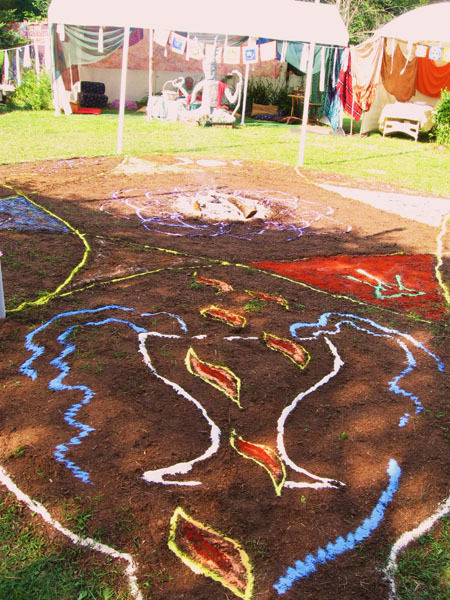 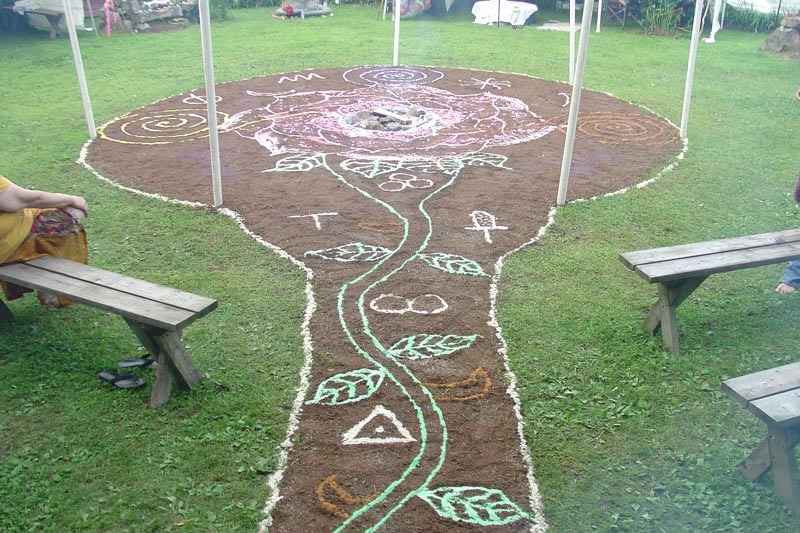 Each night has a wonderful ritual theme opening and Rangoli. 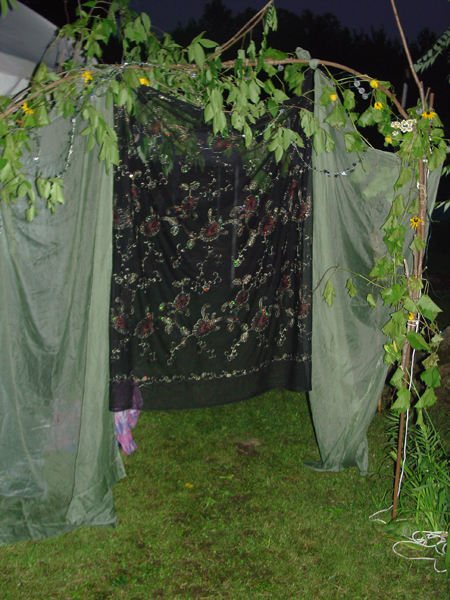 Friday we had a shower just before dawn, but we were ready to rock Saturday night! 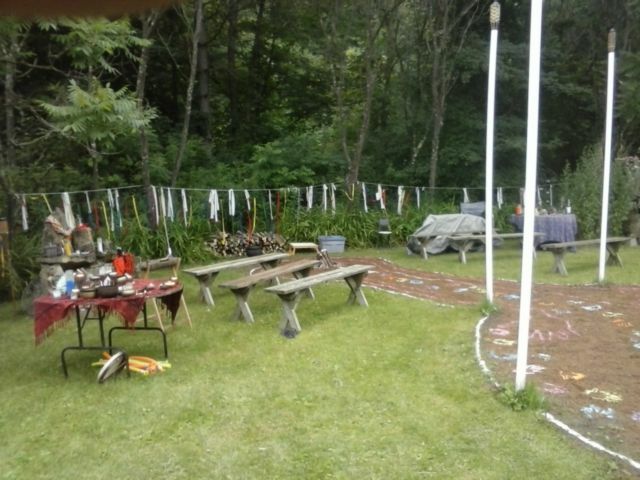 Take down went smooth, with a leisurely departure for most. 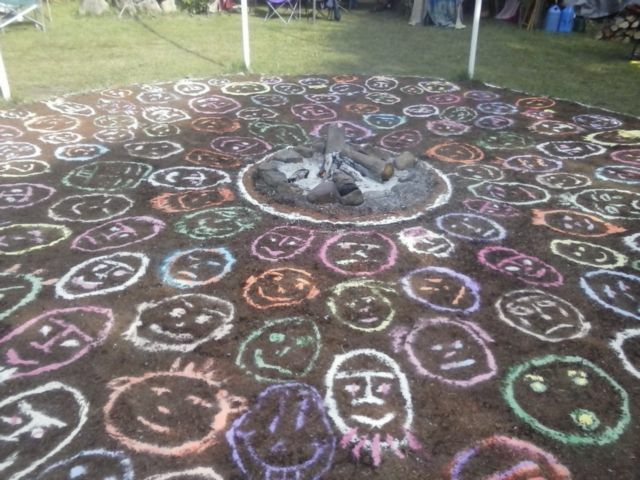 Everyone left with a sense of completion. 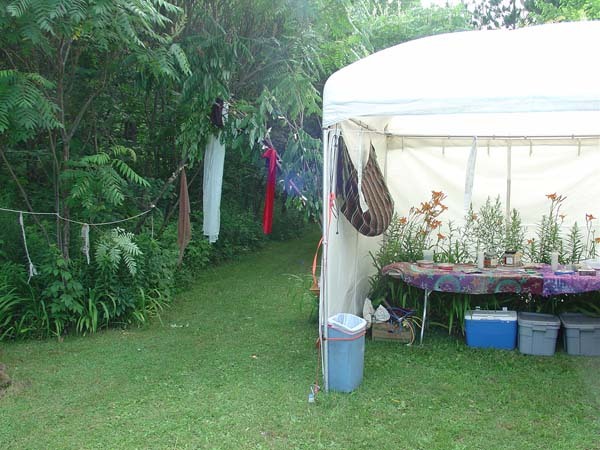 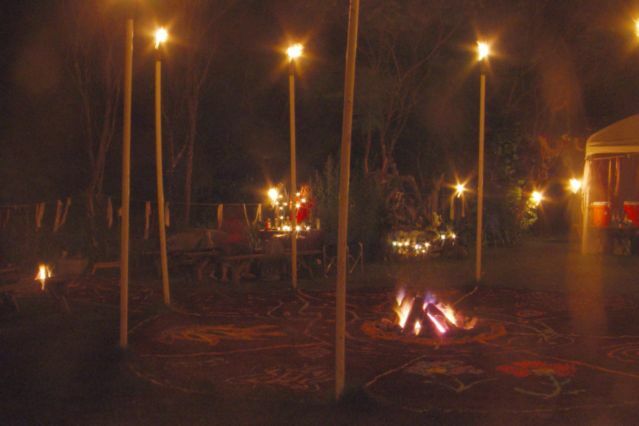 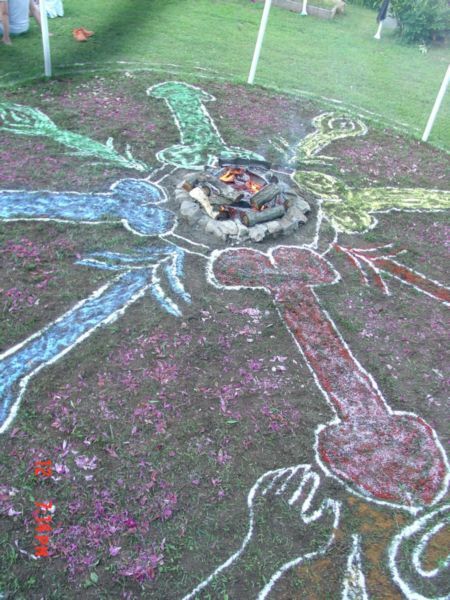 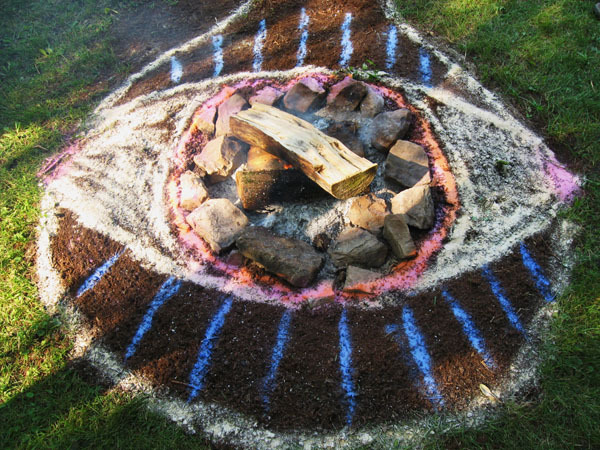 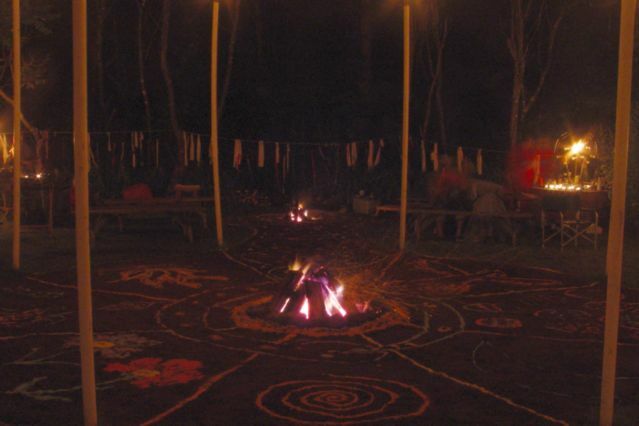 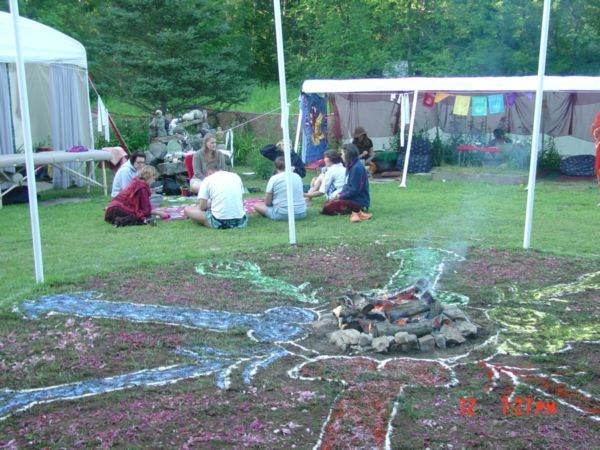 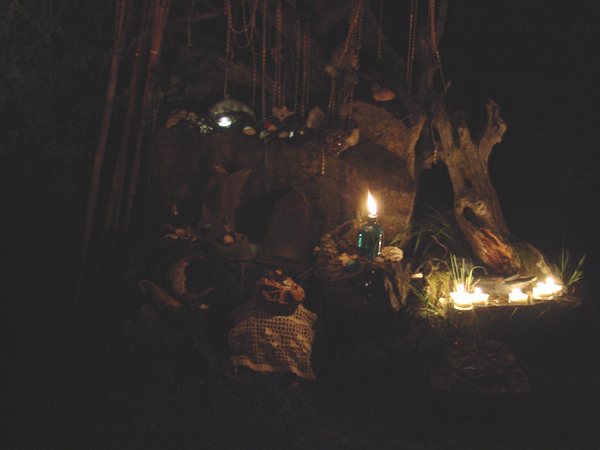 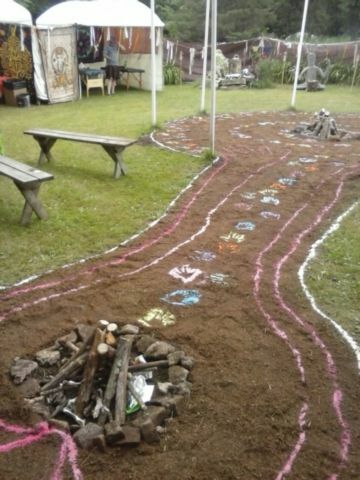 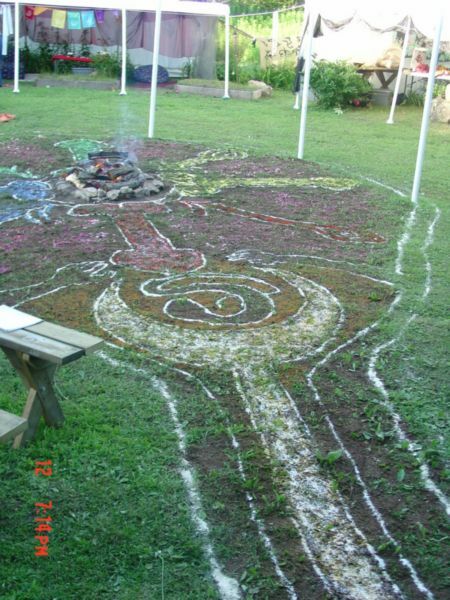 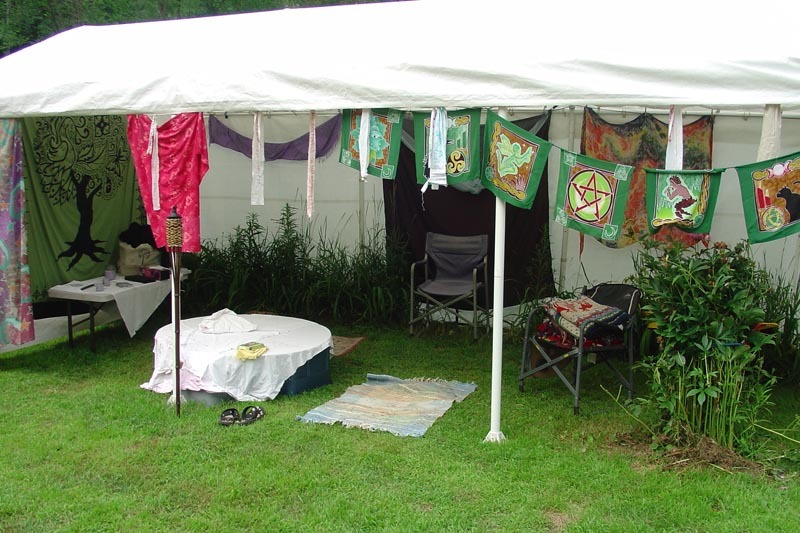 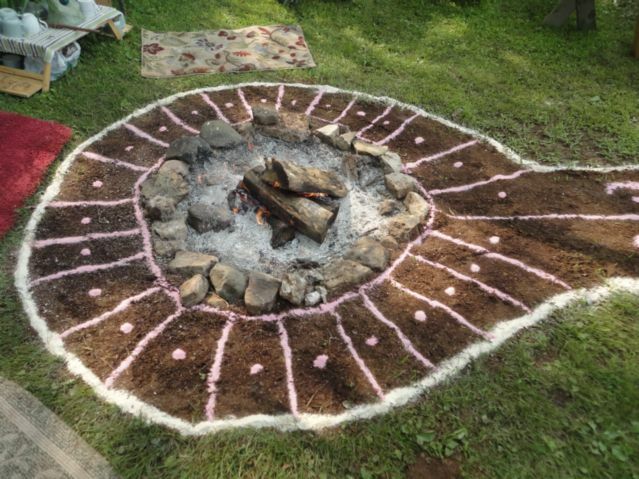 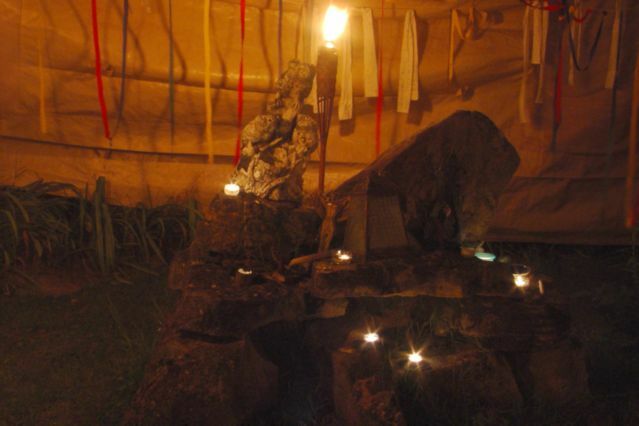 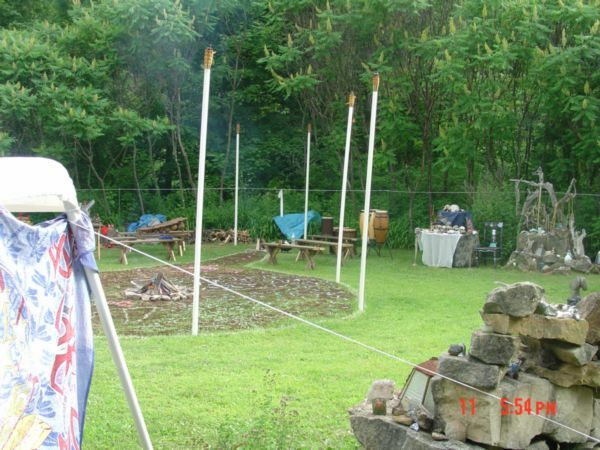 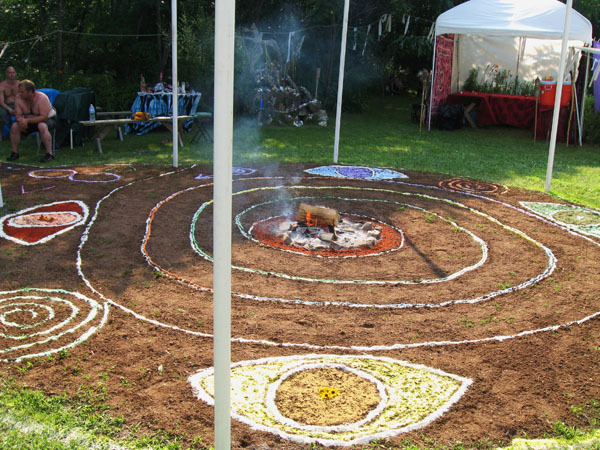 In 2012 the Sacred Fire Circle was blessed with warm days with lots of waking time spent in the river, and sweet balmy nights around the fire. 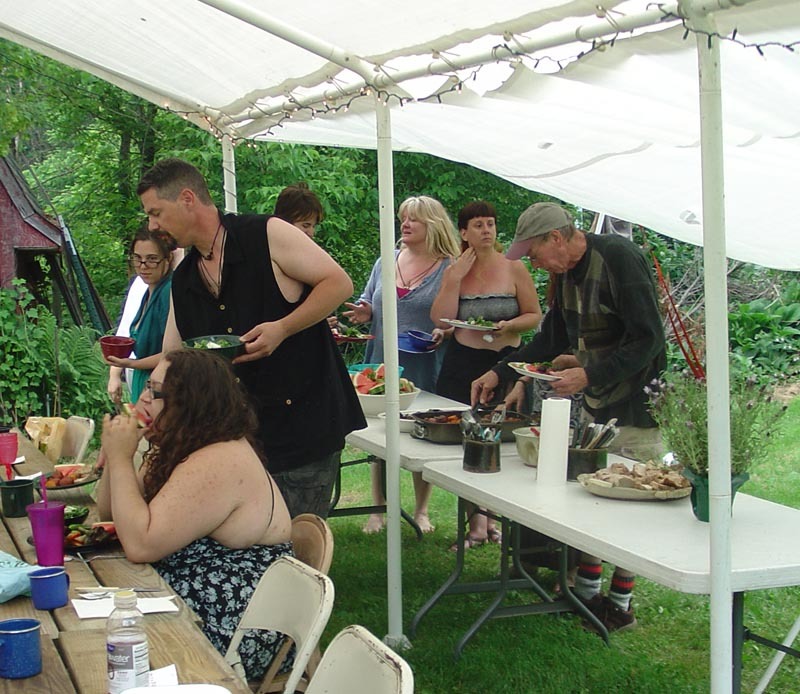 There was a lot of time spent feasting, and getting to know each other. 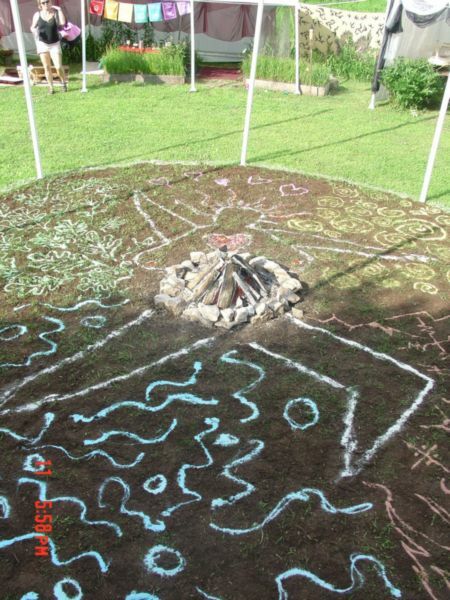 The last few days brought some intense discussions, that made everyone think about themselves. 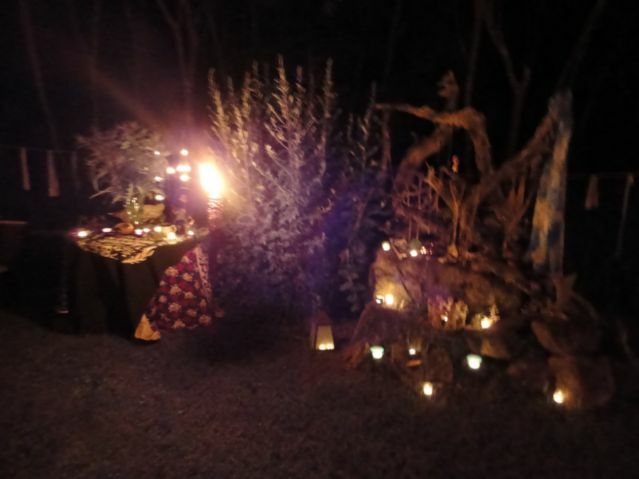 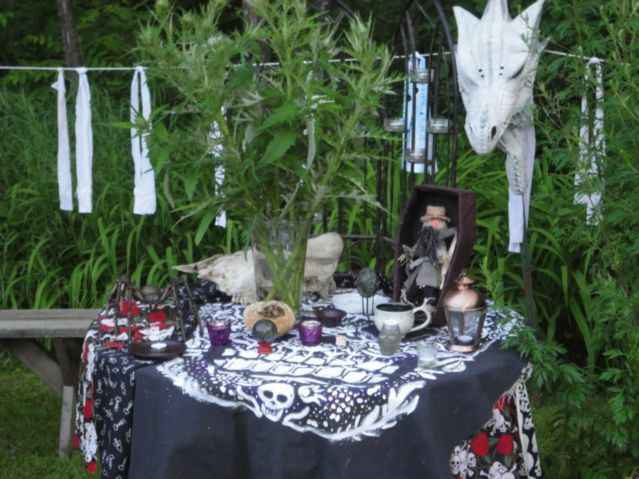 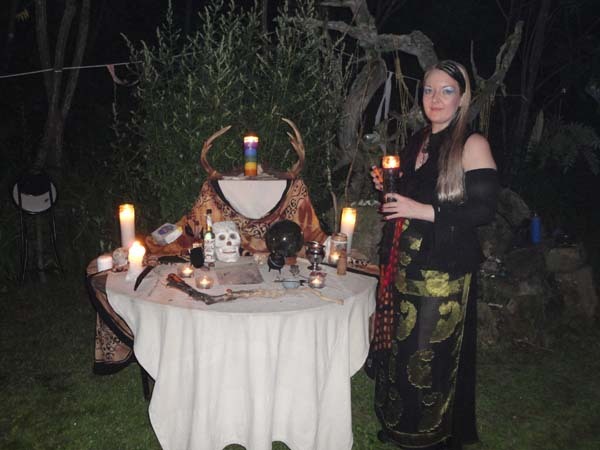 Each night has a wonderful ritual theme opening and wow, we jumped right in on Thursday night with intensity. 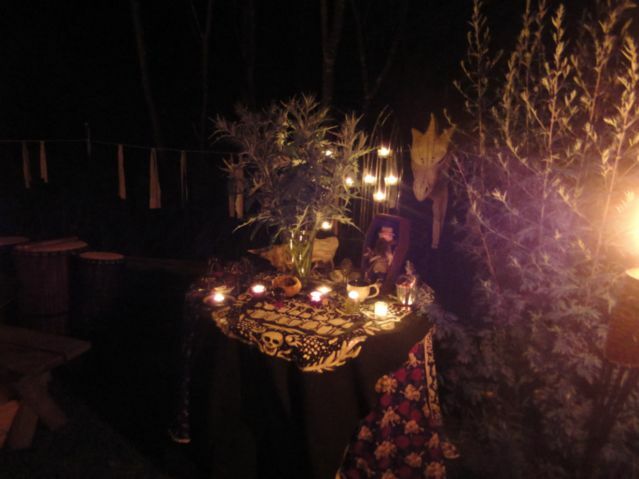 Friday was a night of great personal work, and frankly Saturday we seemed to coast accepting our blessings. 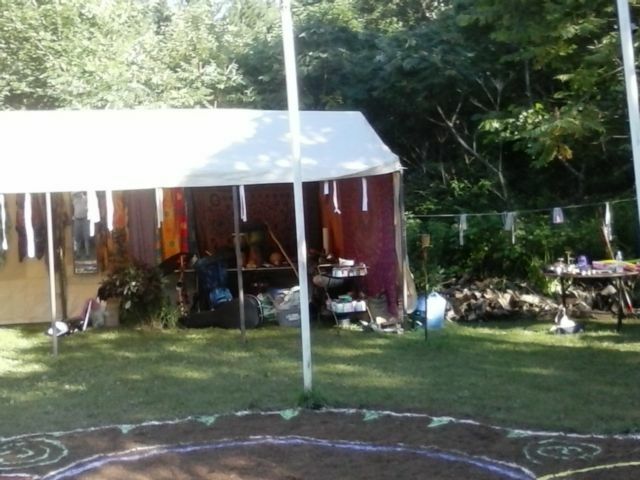 Take down went so smooth, everyone left with a sense of gratitude! 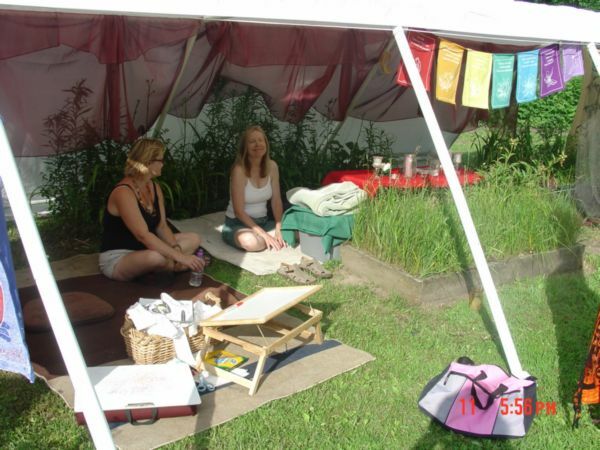 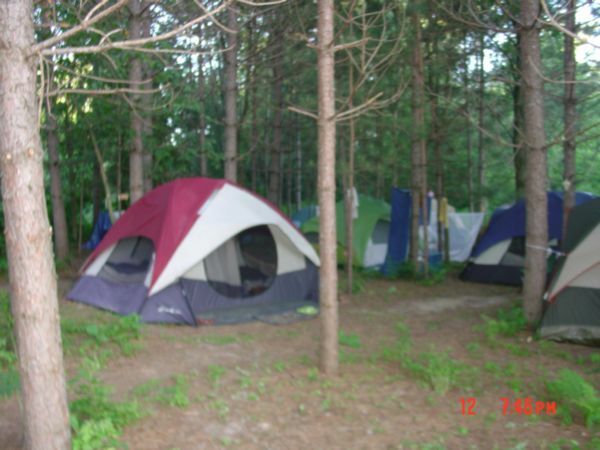 In 2011, the Village was built on temperate Wednesday, and by Thursday the typical July Heat was full on! 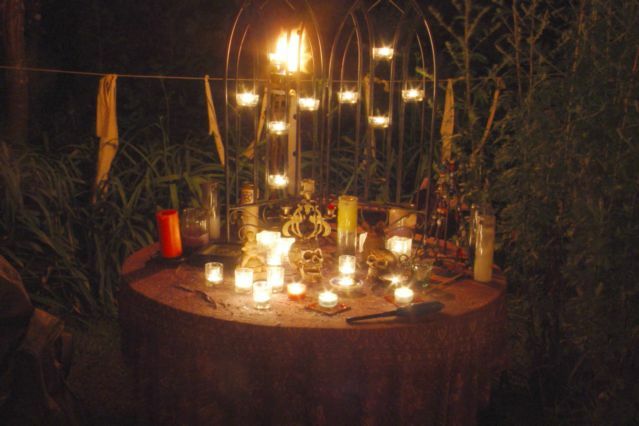 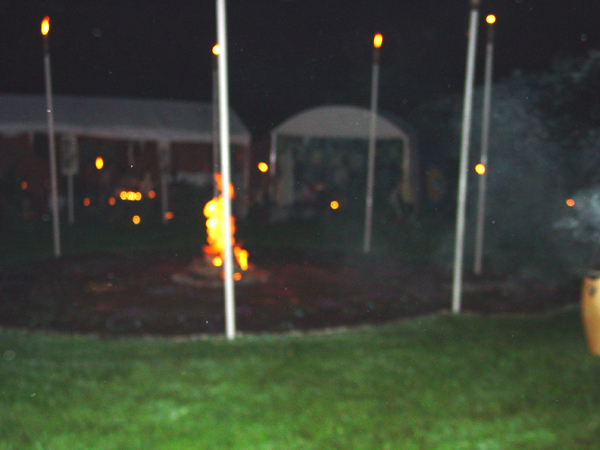 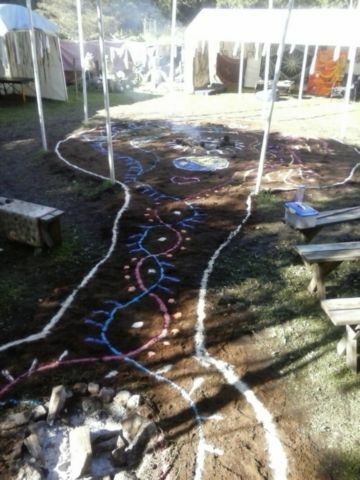 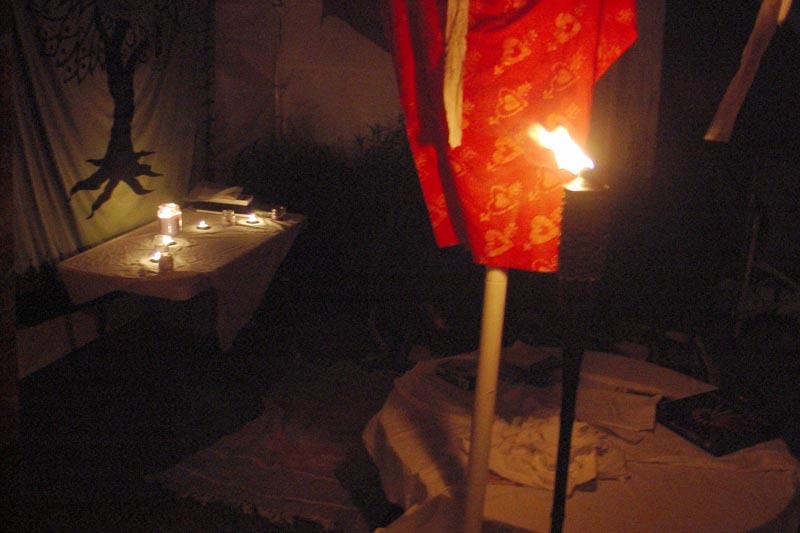 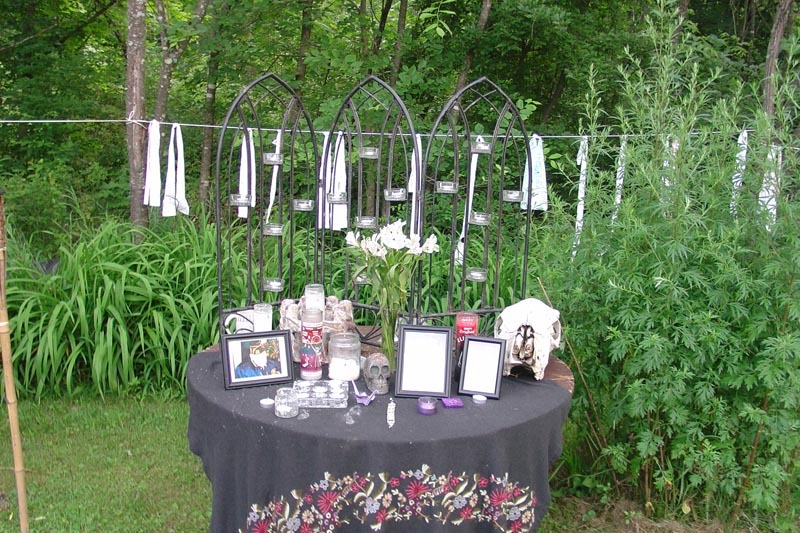 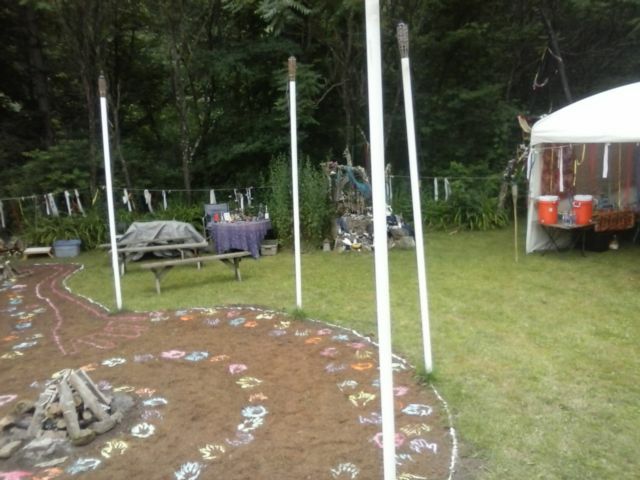 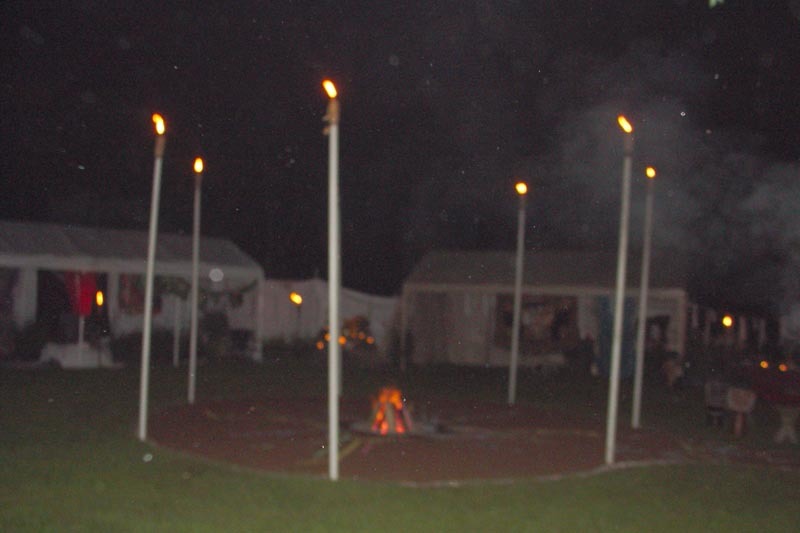 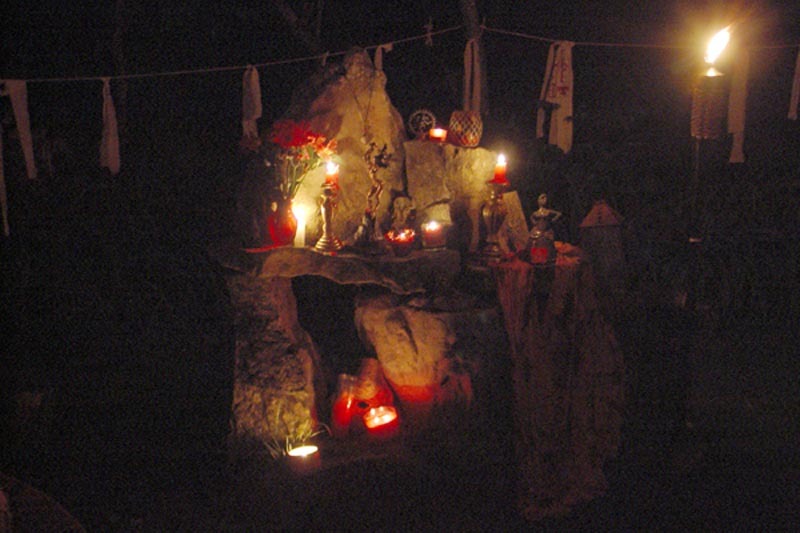 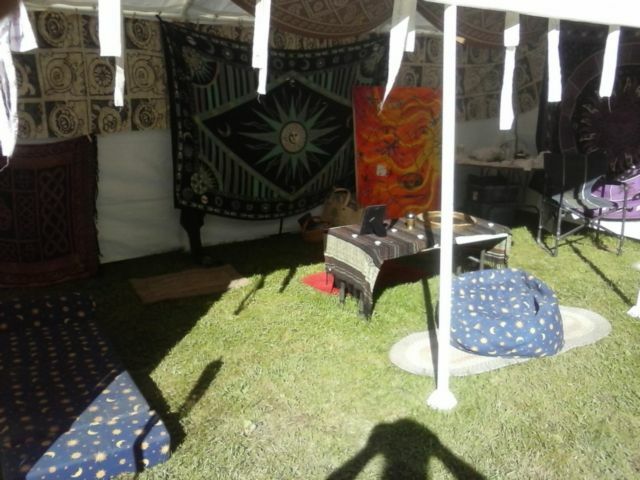 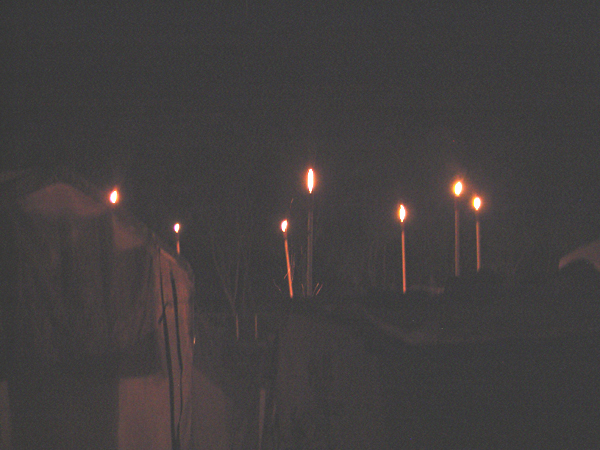 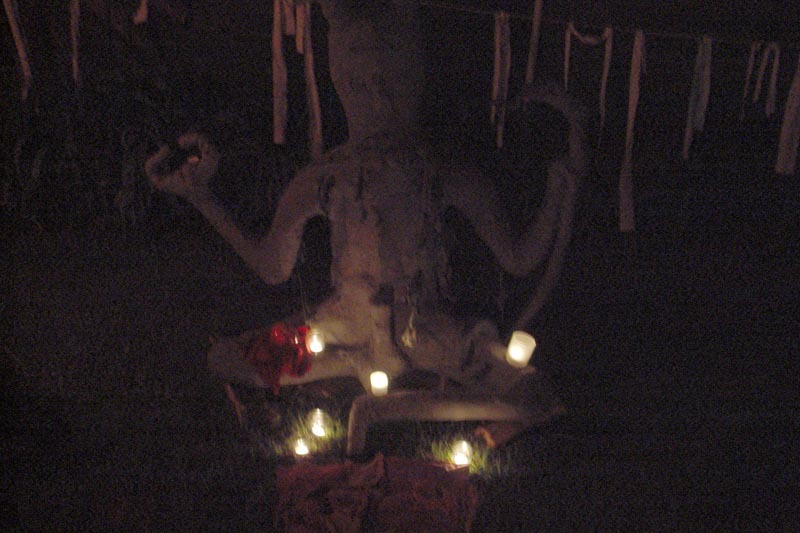 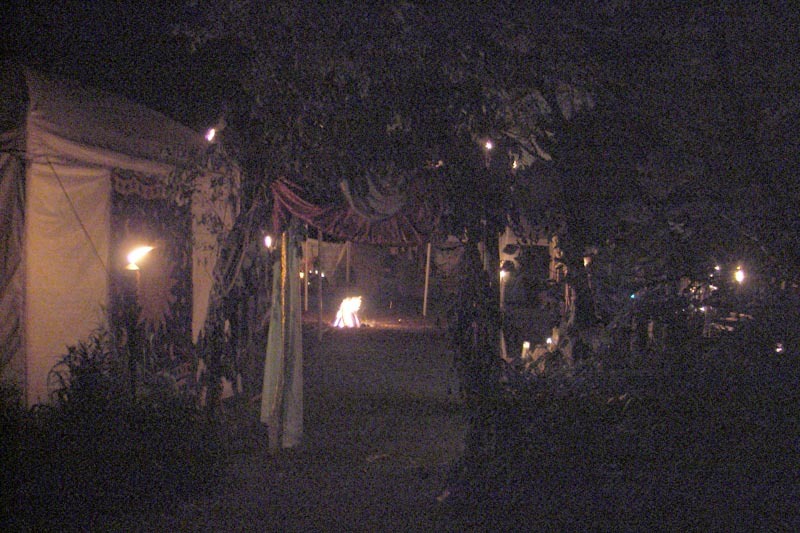 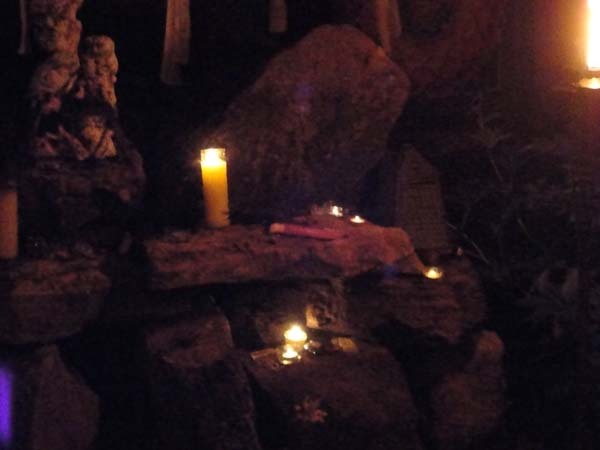 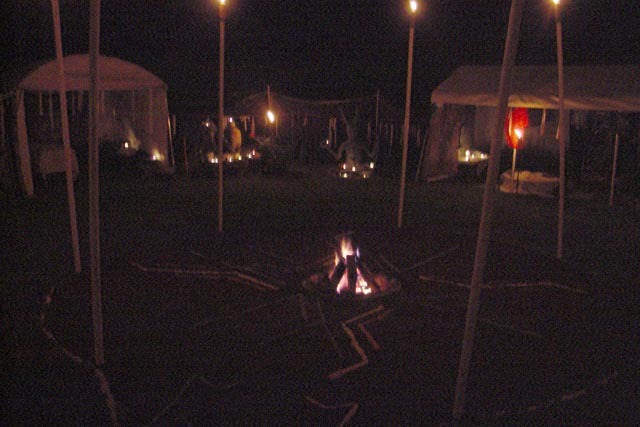 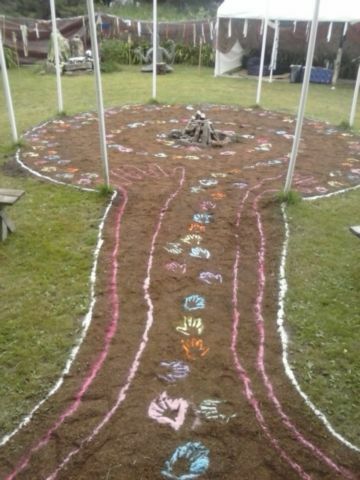 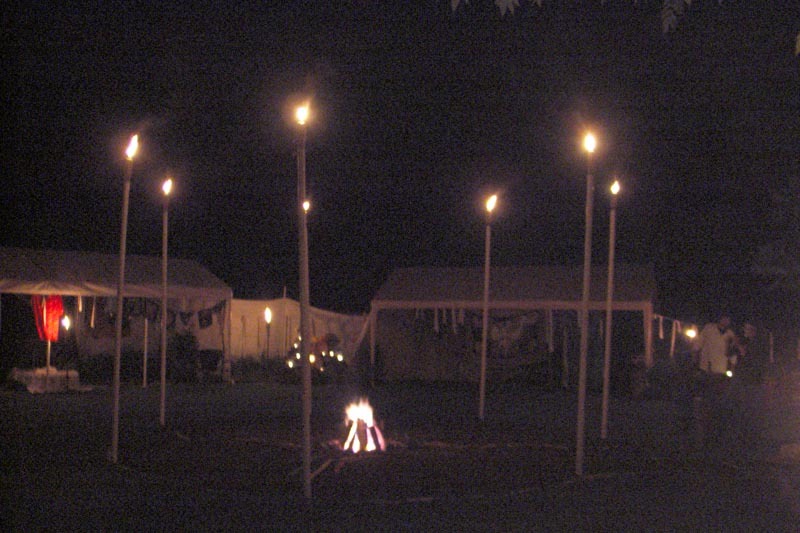 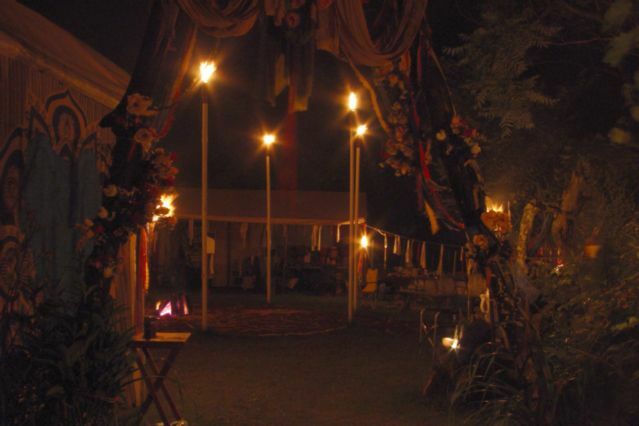 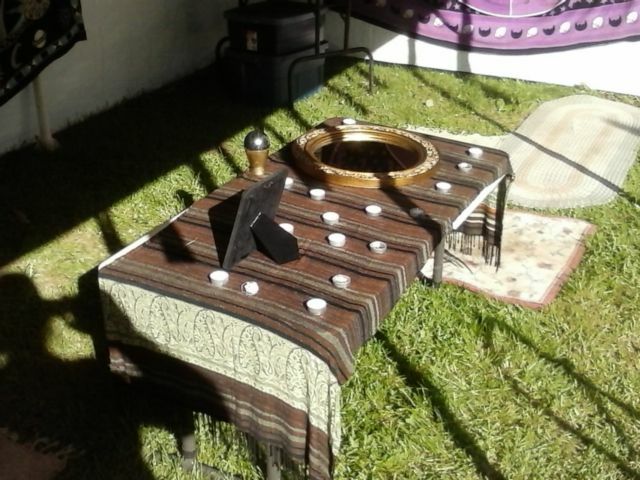 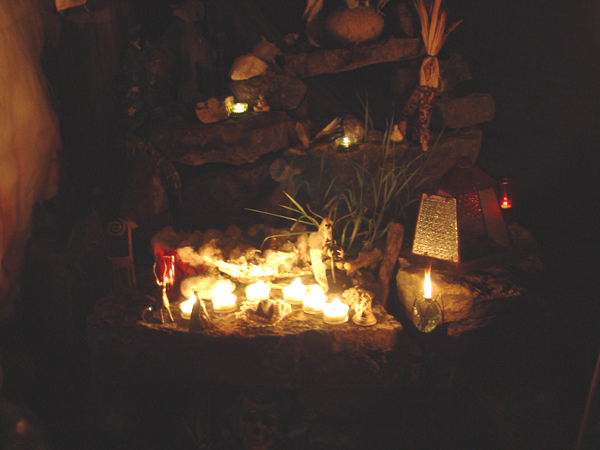 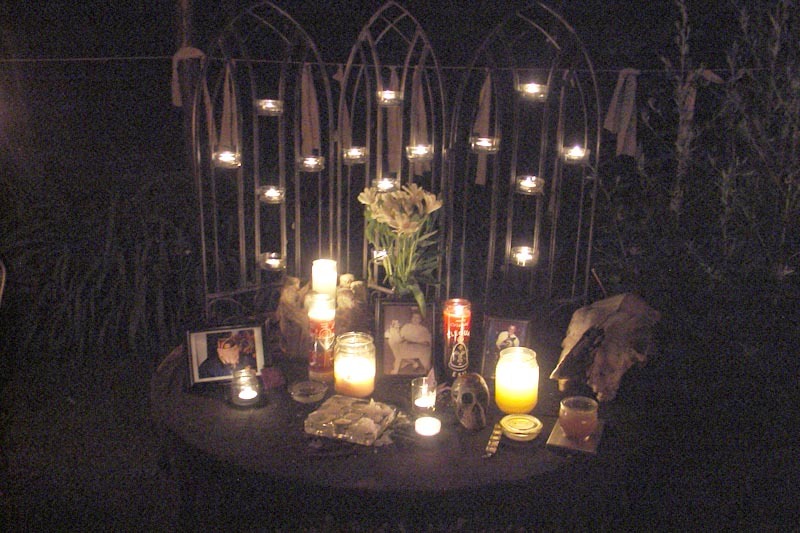 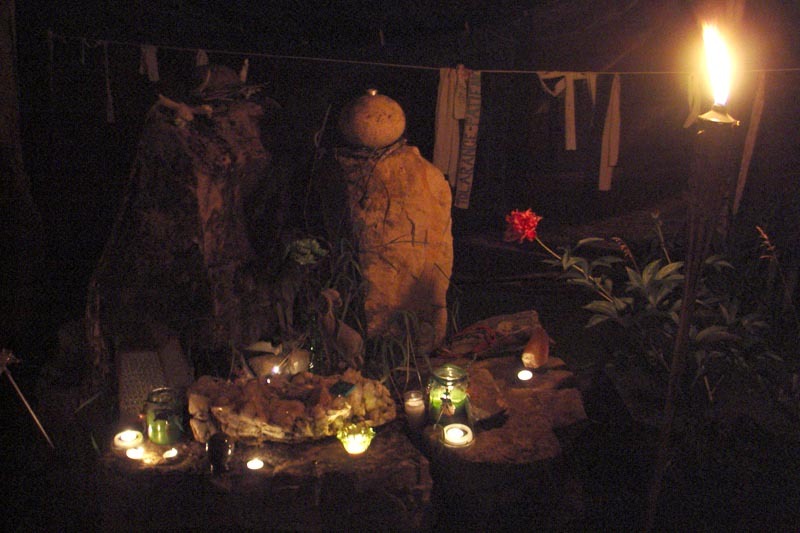 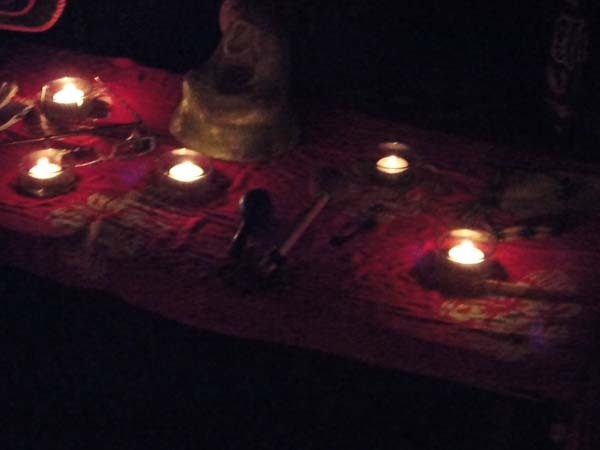 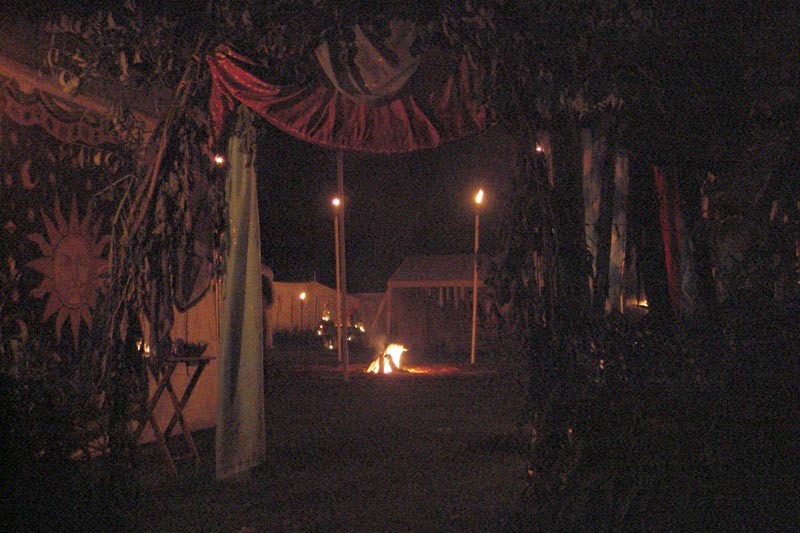 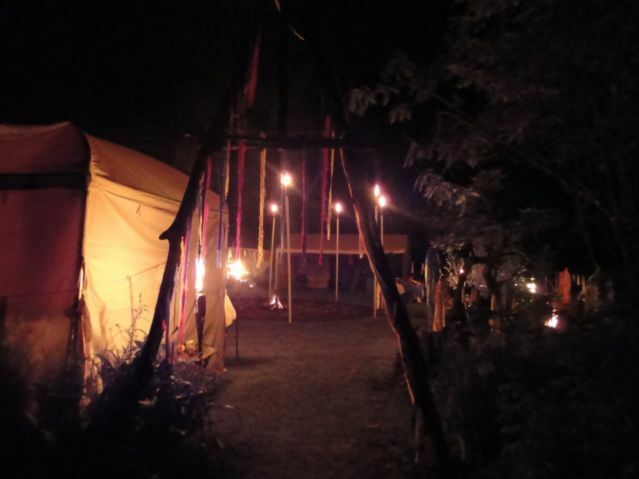 We had a beautiful opening ritual lighting the circle, and a fairly mellow first night as folks found their way. 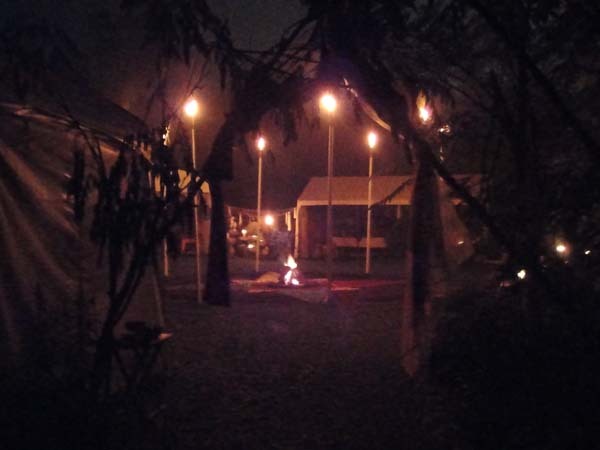 Friday night was a night of intense work and we greeted the dawn in an intense cleansing downpour. 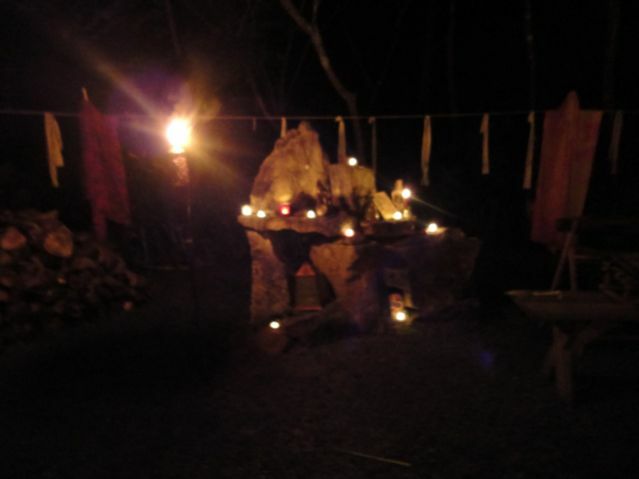 Saturday, we spent the afternoon drying our crucible, but by dark all was ready. 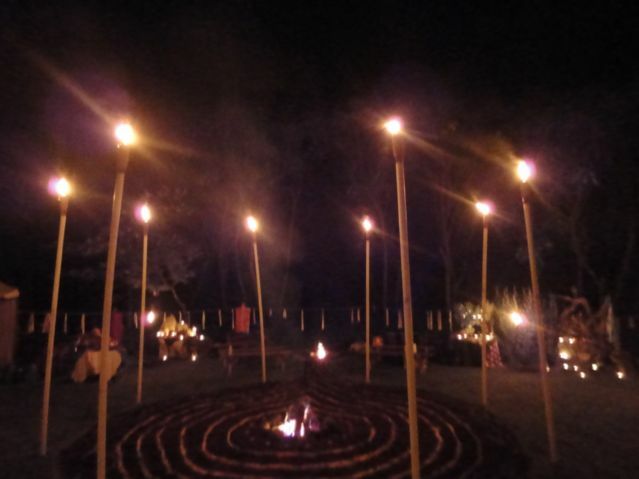 A final night of strength and joy, and we took time to acknowledge each other and our work at dawn. 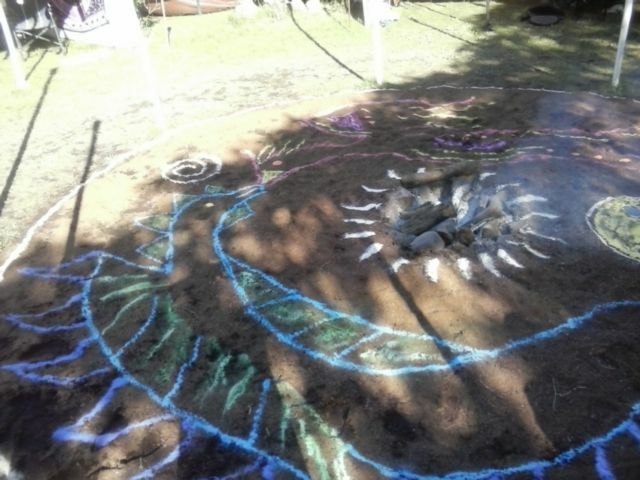 By 8am the Sacred Fire Circle was packed up, and another rich breakfast rewarded us. 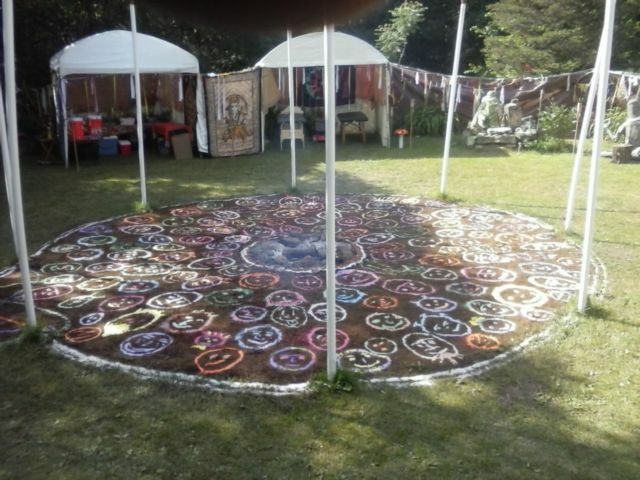 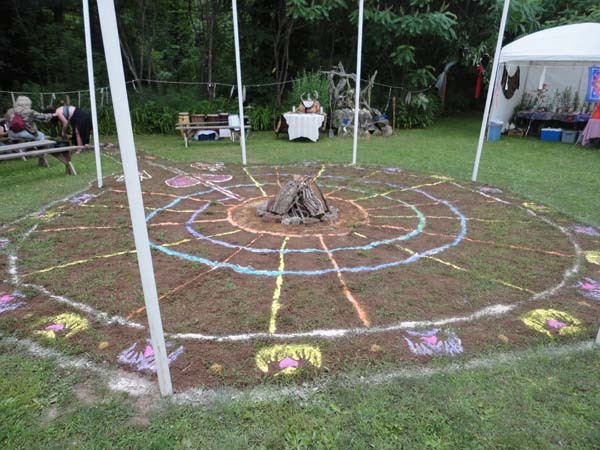 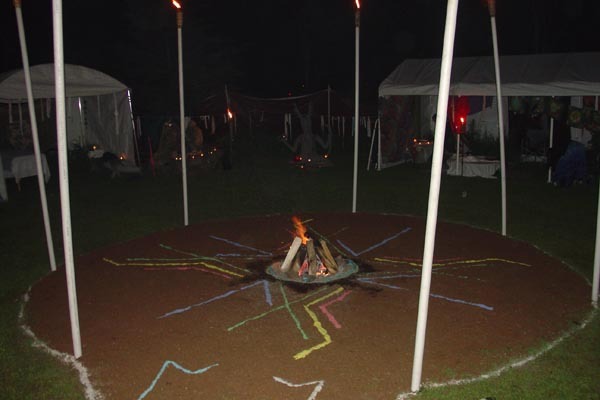 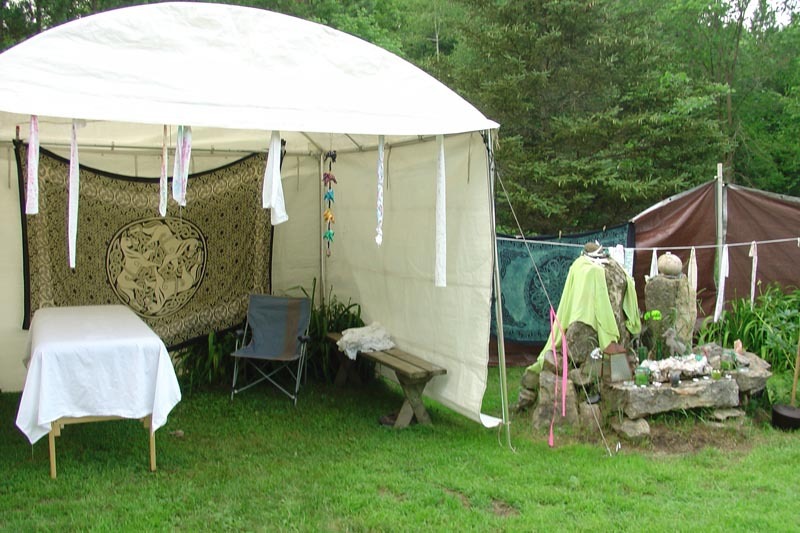 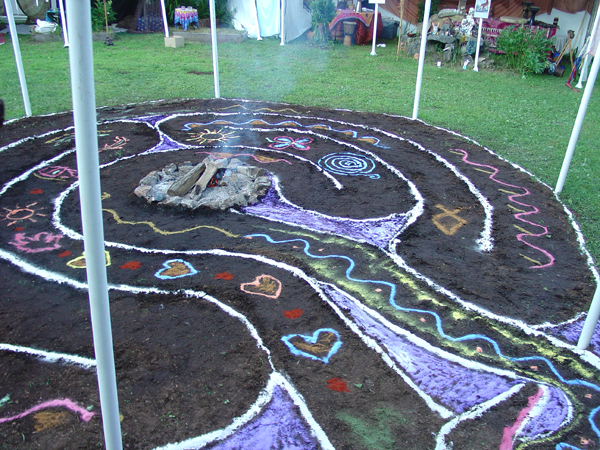 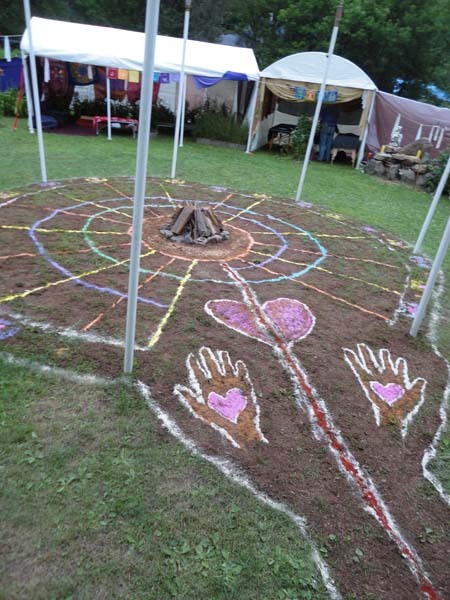 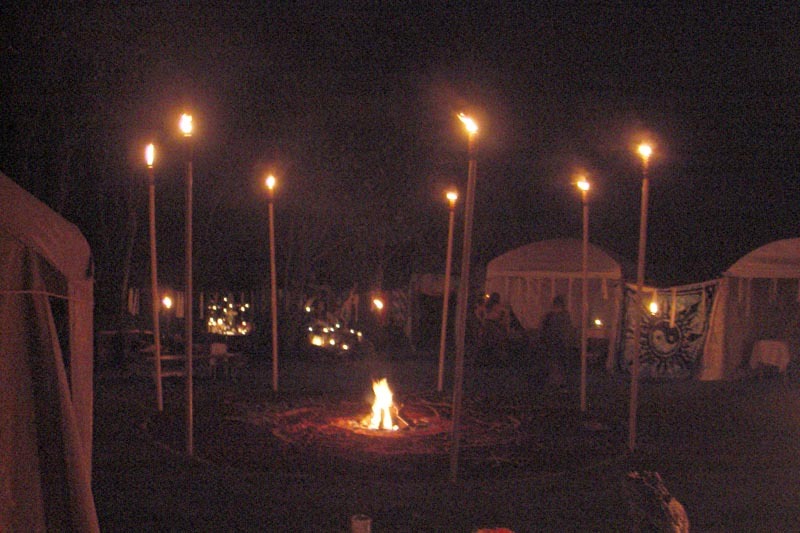 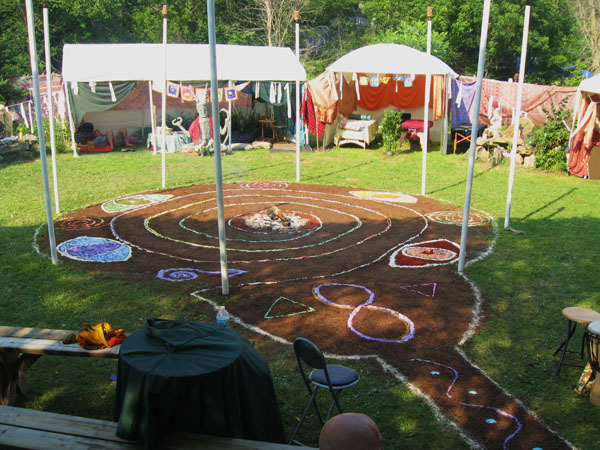 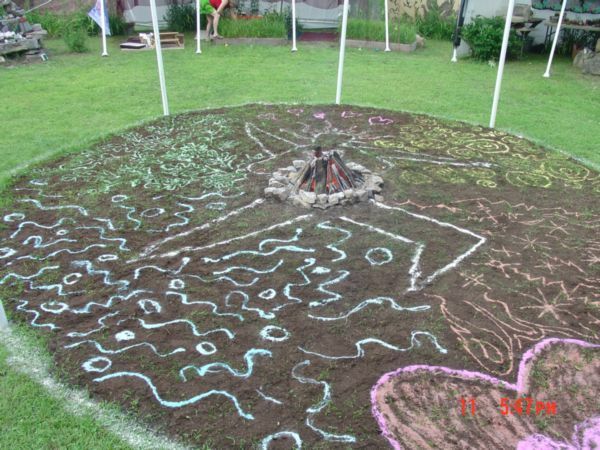 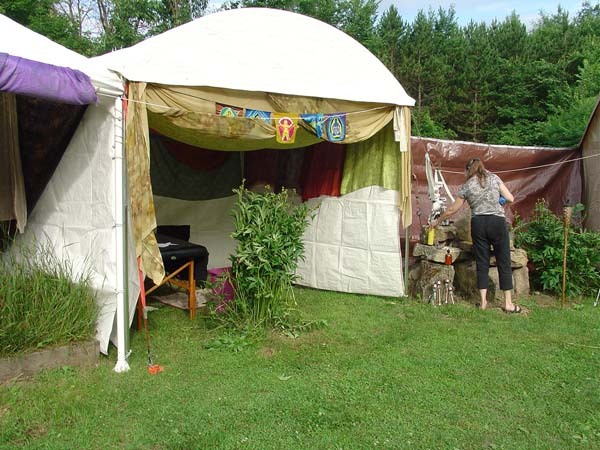 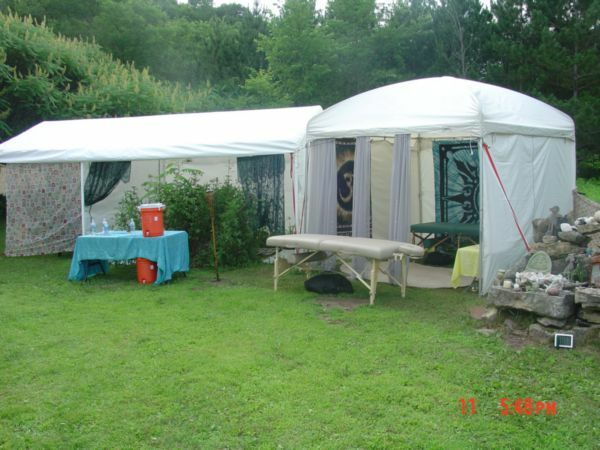 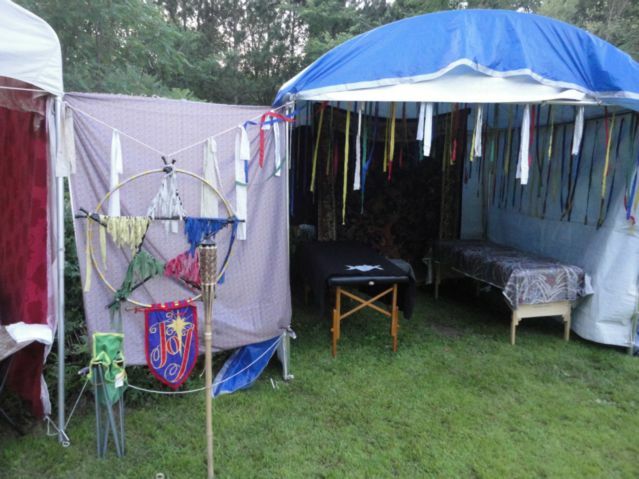 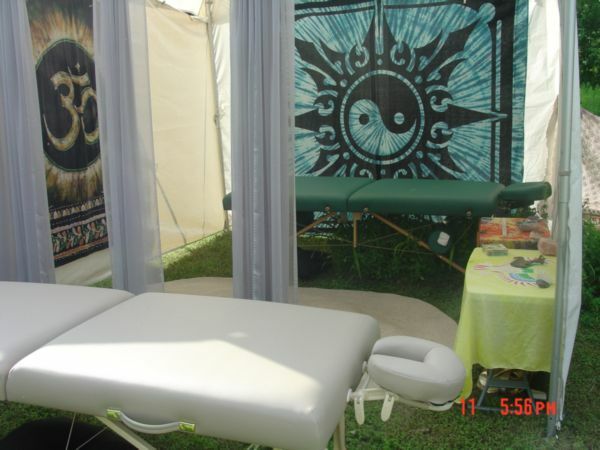 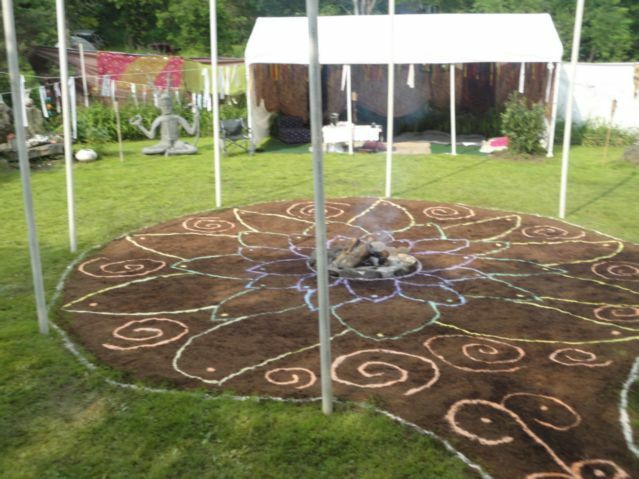 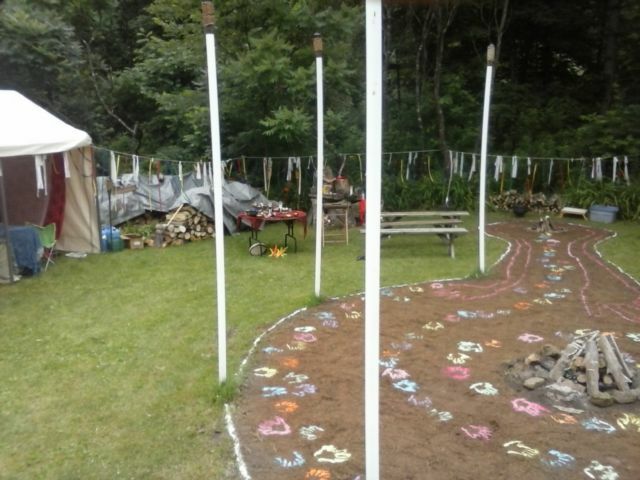 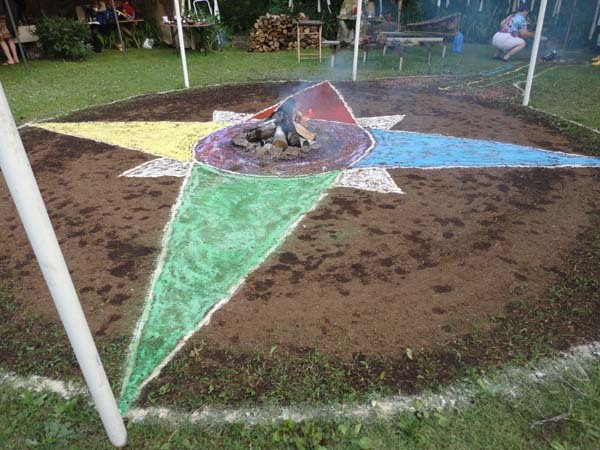 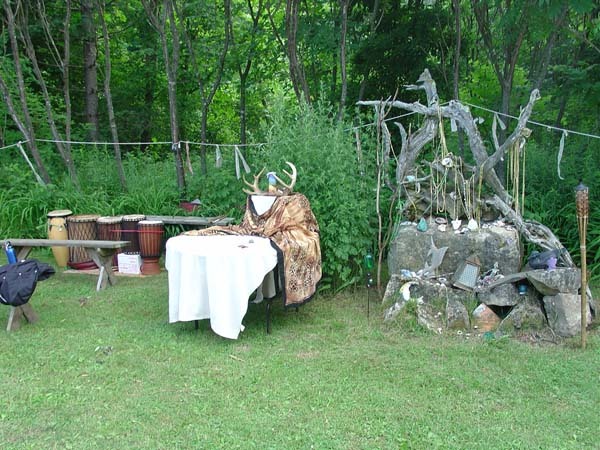 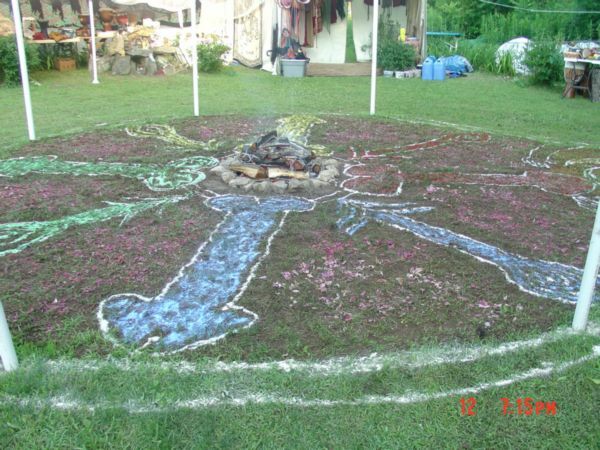 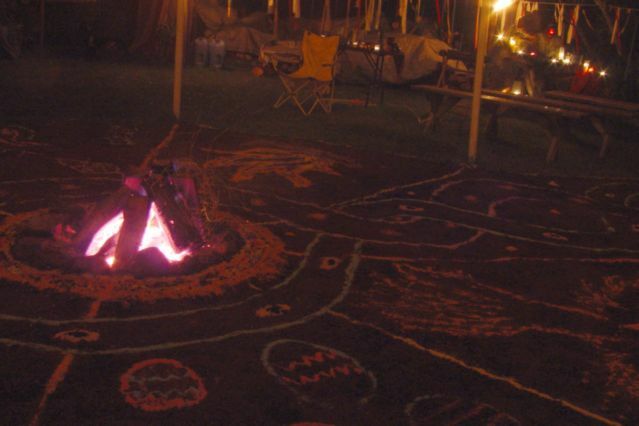 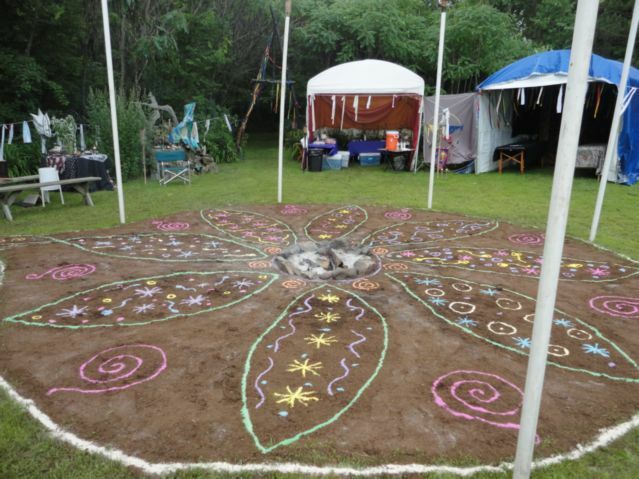 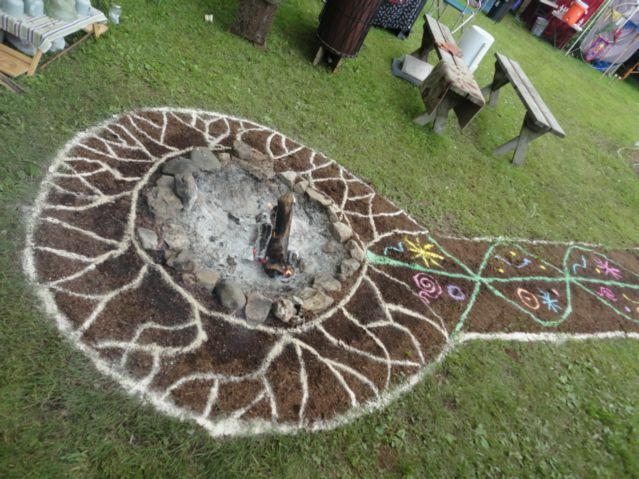 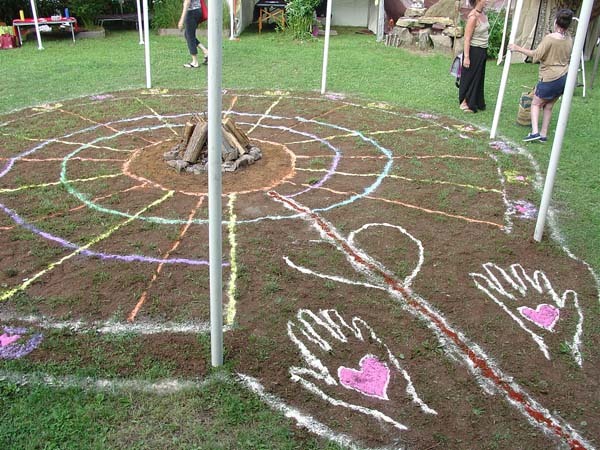 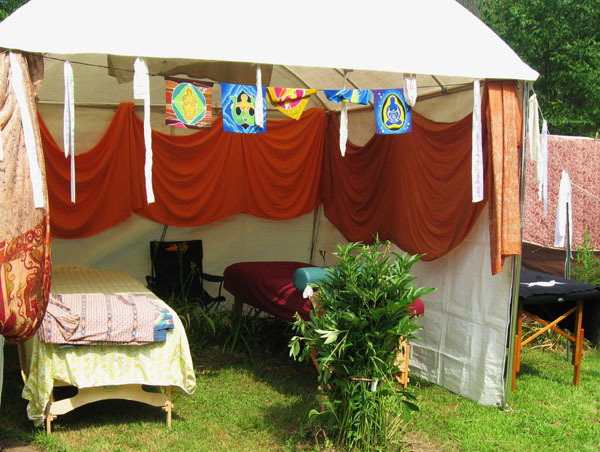 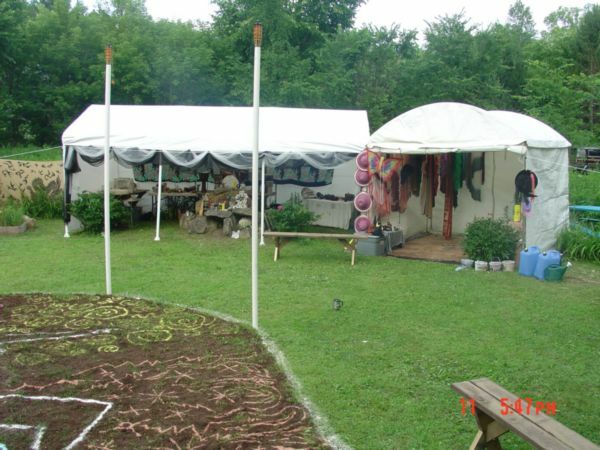 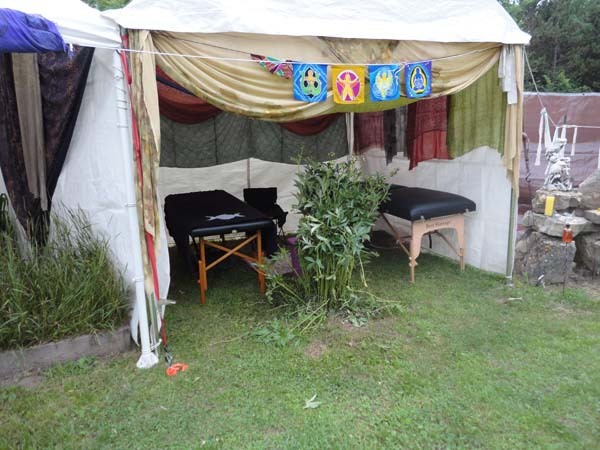 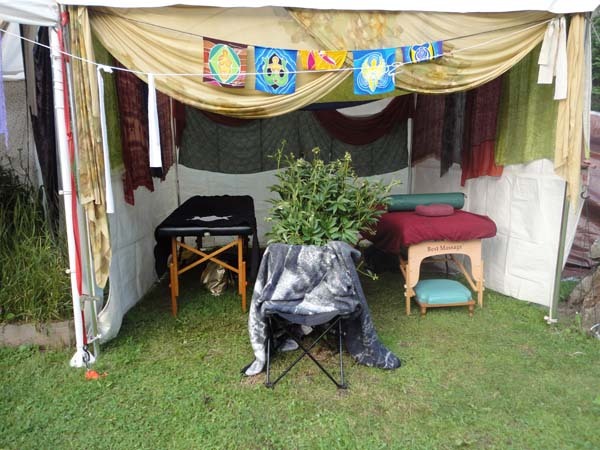 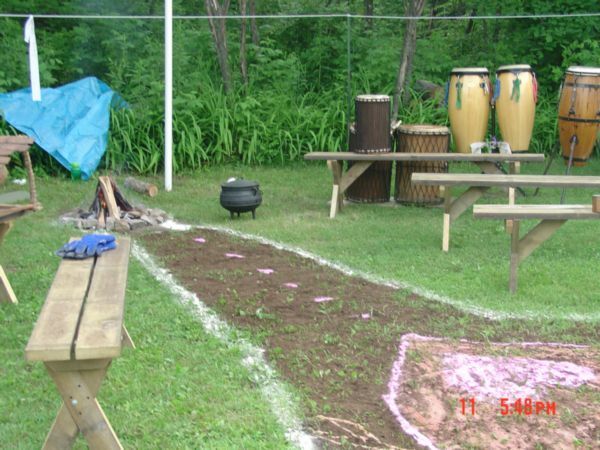 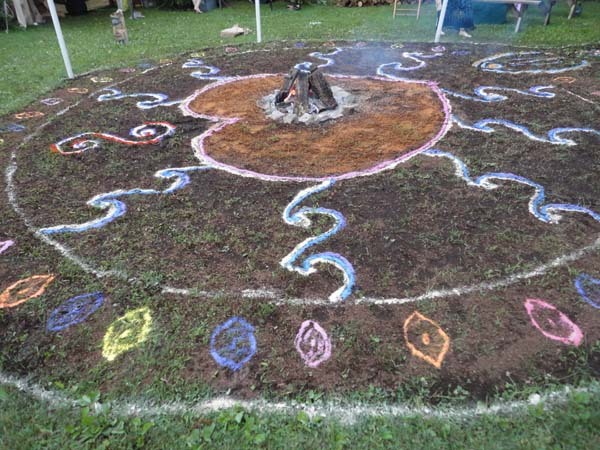 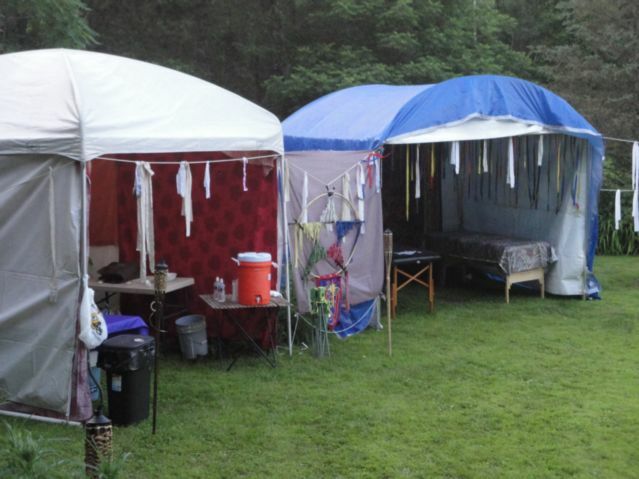 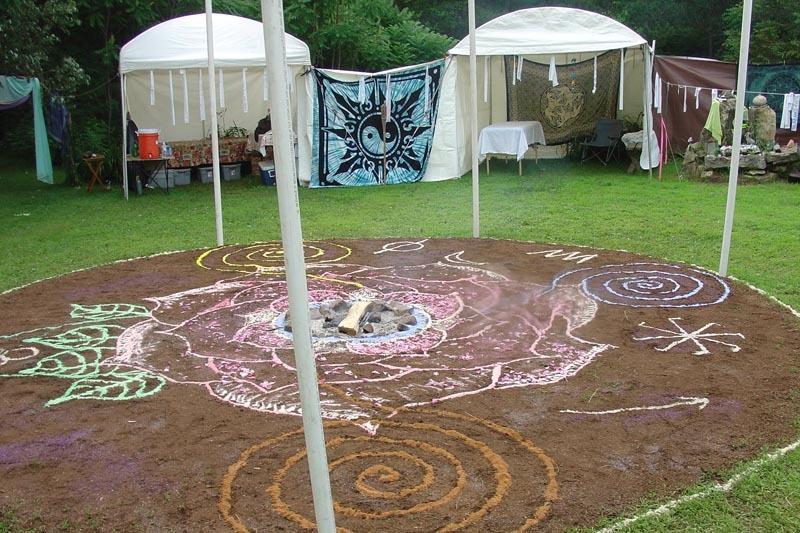 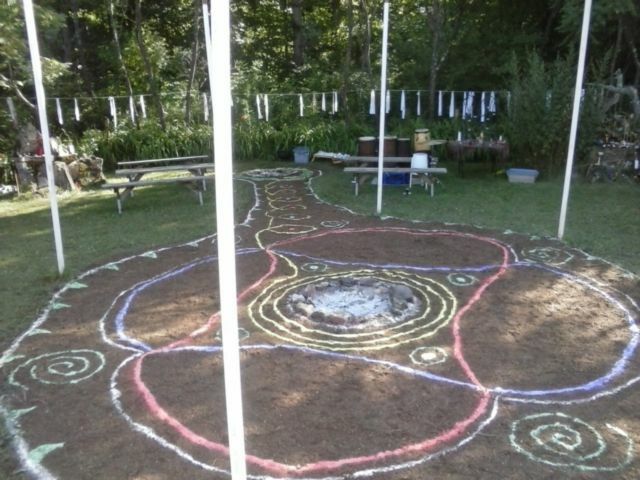 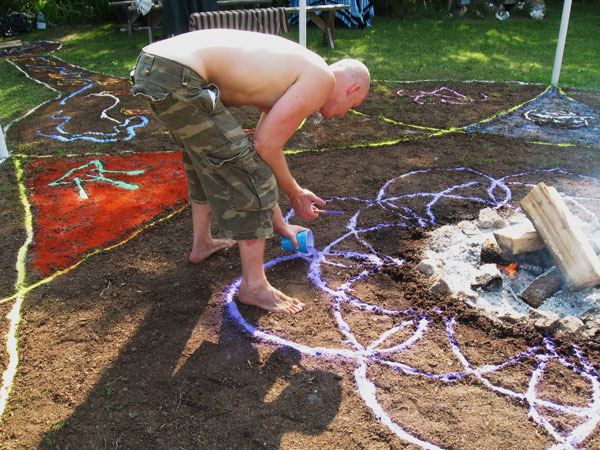 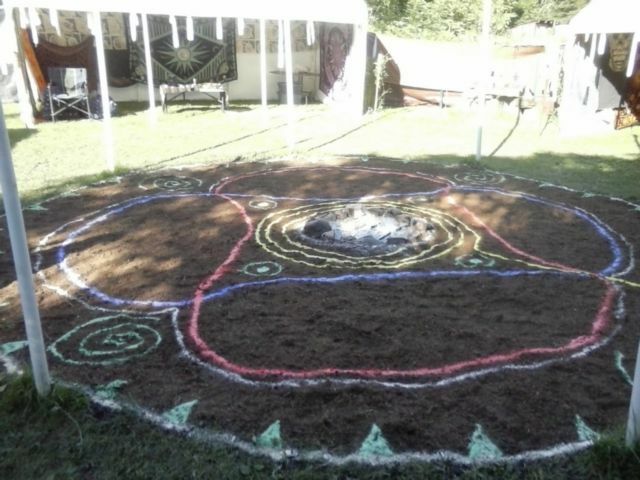 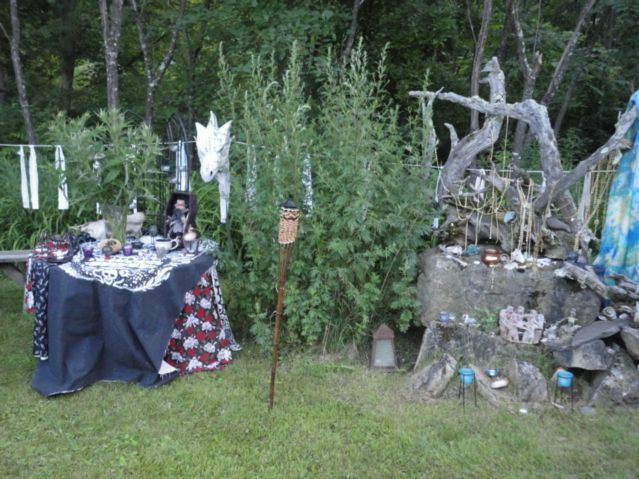 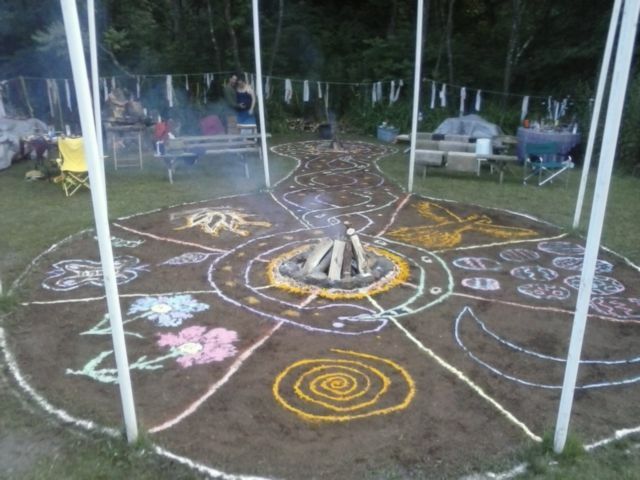 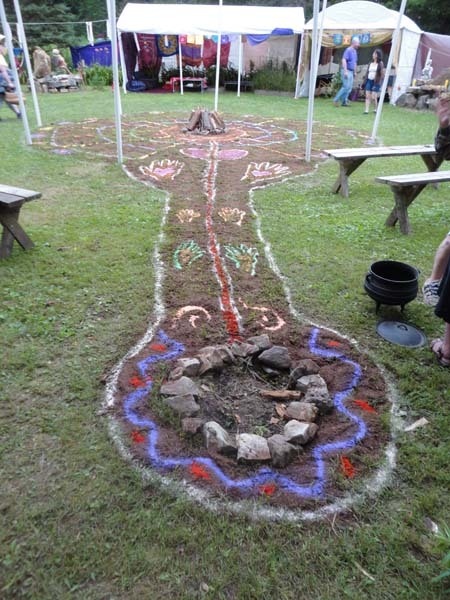 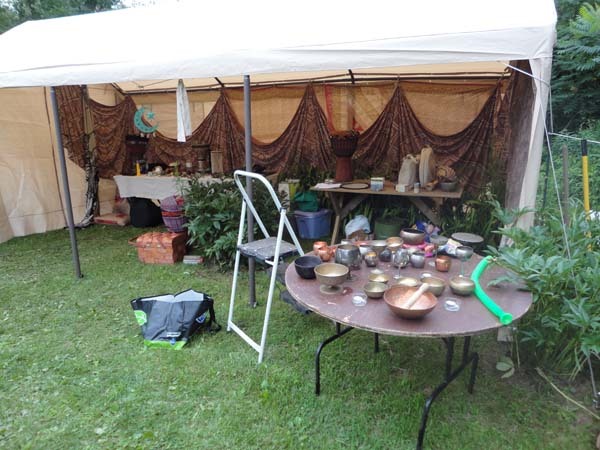 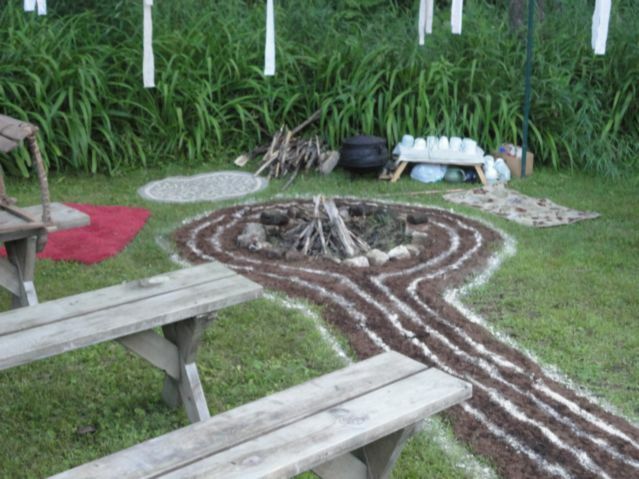 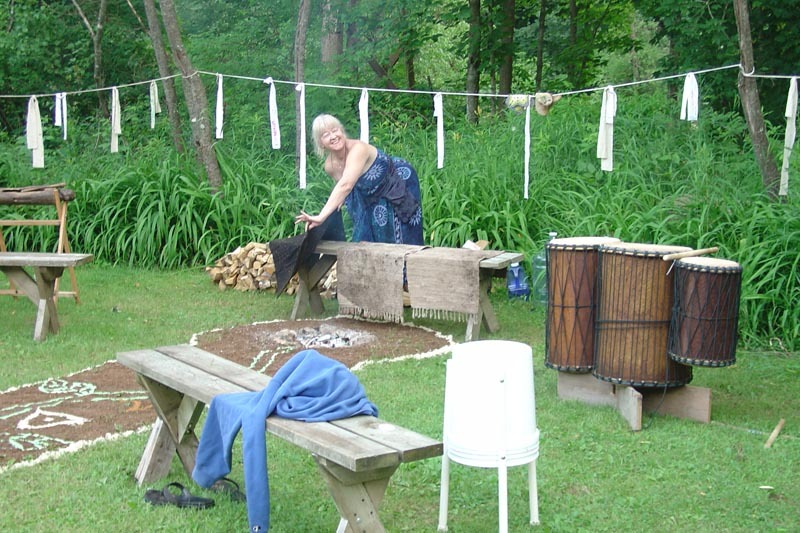 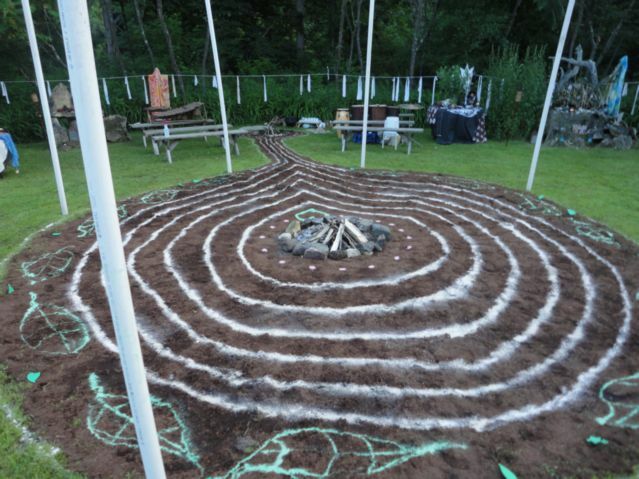 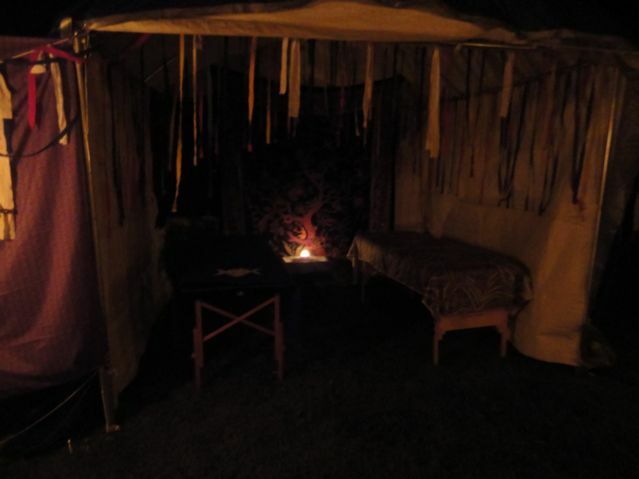 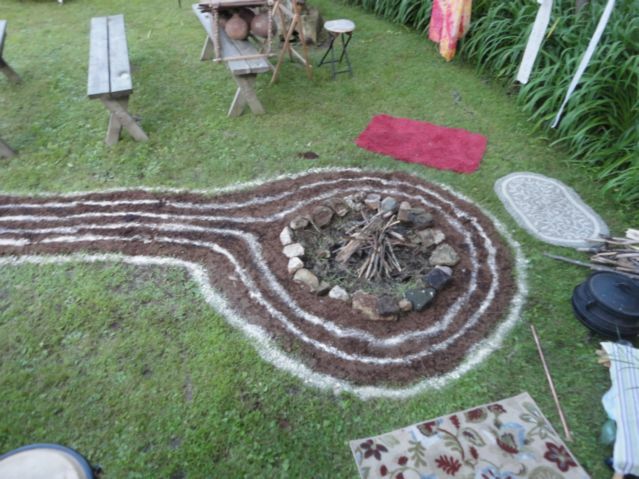 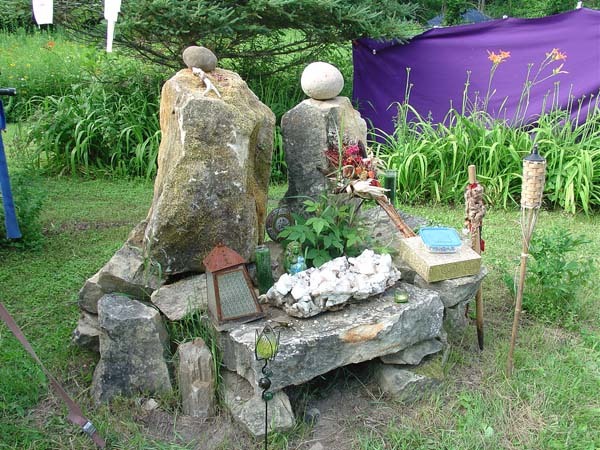 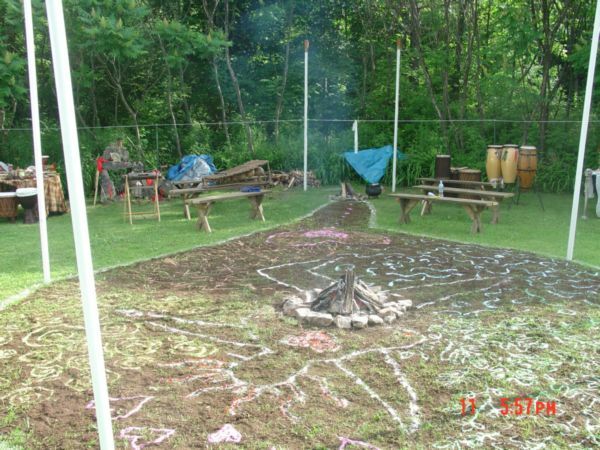 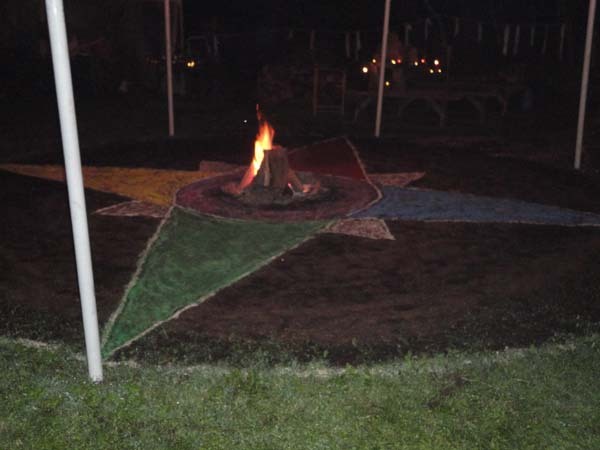 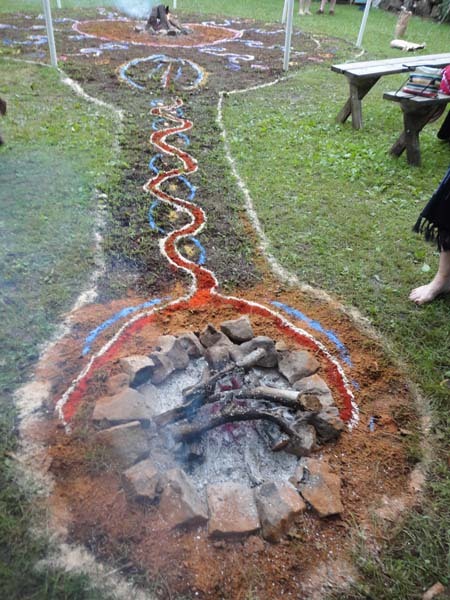 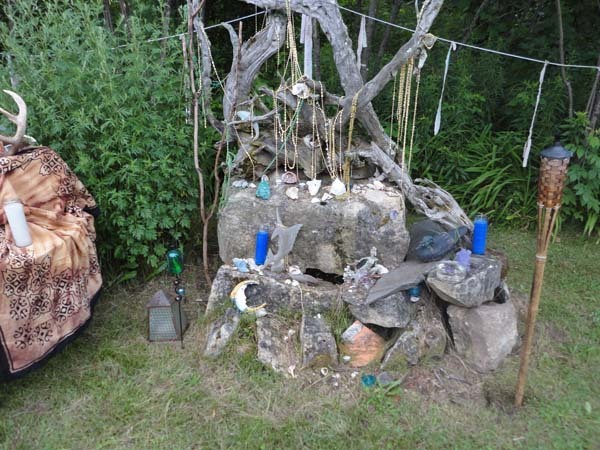 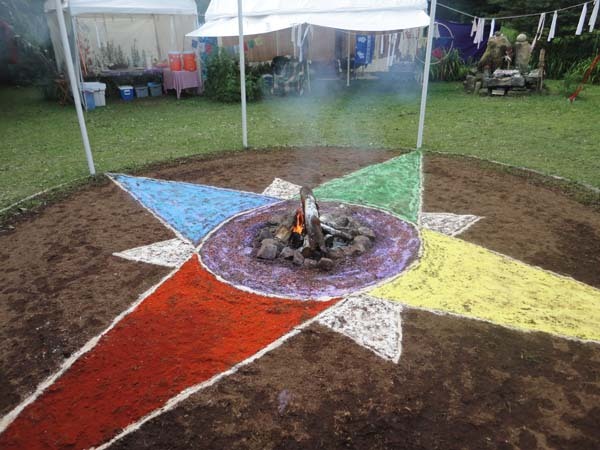 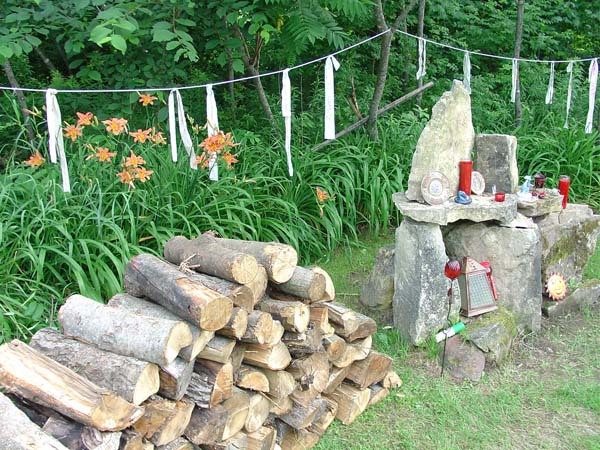 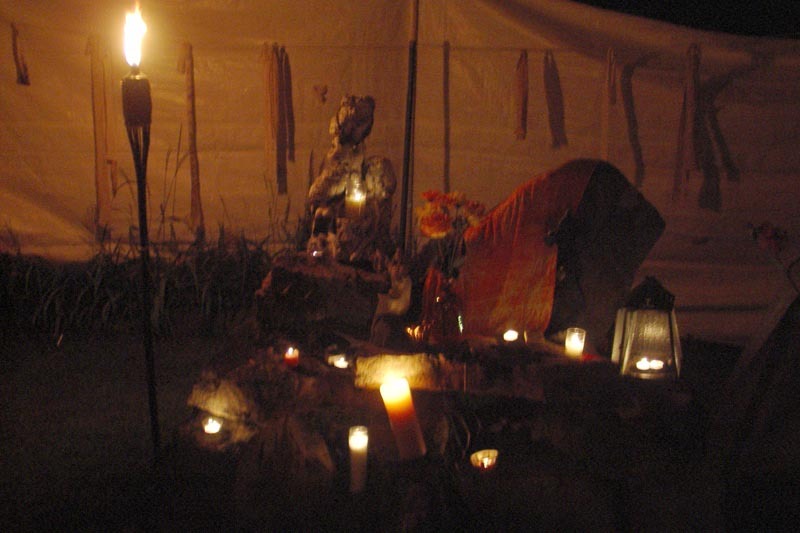 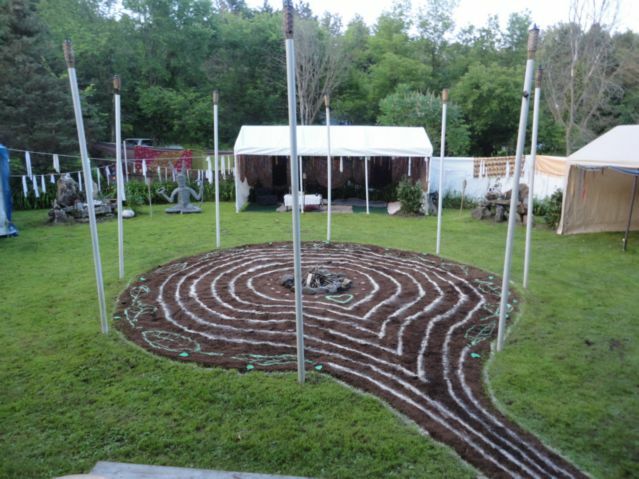 The fire circle is perfect for North Wisconsin July, you sleep through most of the heat, have tents when it rains, and have beautiful nights around the fire. 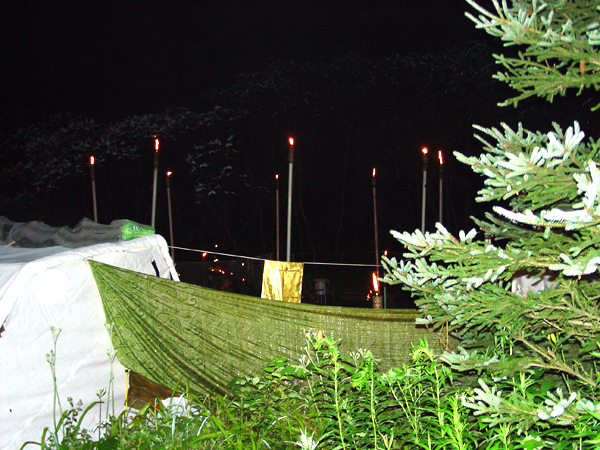 A huge storm struck on Saturday as we waited to begin at midnight. 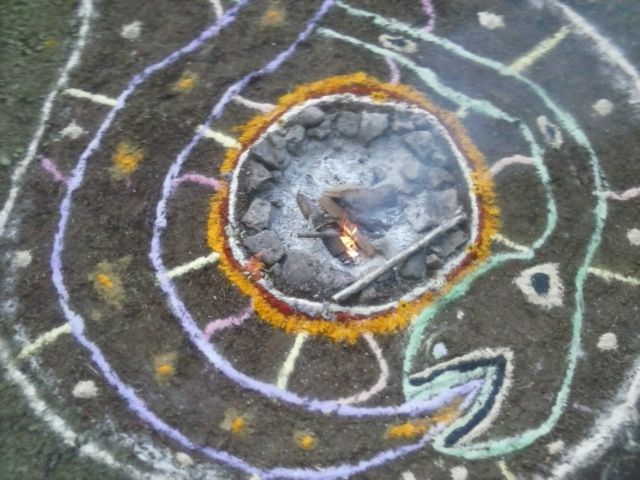 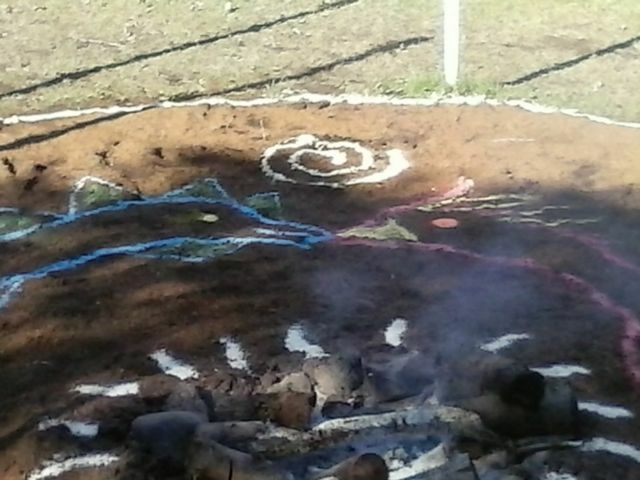 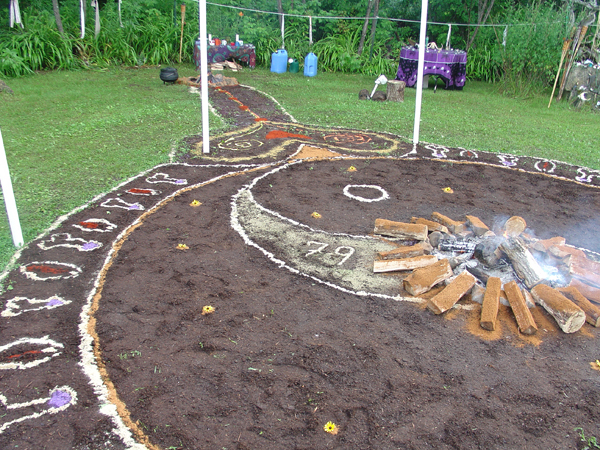 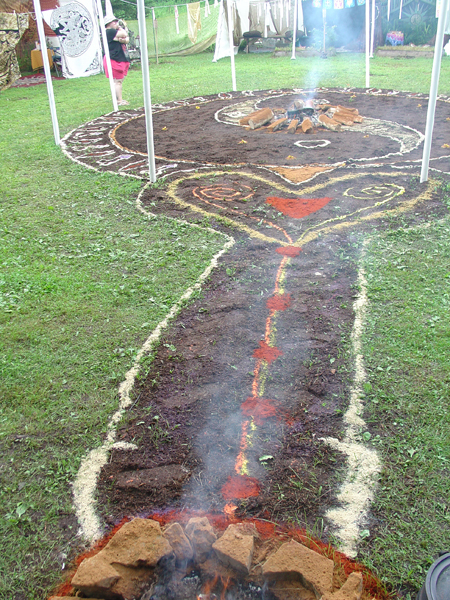 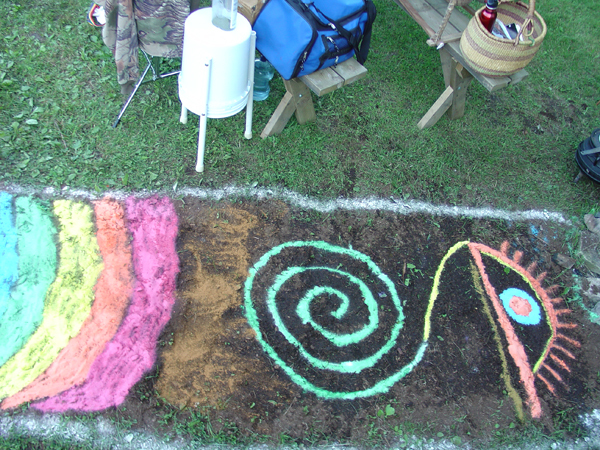 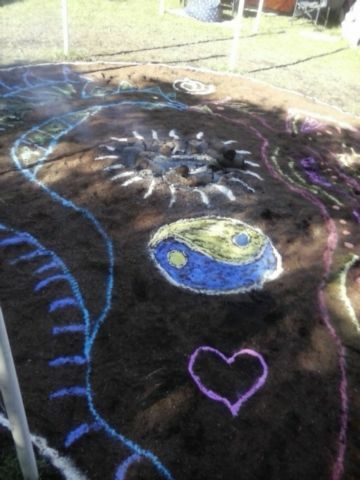 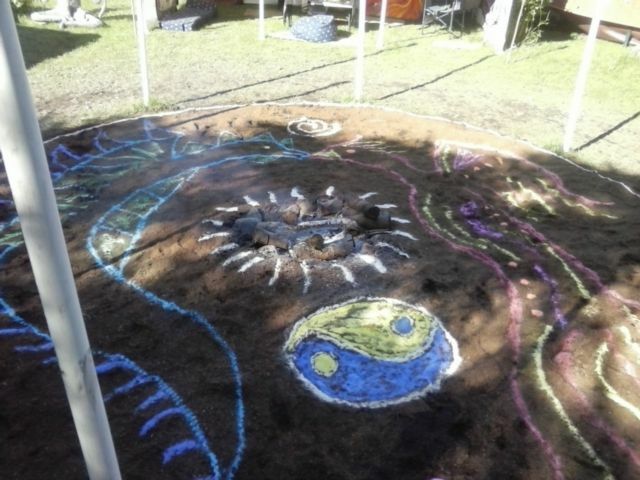 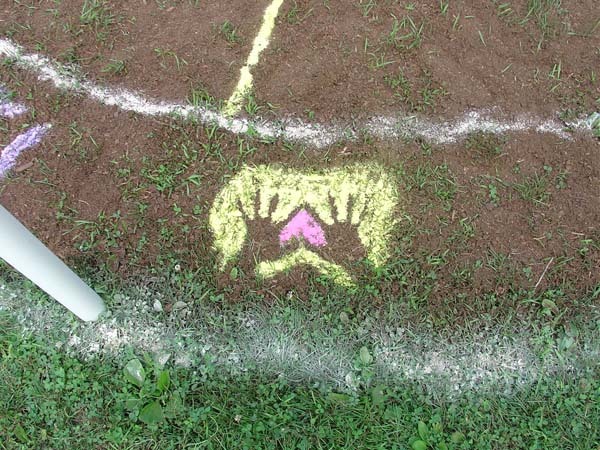 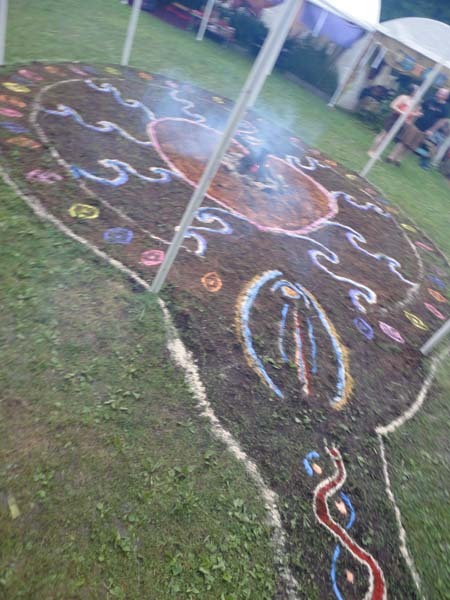 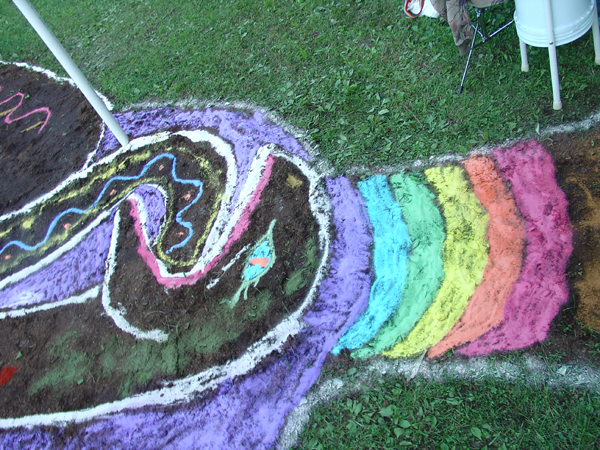 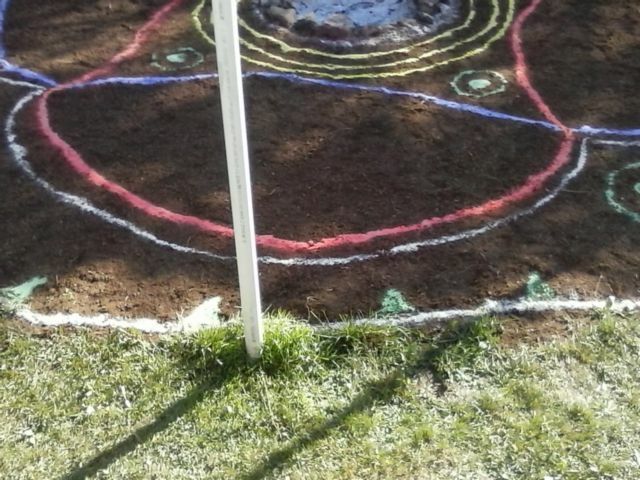 This last ying/yang rangoli was mostly obliterated and the circle turned to coffee grounds. 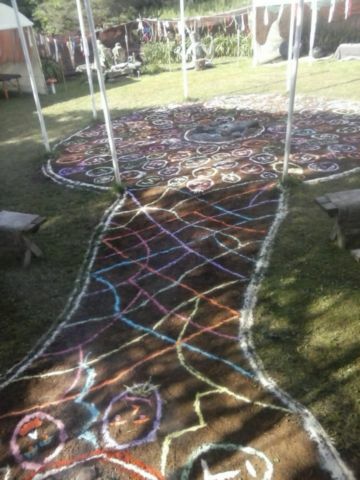 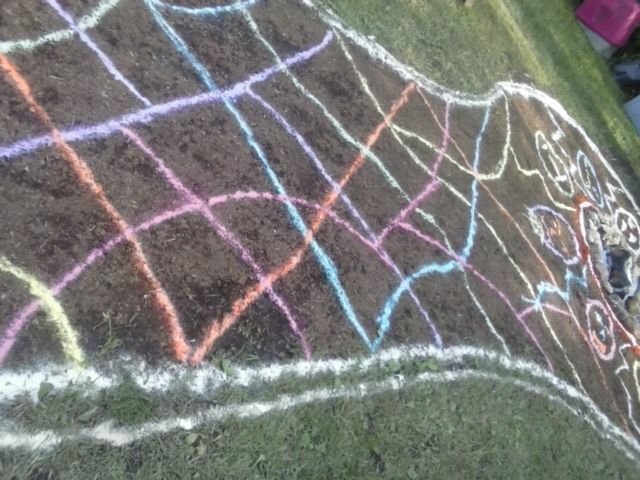 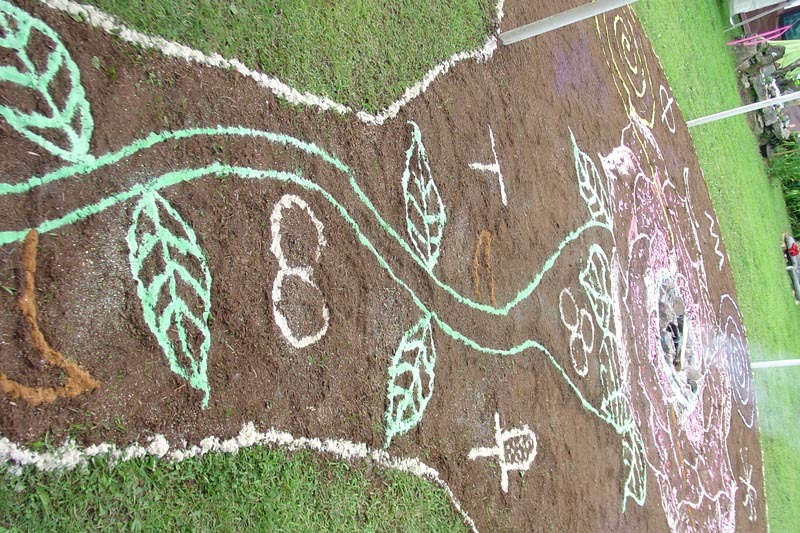 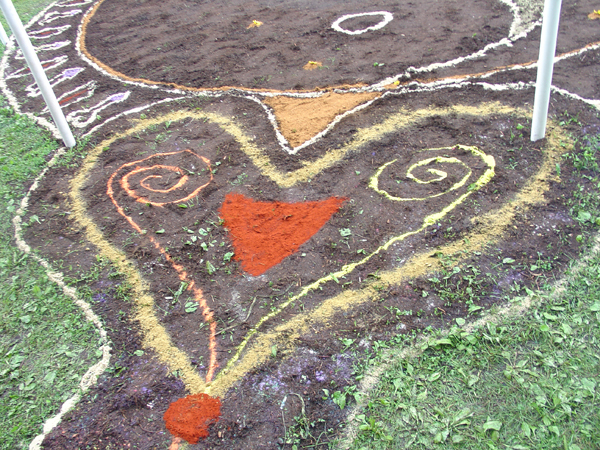 We carried forth the rangoli image through our feet and and minds and danced all night!